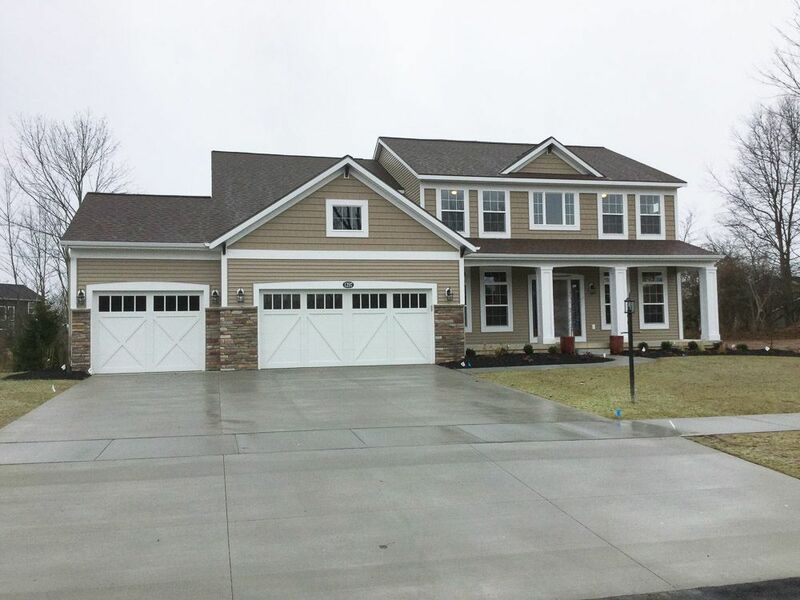 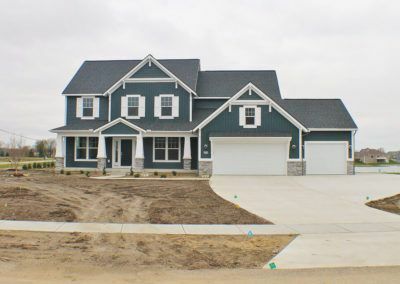 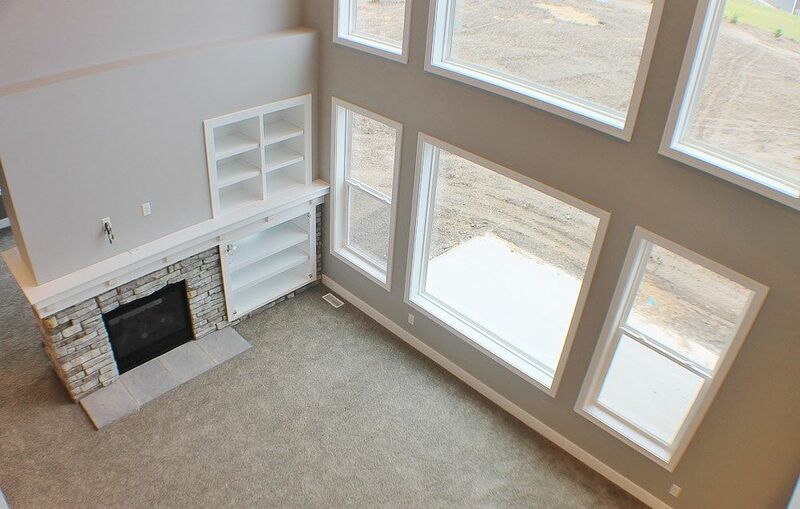 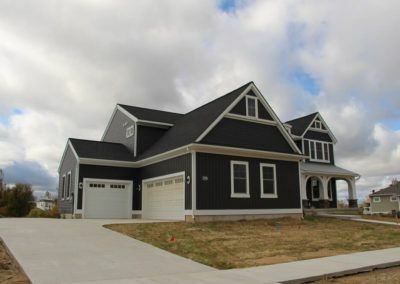 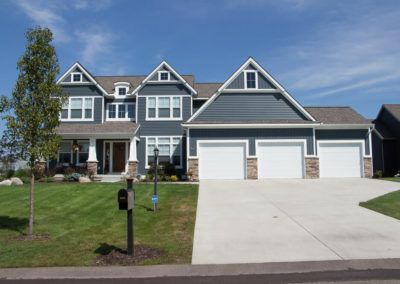 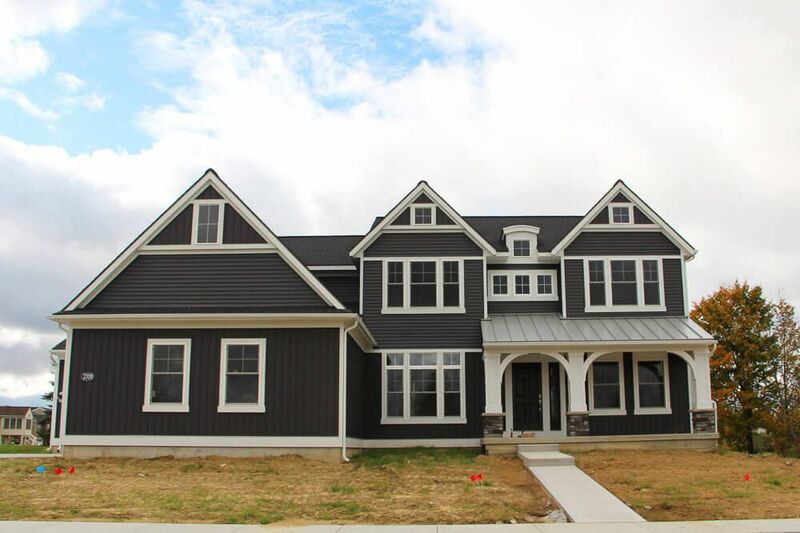 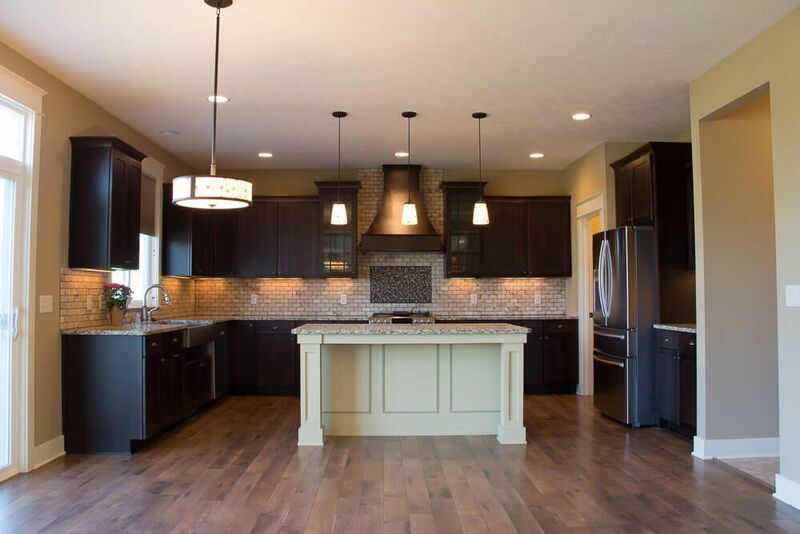 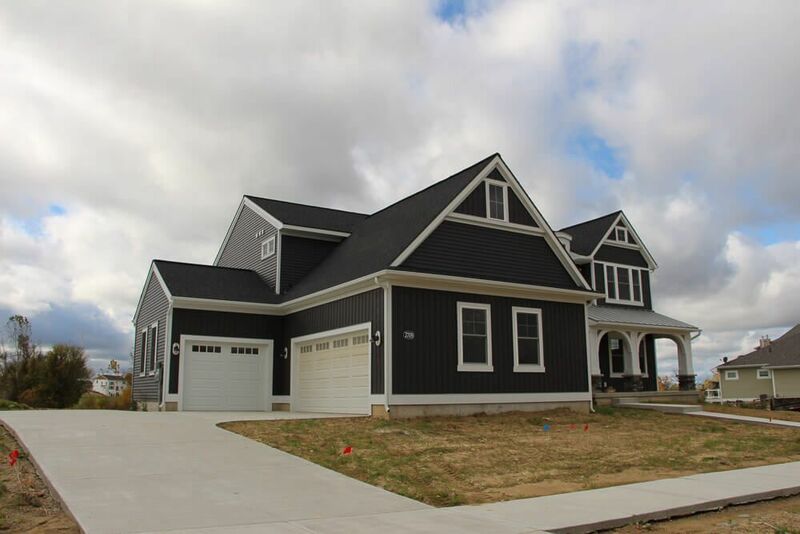 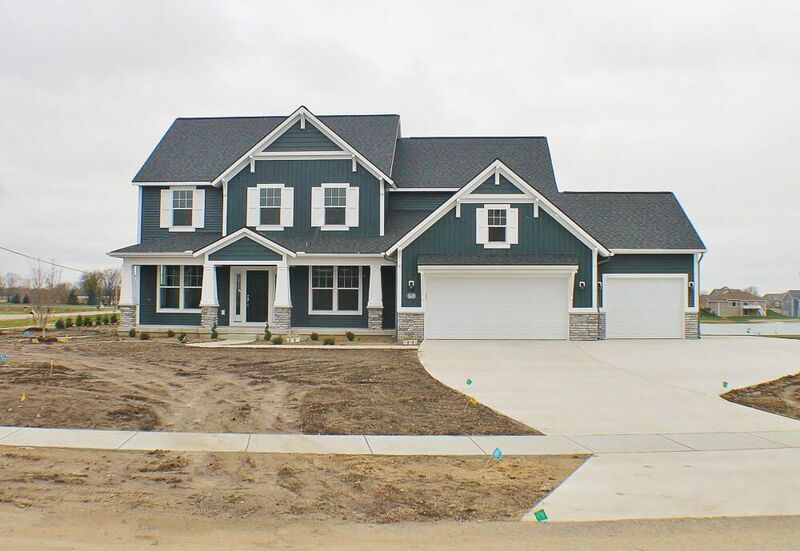 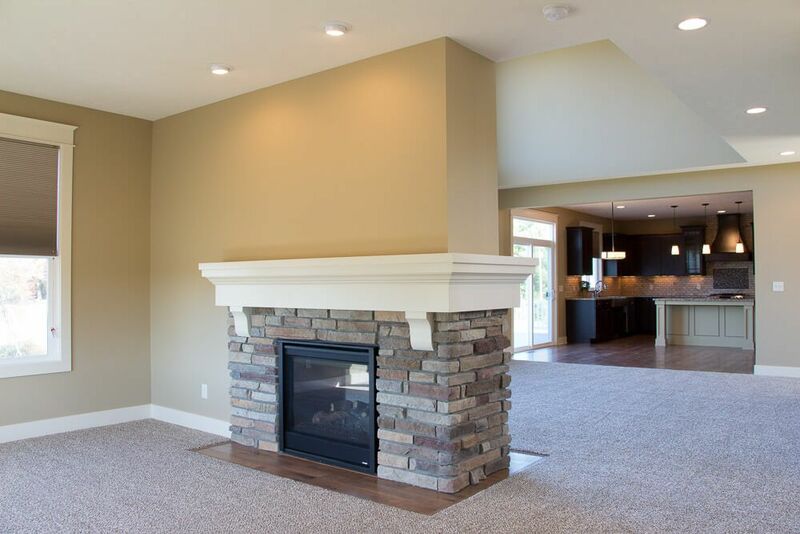 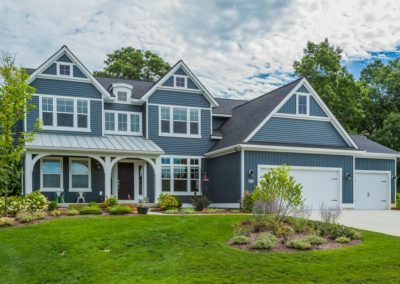 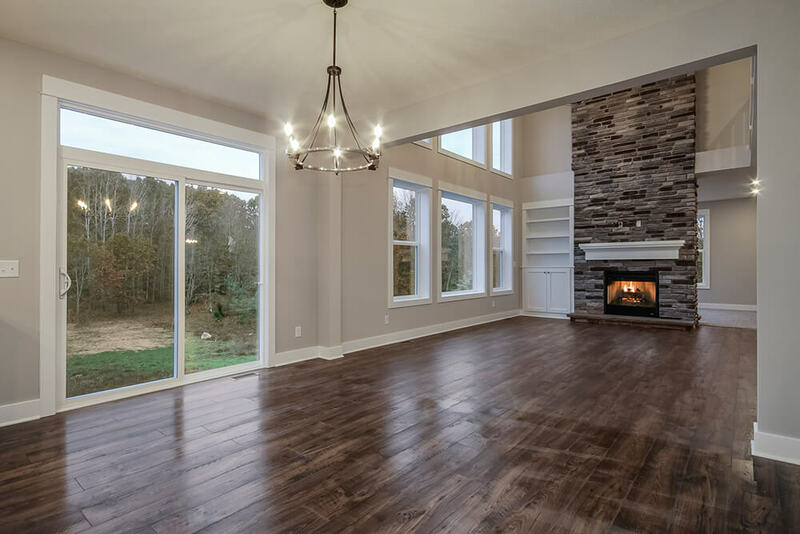 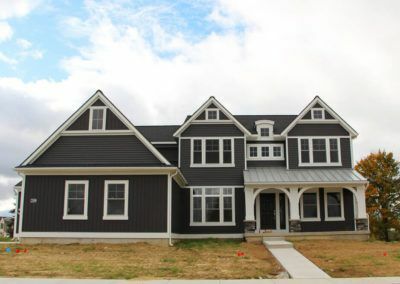 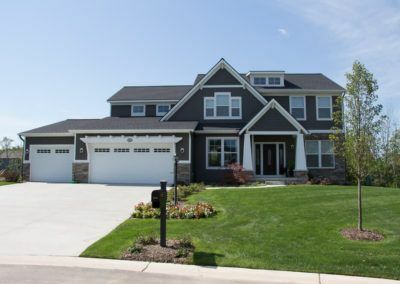 The Jamestown is an impressive two-story home plan that offers a balance of formal and informal living space. 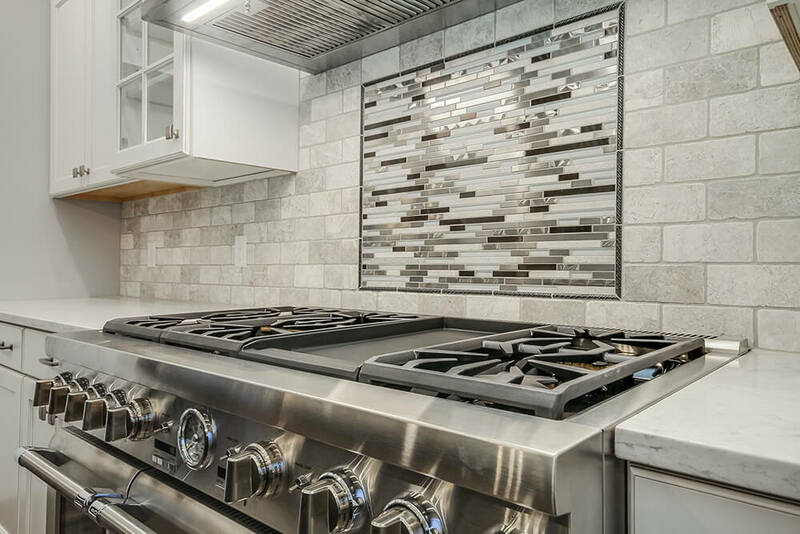 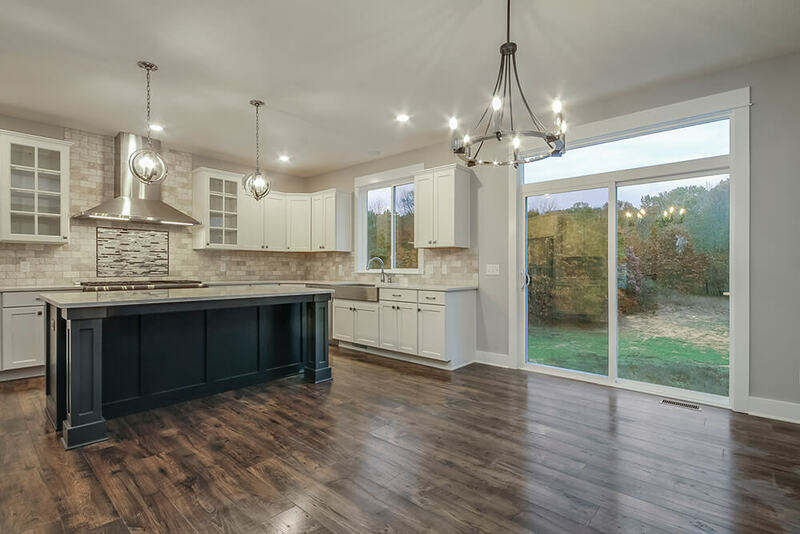 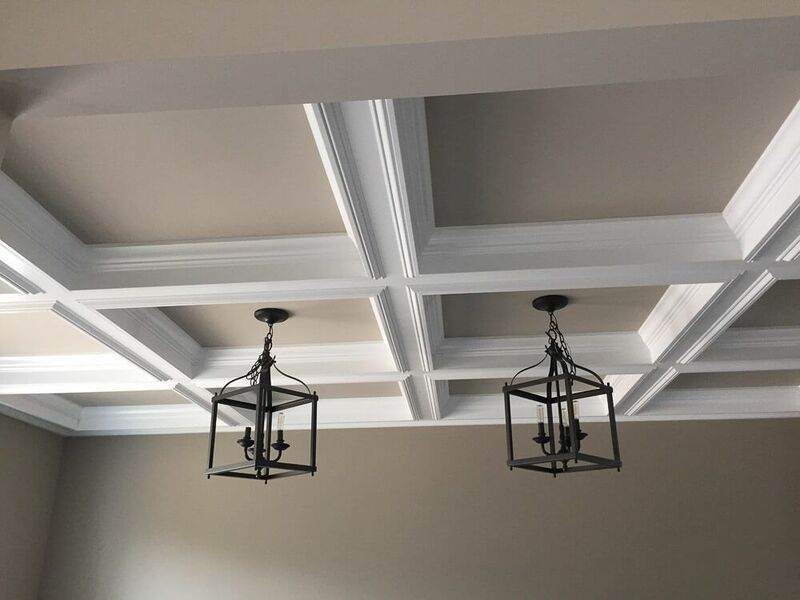 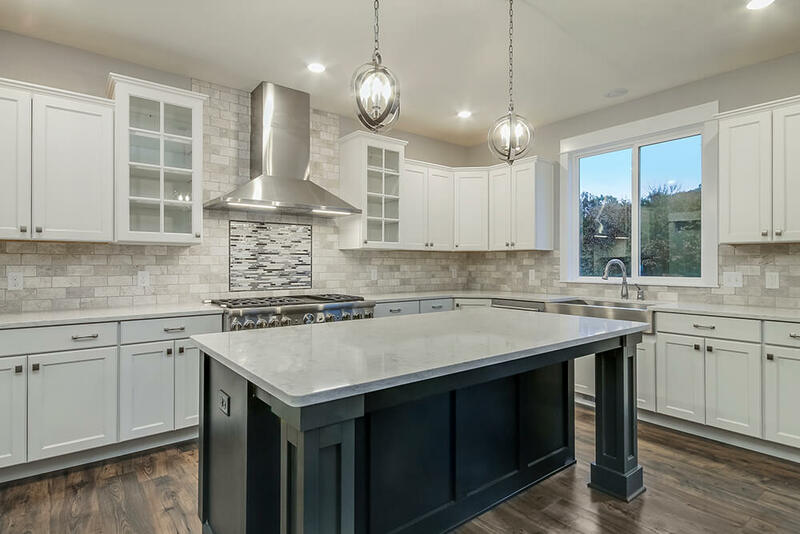 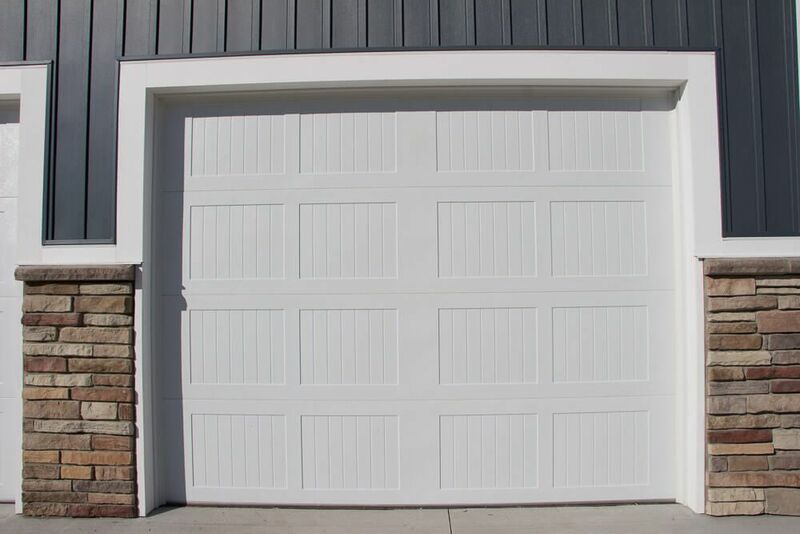 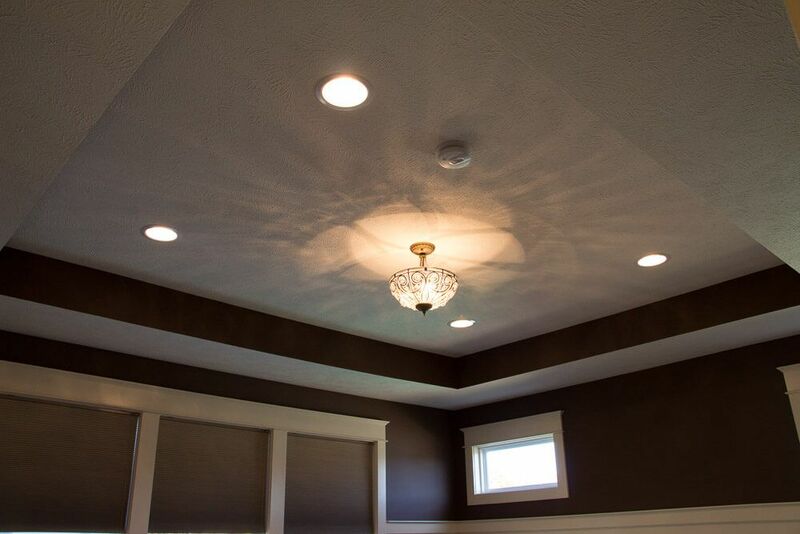 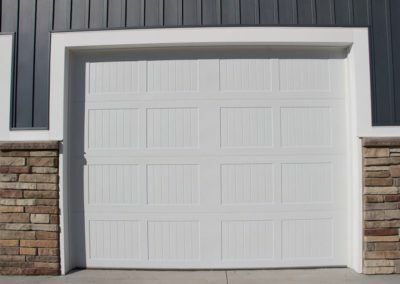 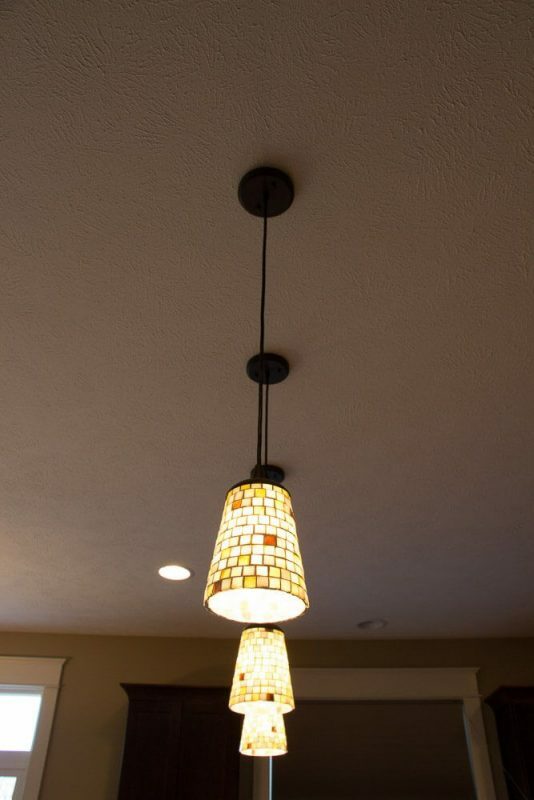 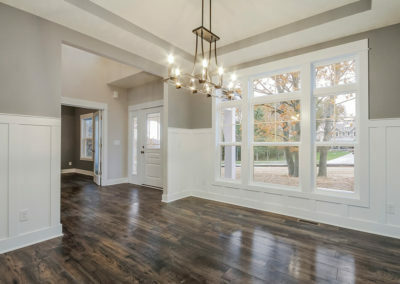 With a range of interior and exterior designs, you have room to personalize an attractive home that is uniquely your own. 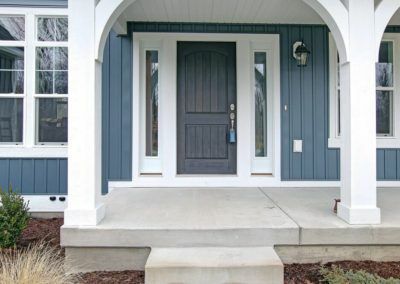 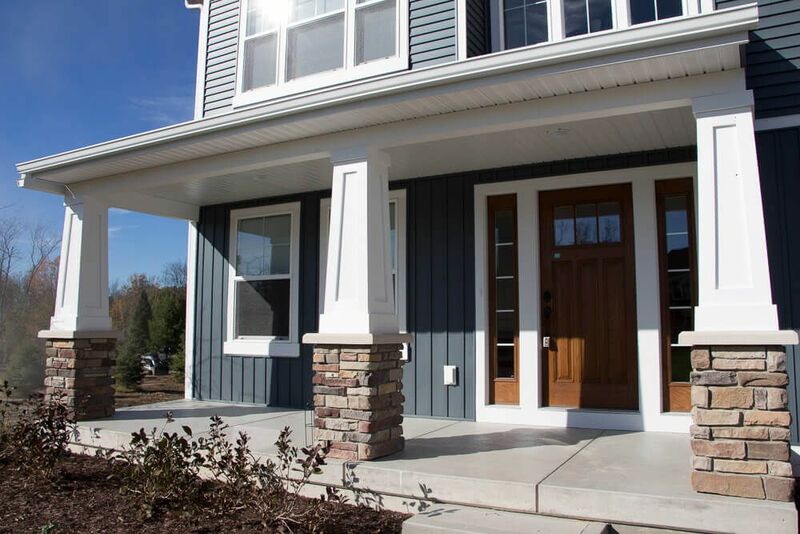 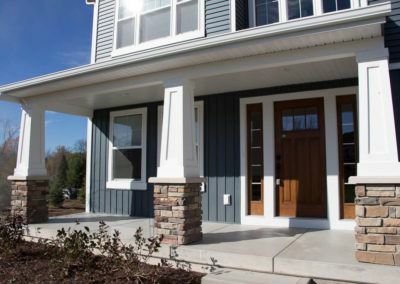 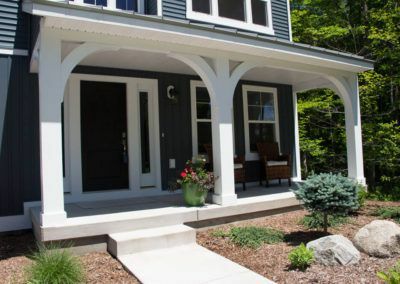 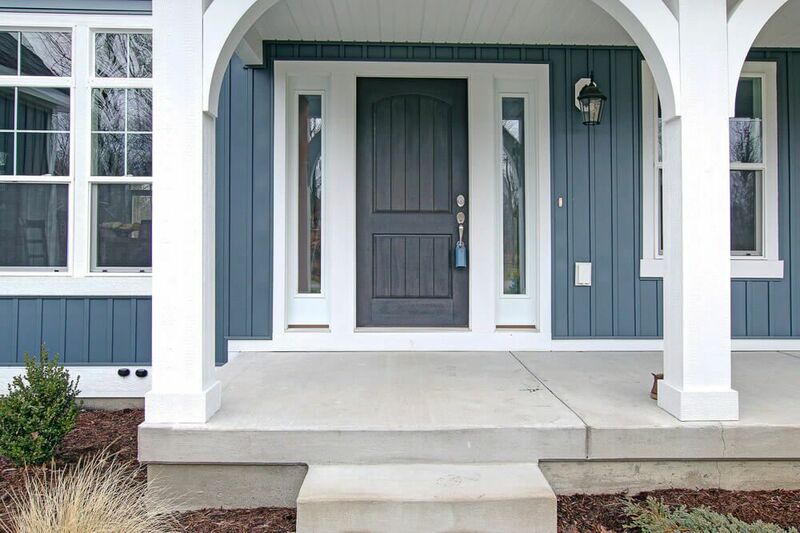 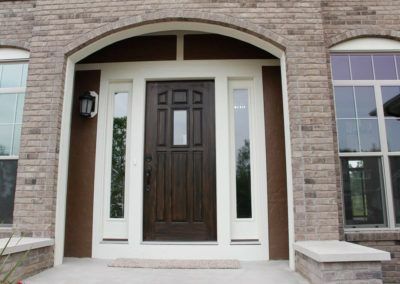 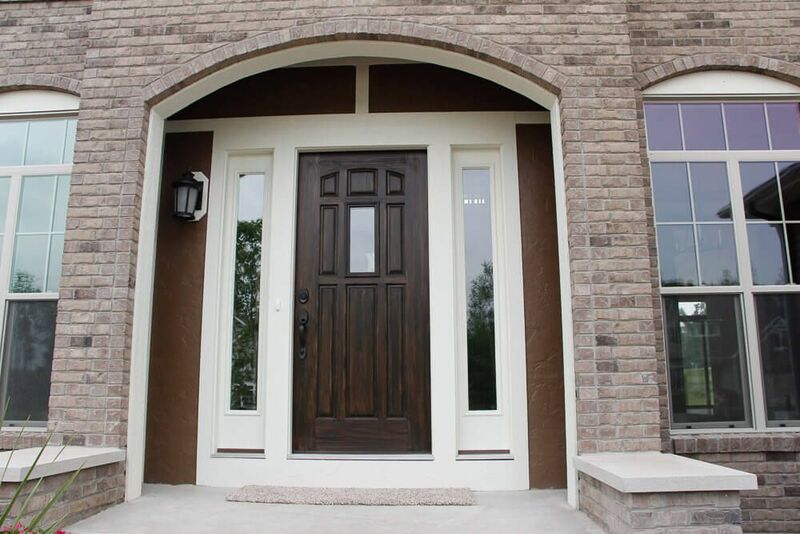 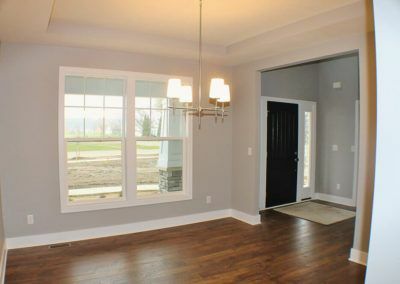 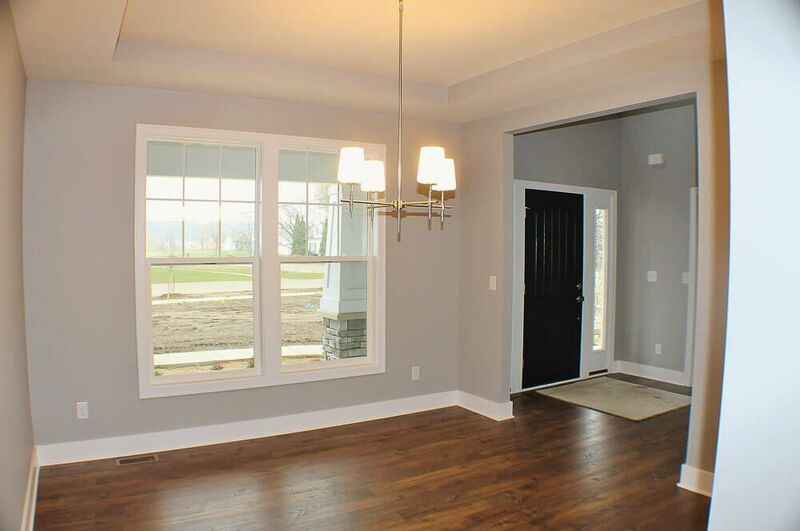 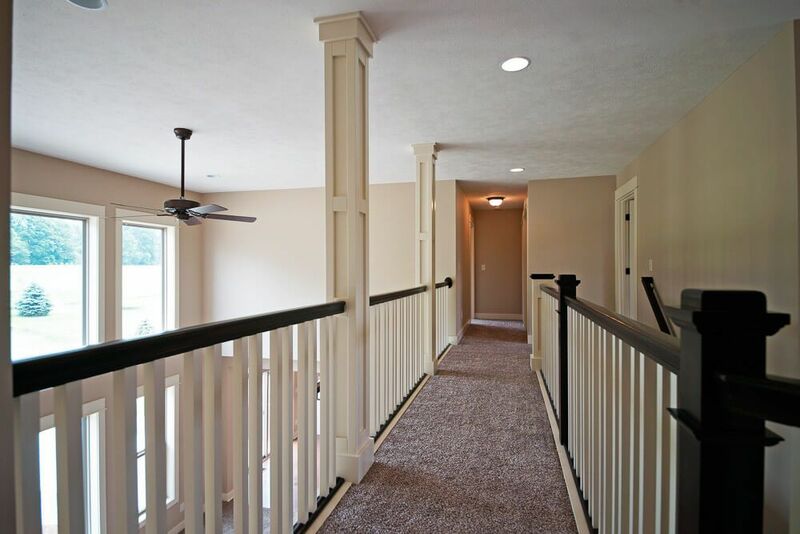 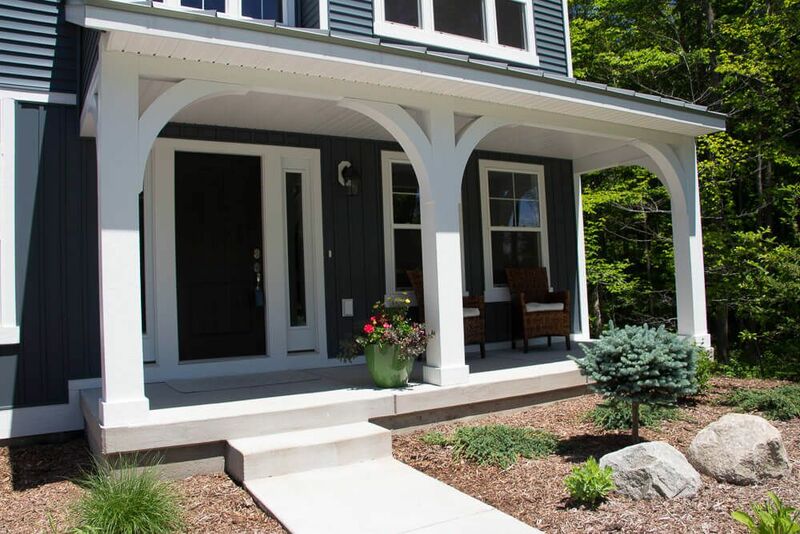 The Jamestown’s pillared front porch leads into the two-story front foyer. 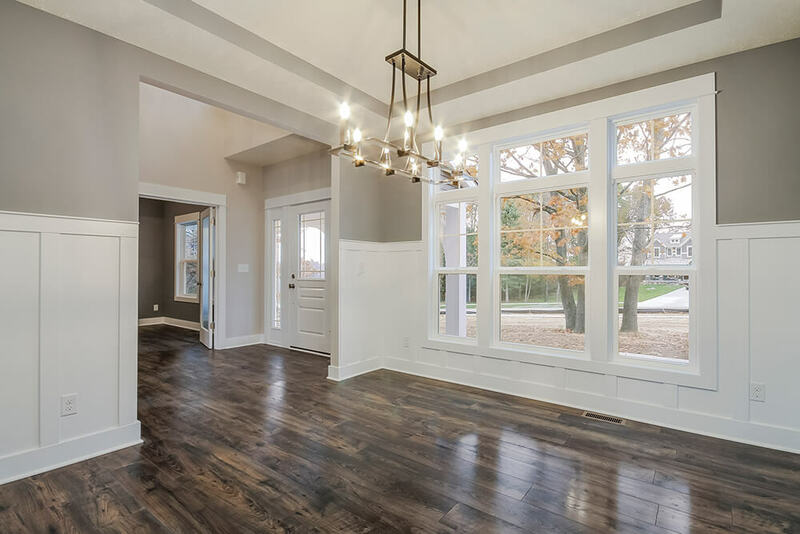 The foyer is open to the formal dining room, with its stately tray ceiling, and the front parlor with optional French doors. 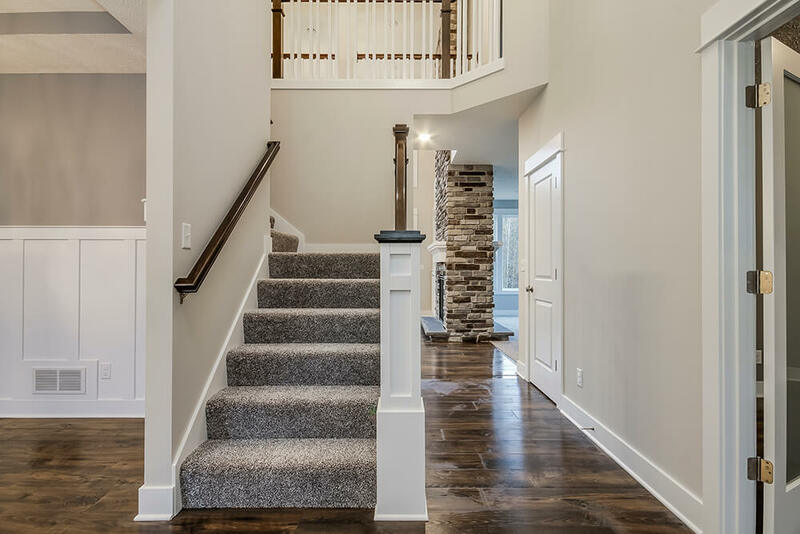 The foyer leads past the large study and out into the great room with its two-story ceiling and elegant fireplace. 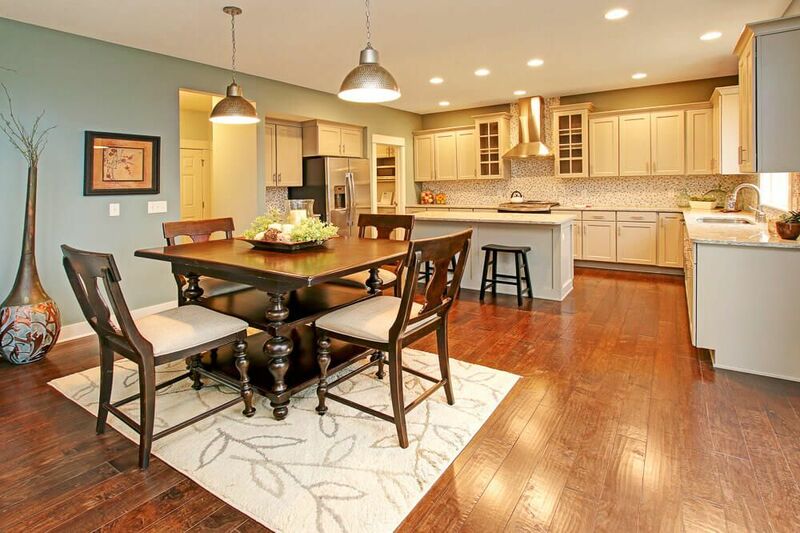 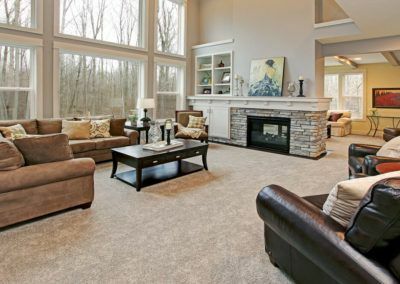 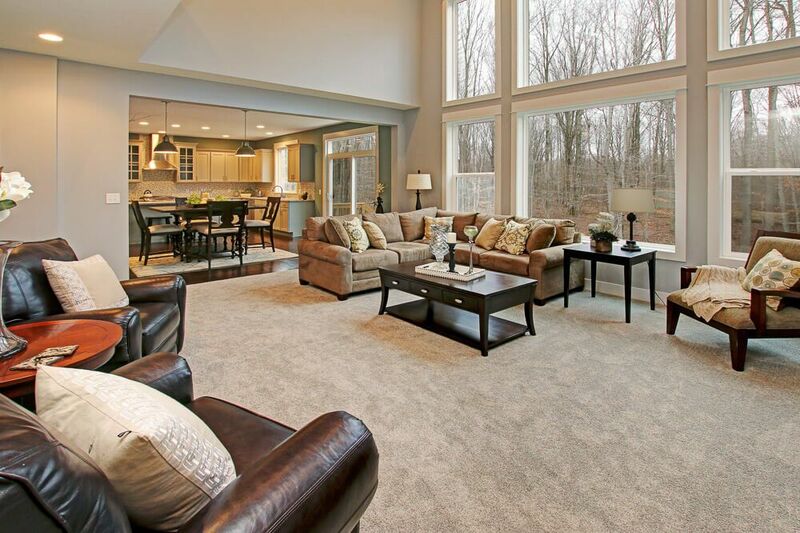 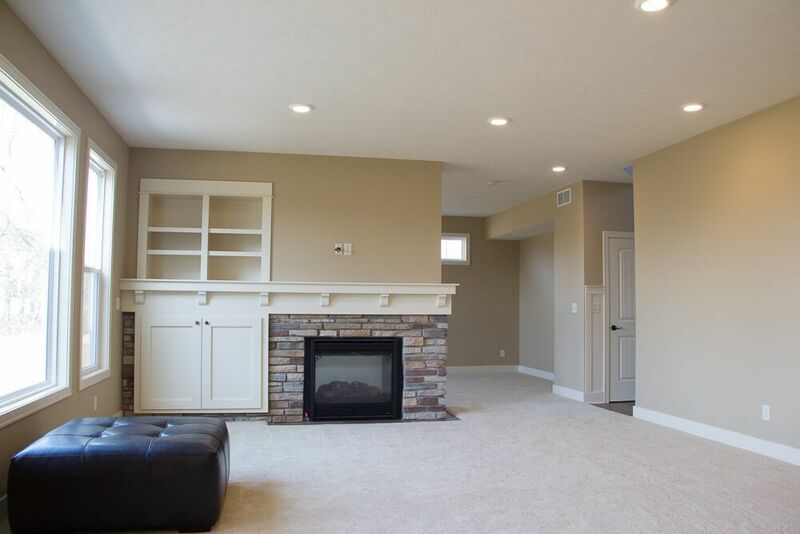 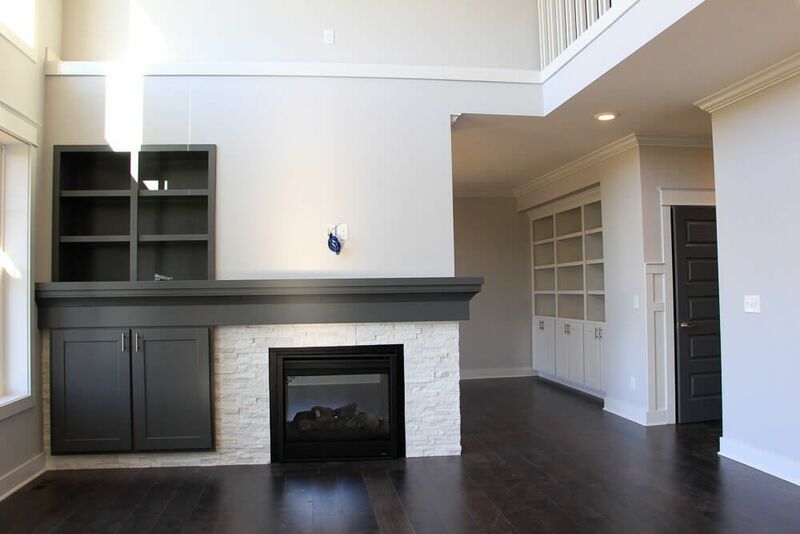 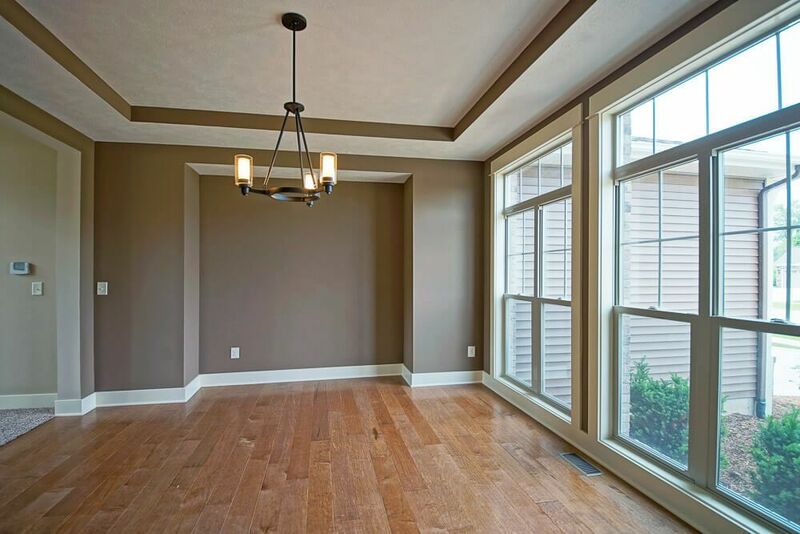 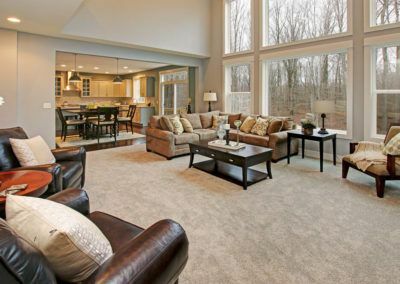 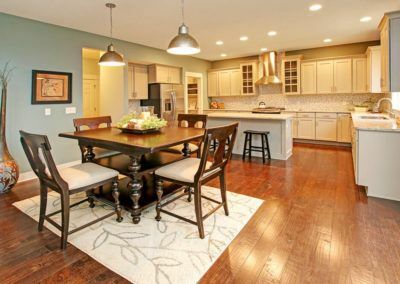 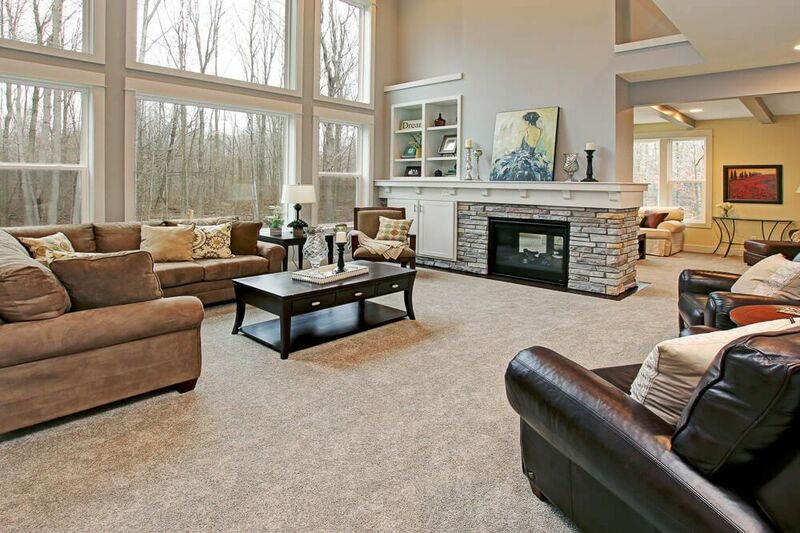 The family room flows smoothly into the informal dining area and ample kitchen. 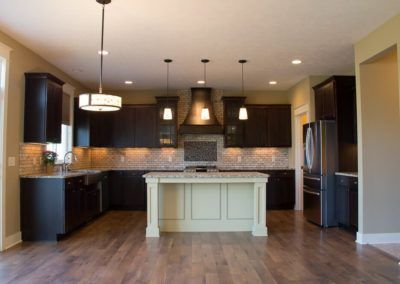 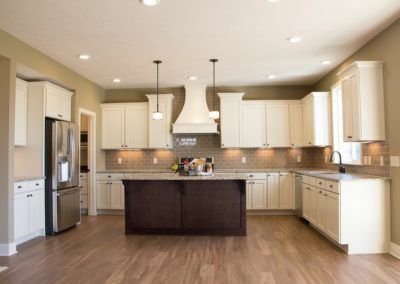 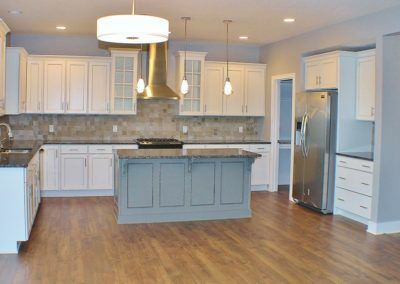 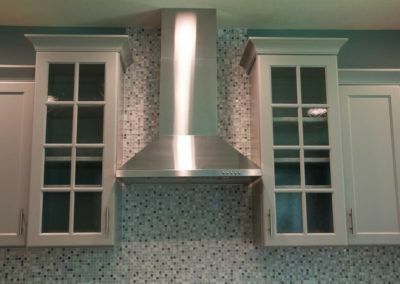 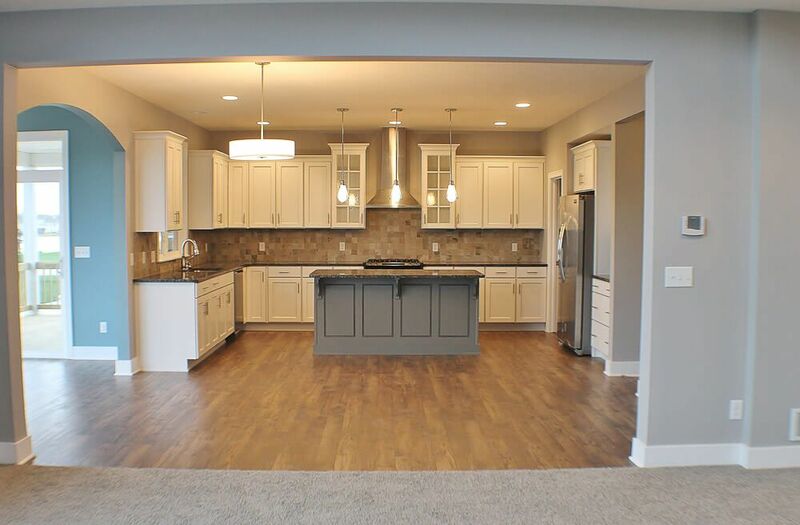 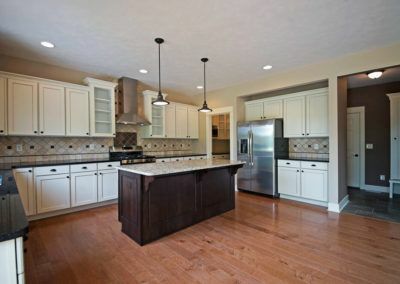 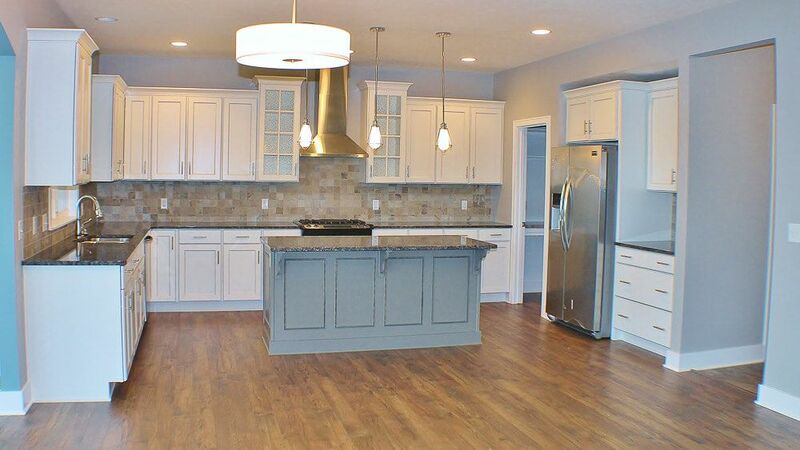 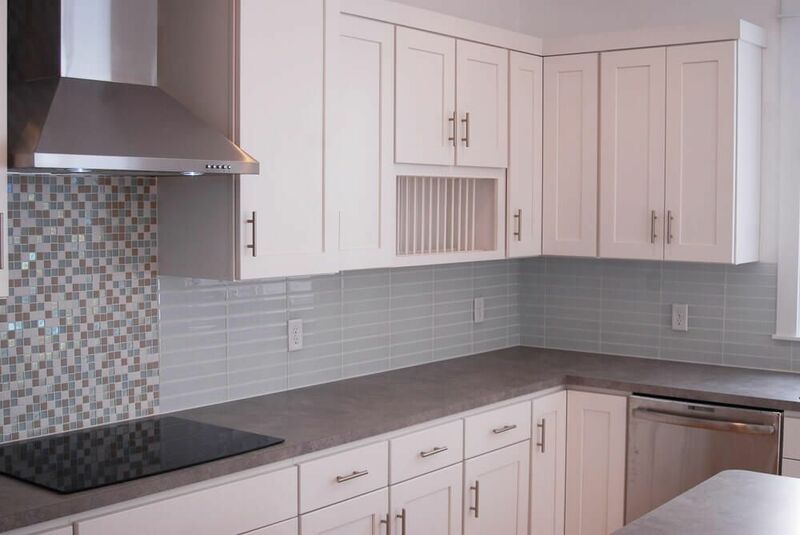 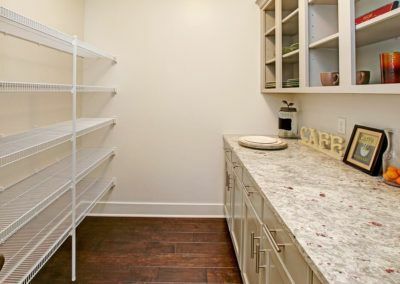 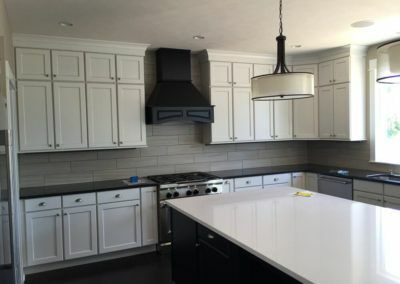 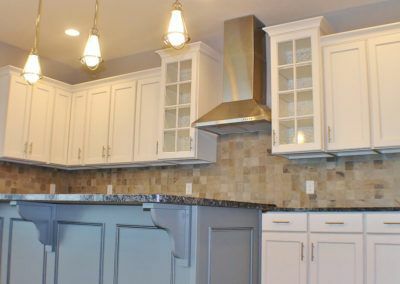 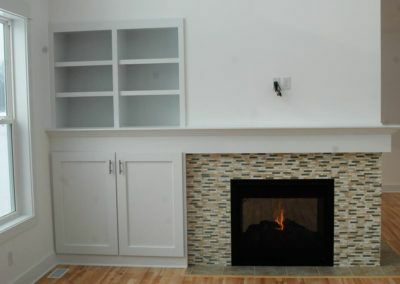 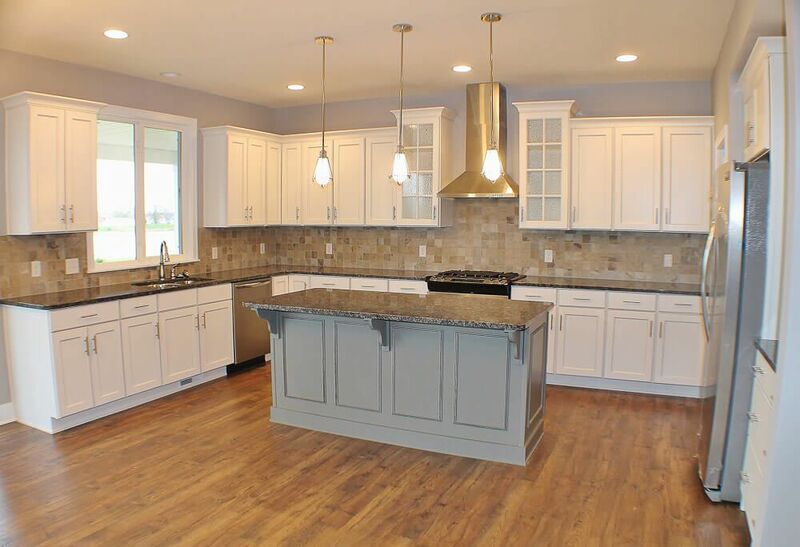 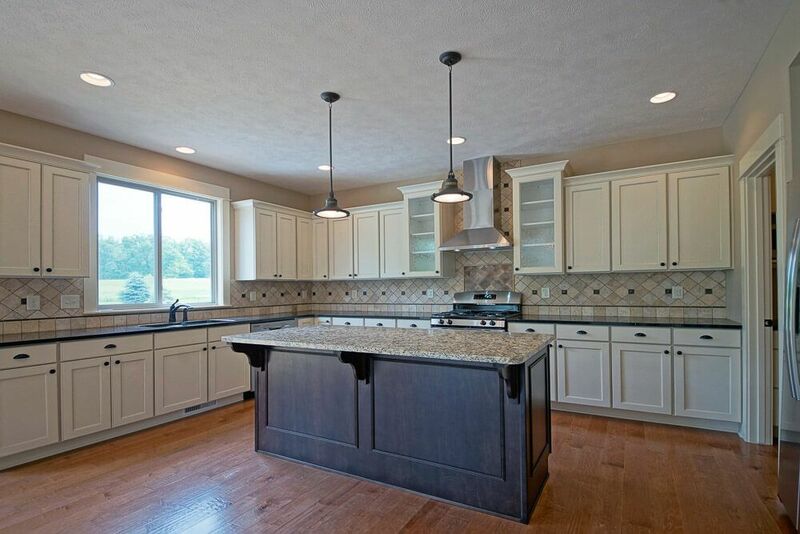 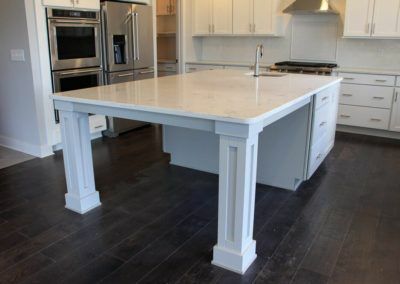 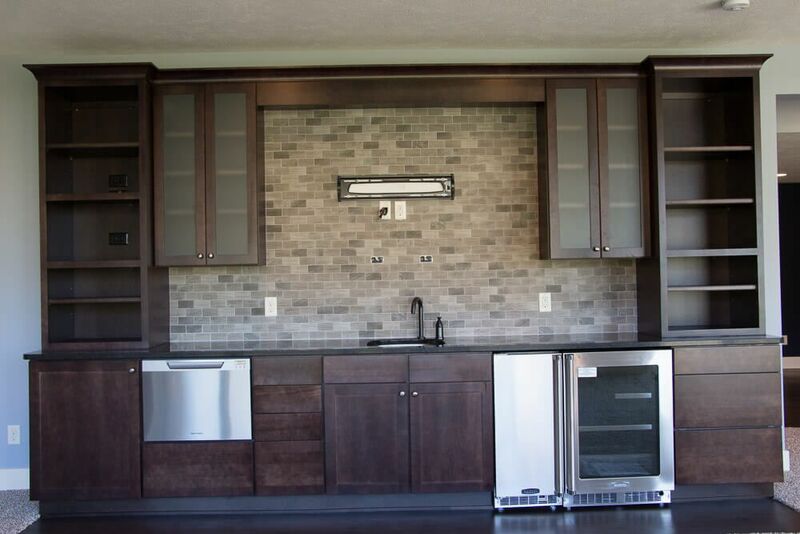 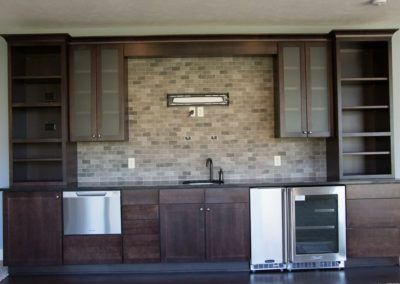 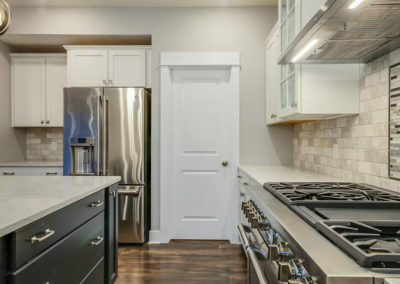 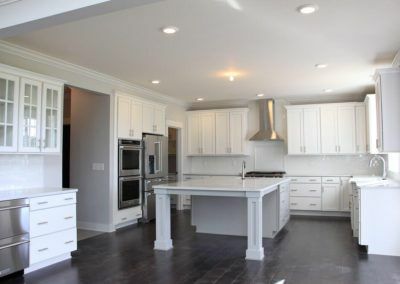 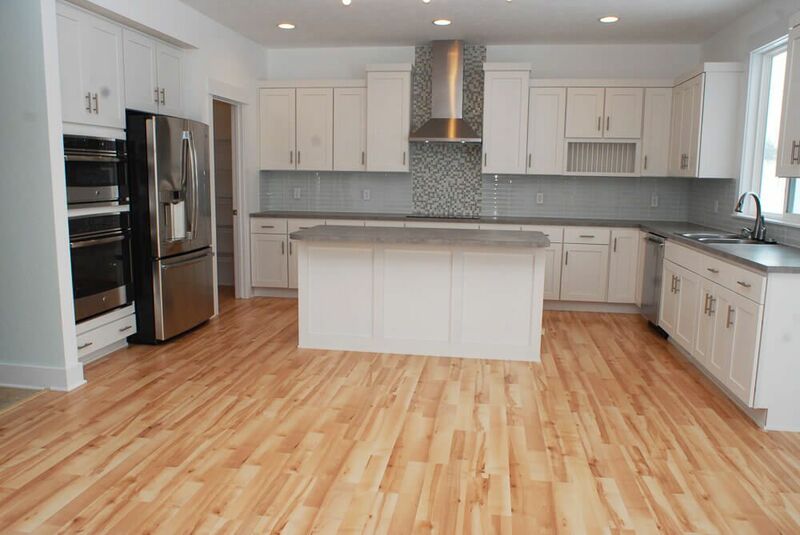 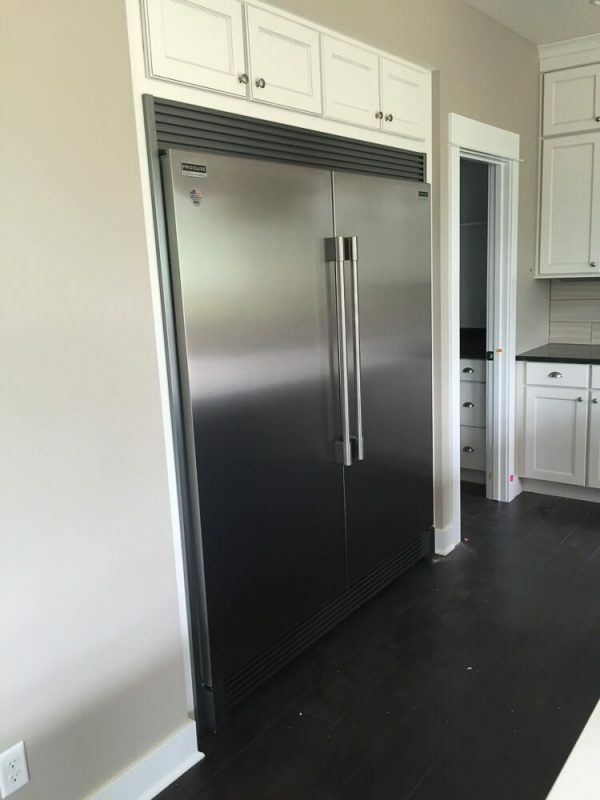 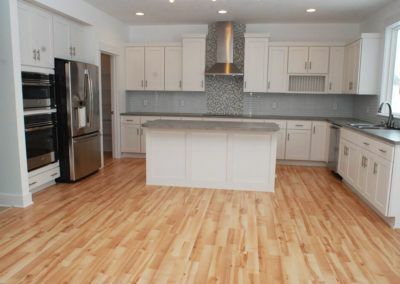 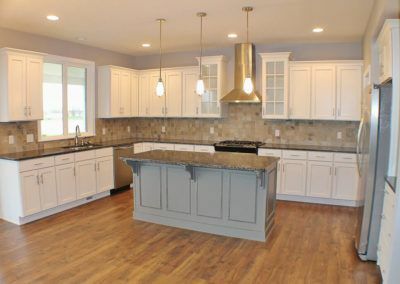 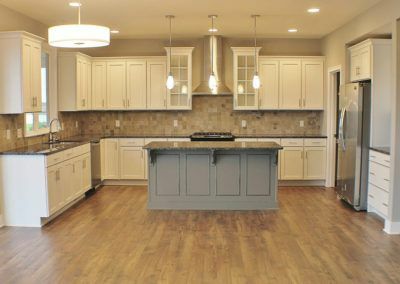 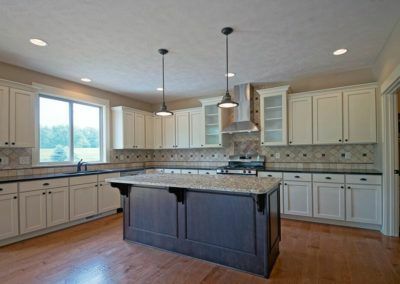 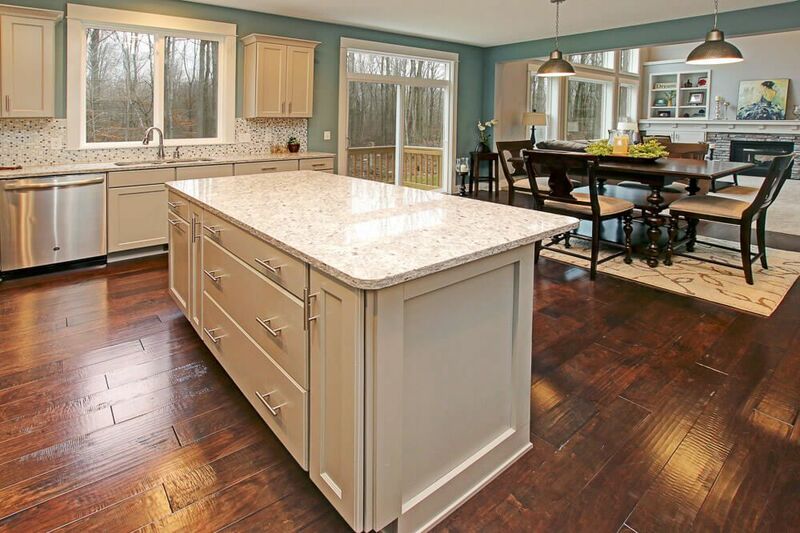 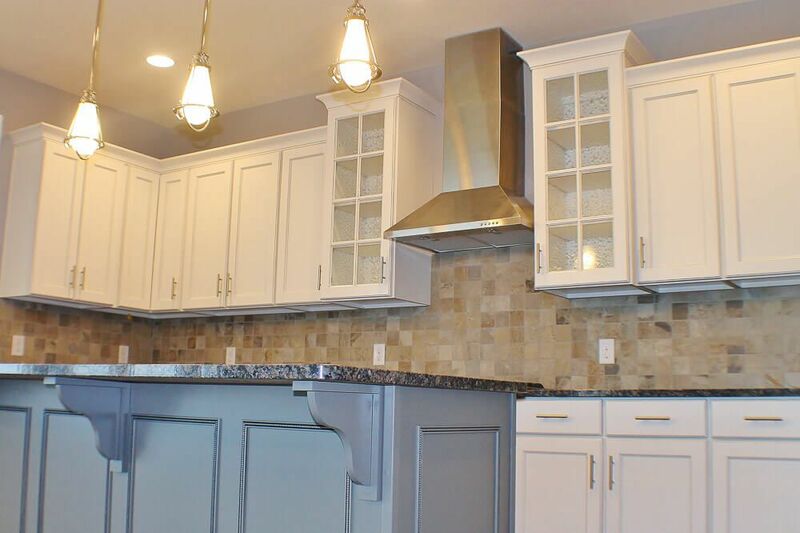 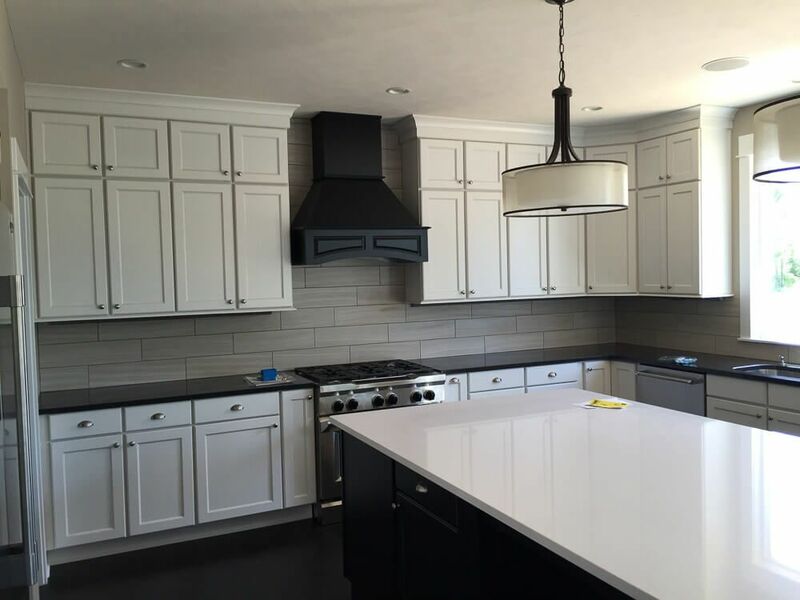 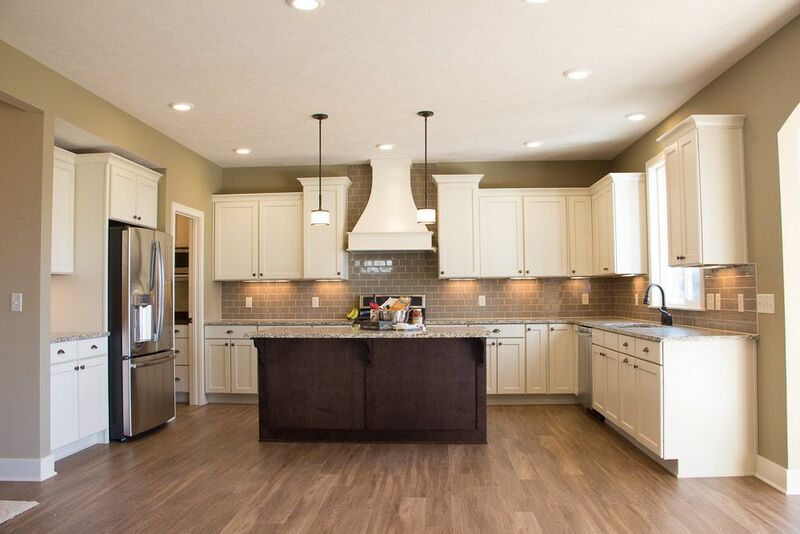 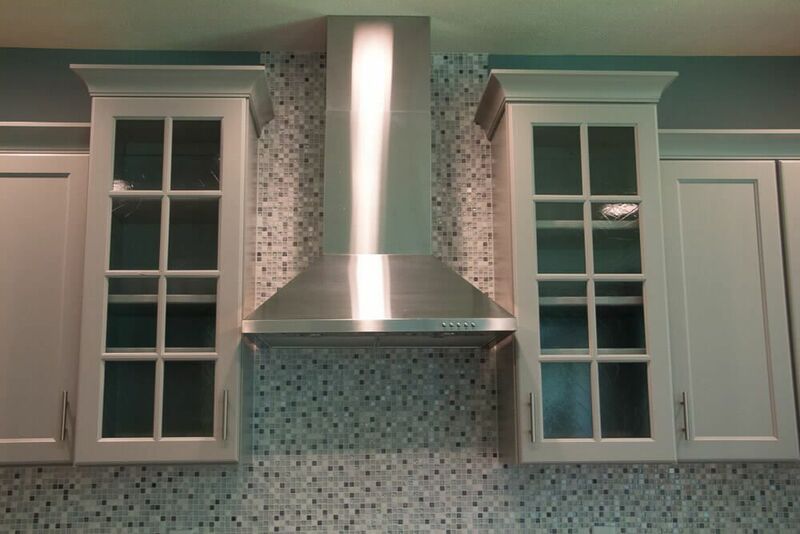 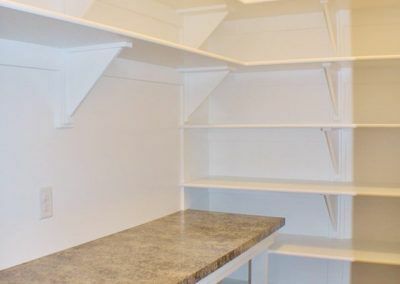 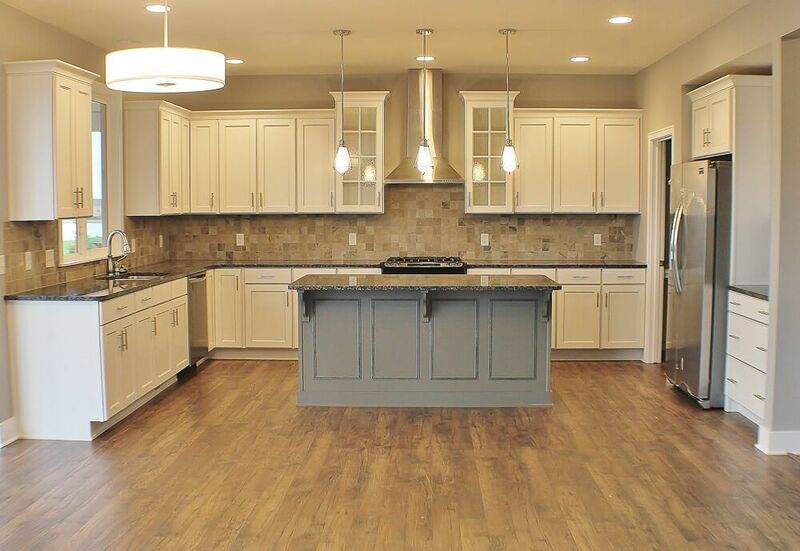 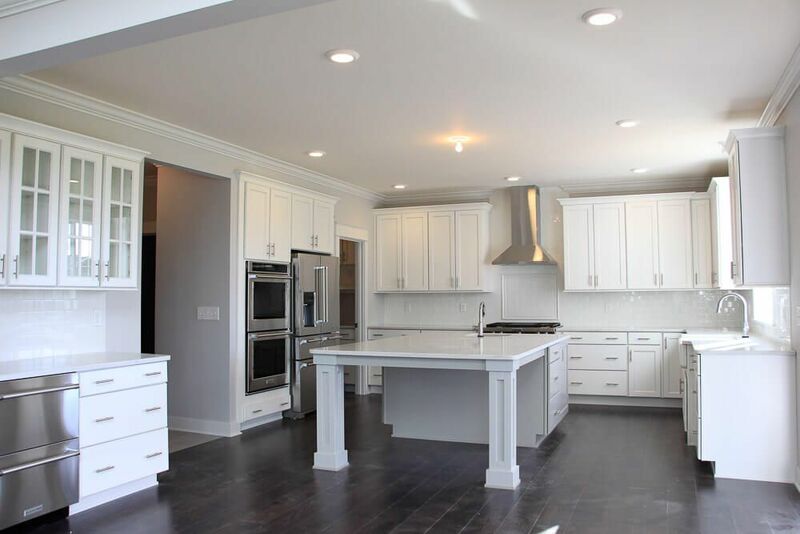 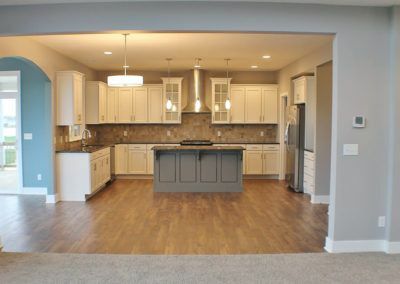 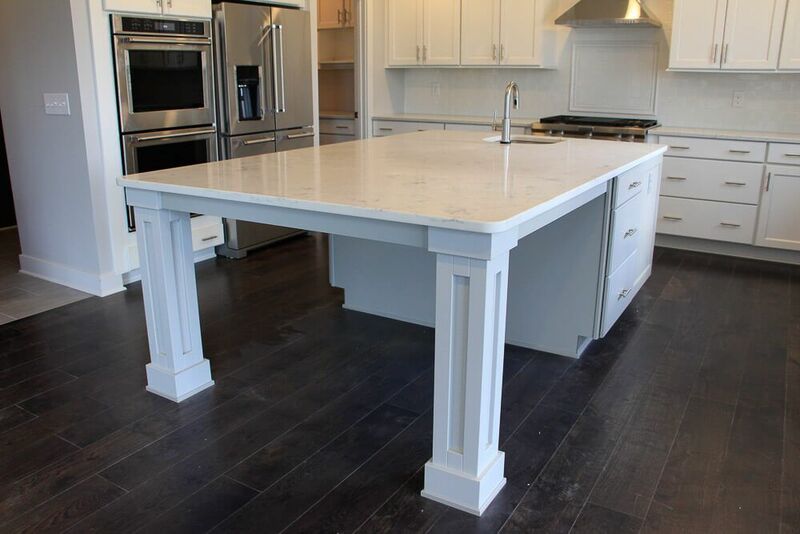 The kitchen has a large central island, a walk-in pantry, and plenty of cupboards and counter space. 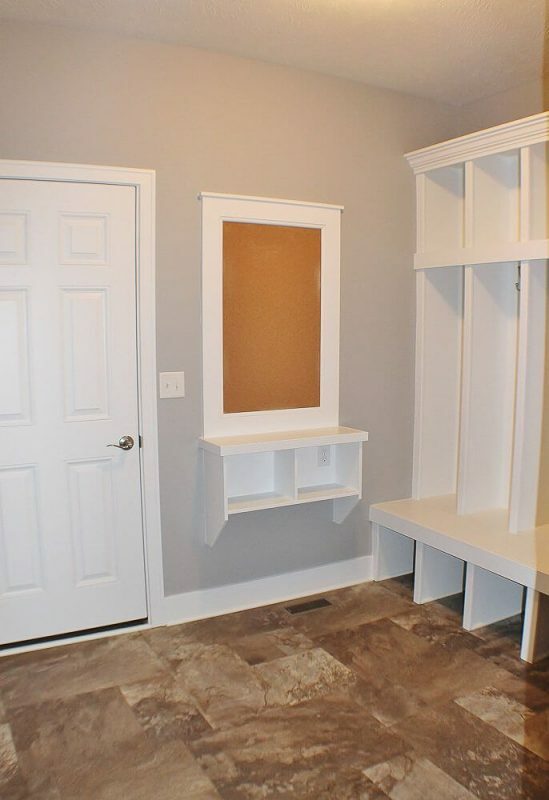 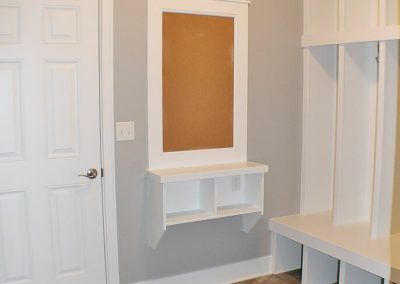 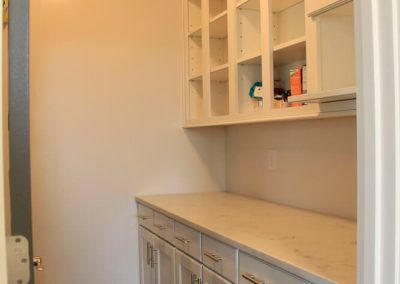 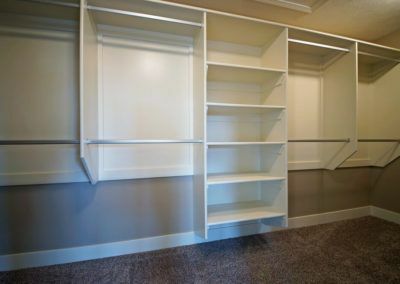 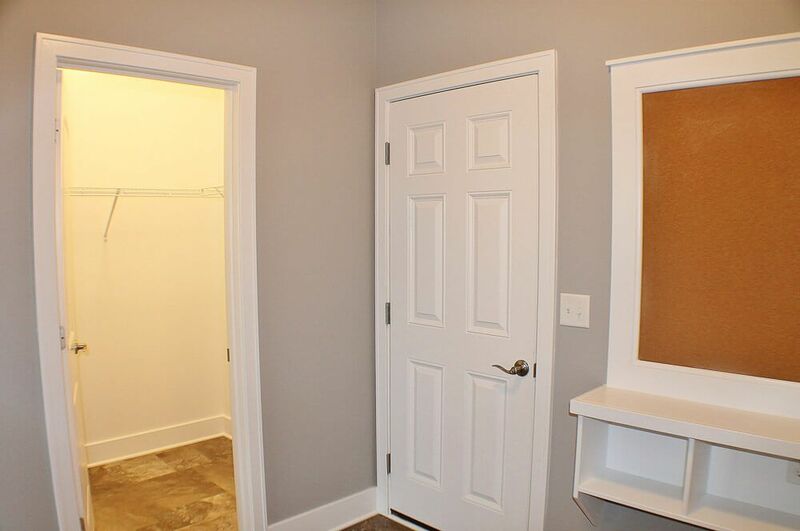 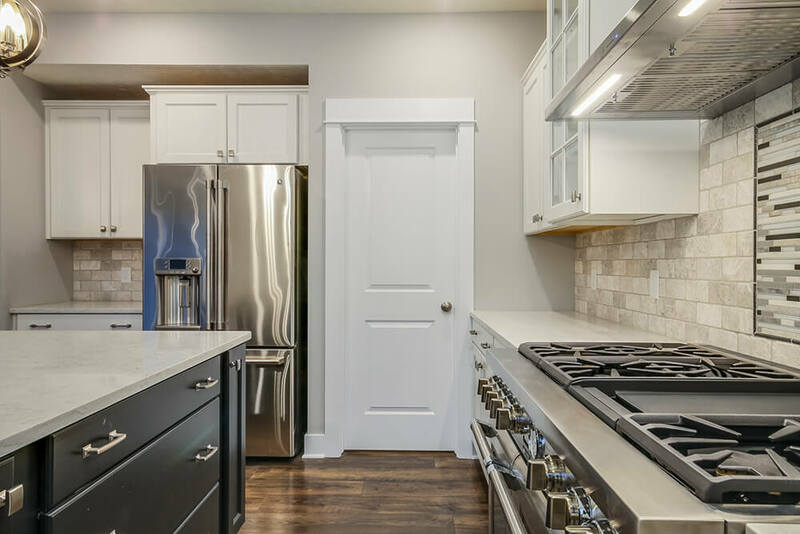 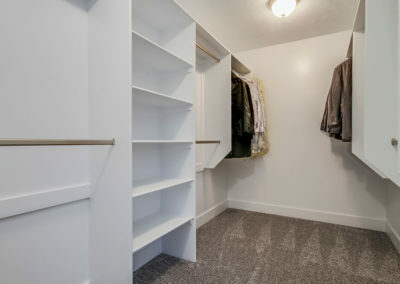 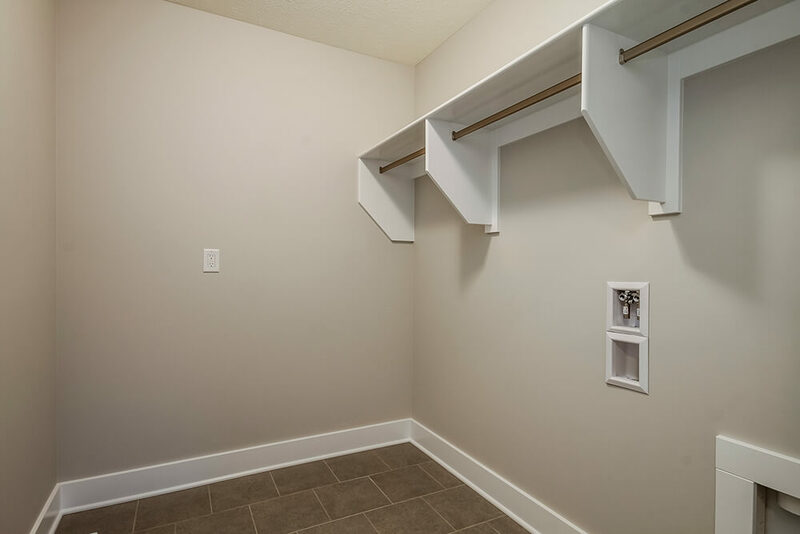 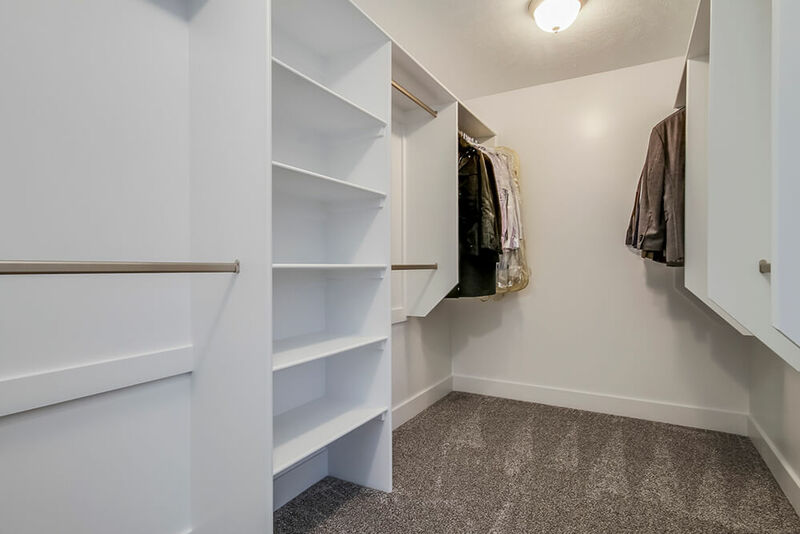 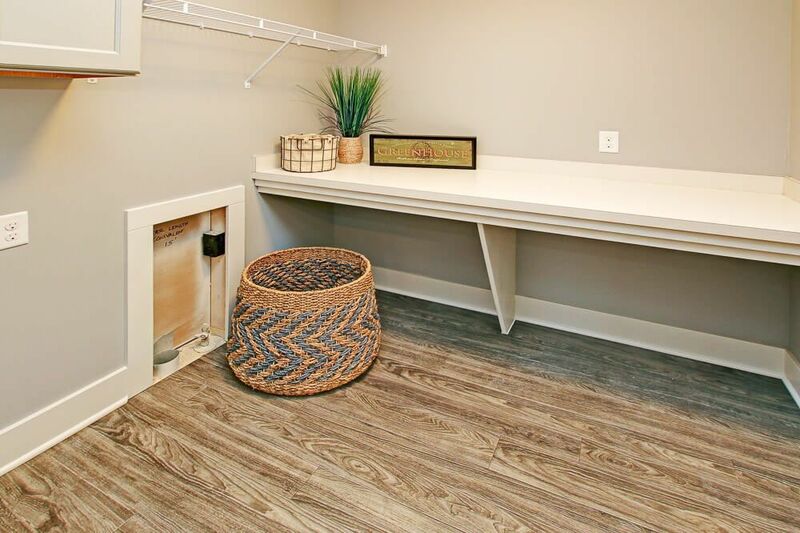 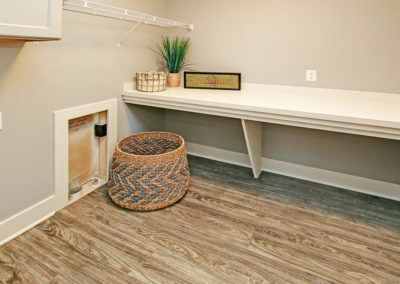 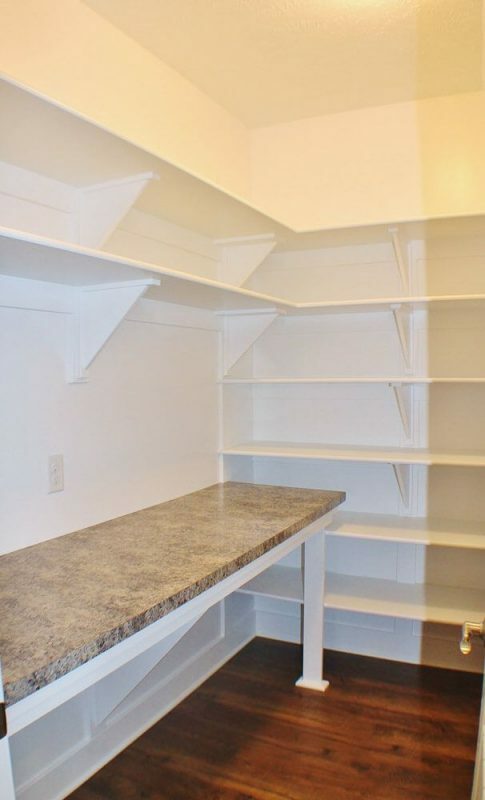 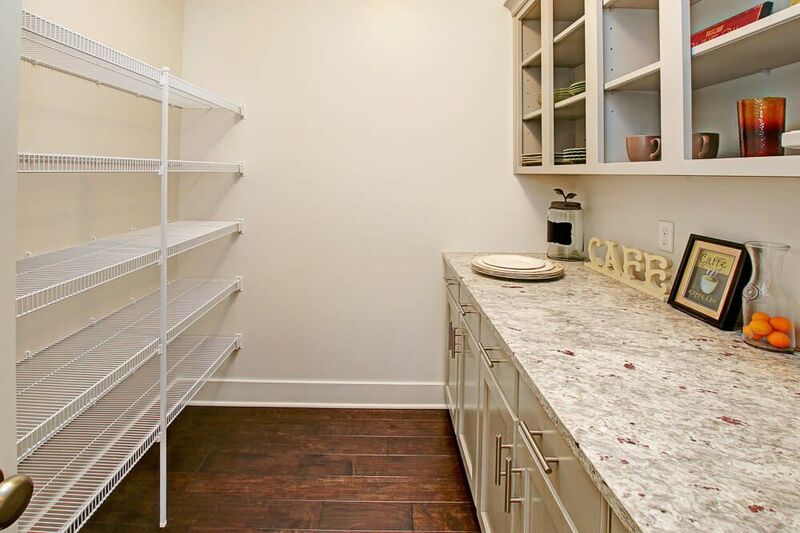 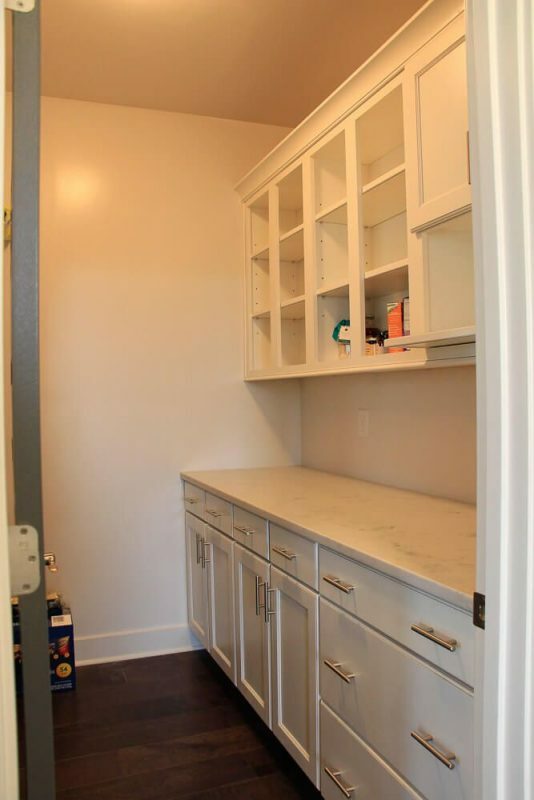 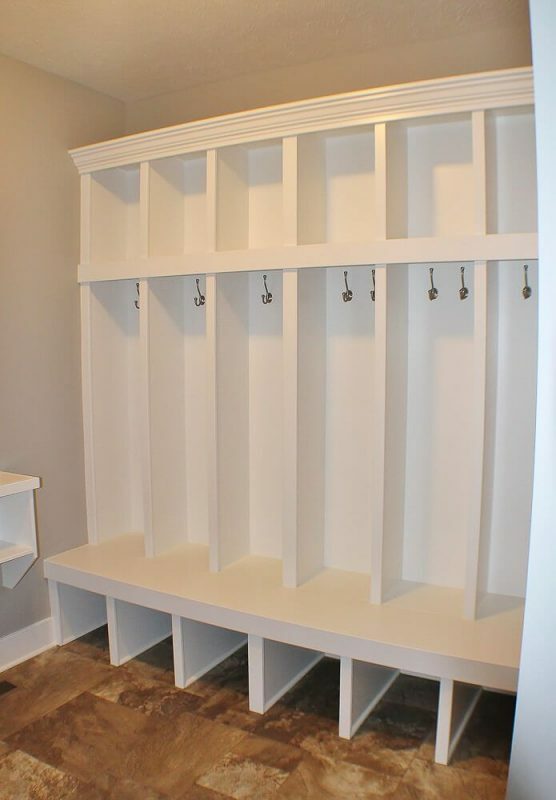 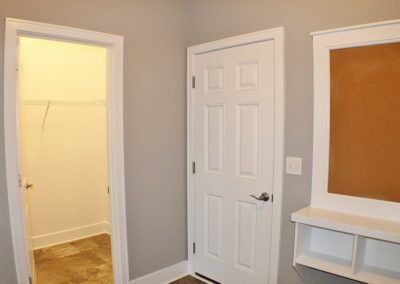 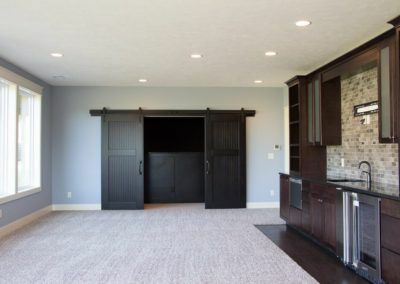 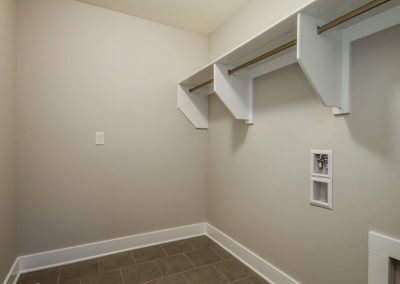 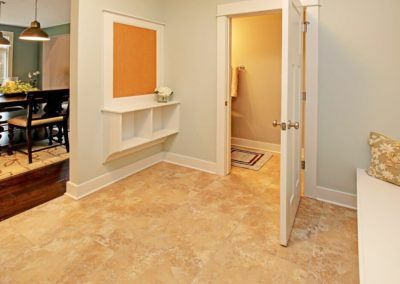 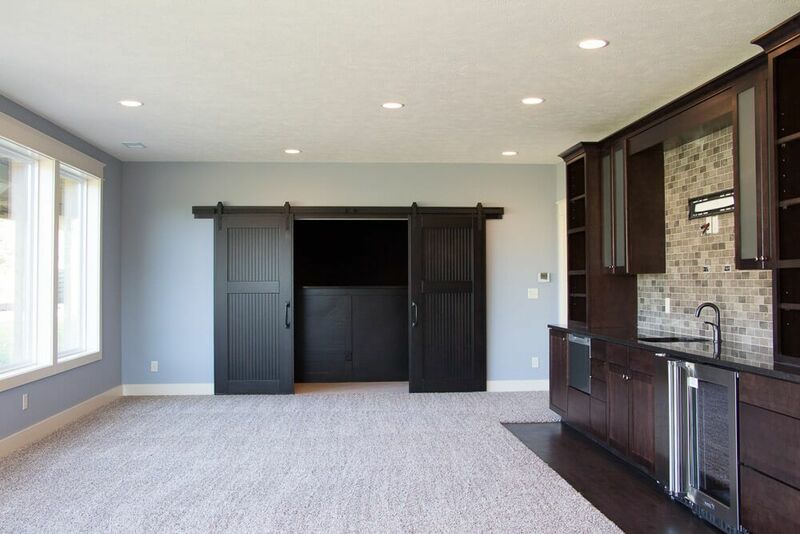 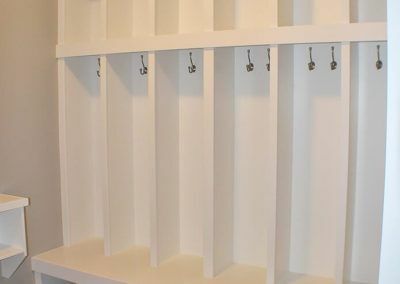 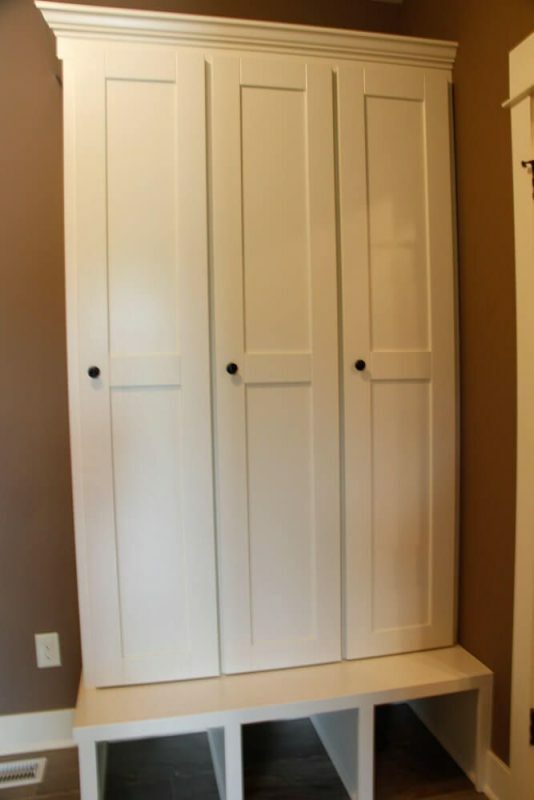 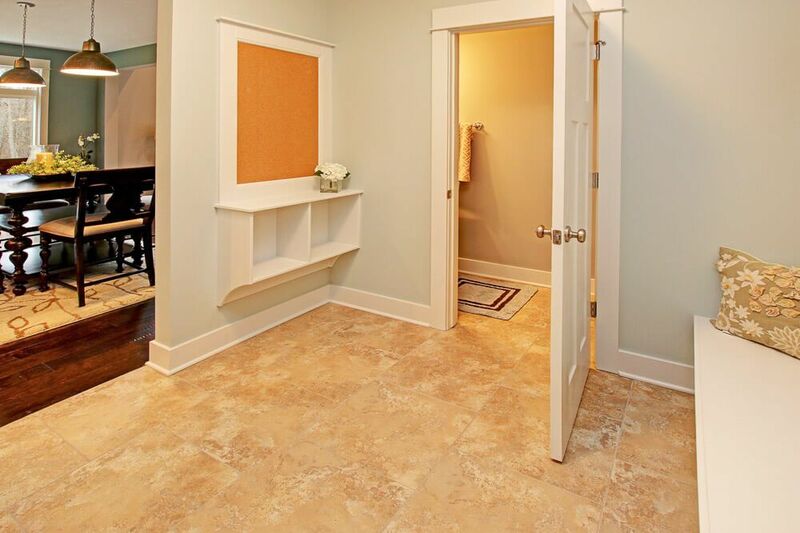 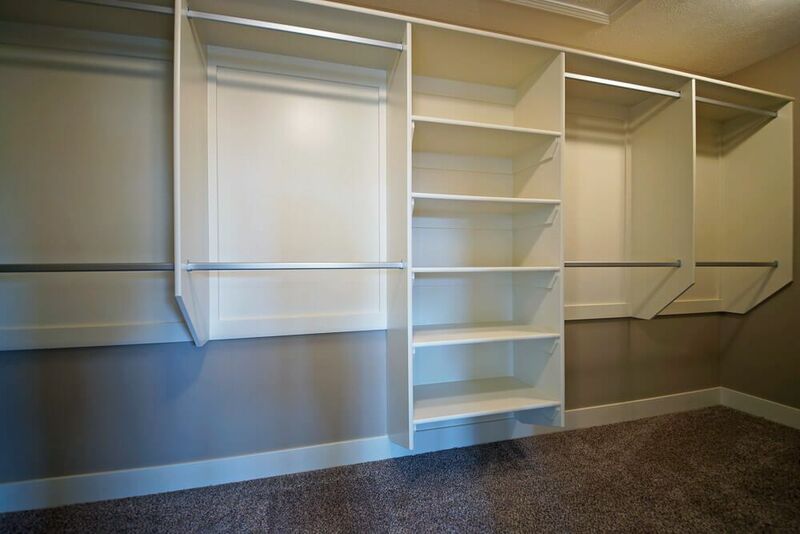 Off the kitchen, the mudroom offers a coat closet and optional bench or lockers, and leads to the half bath and two or three car garage. 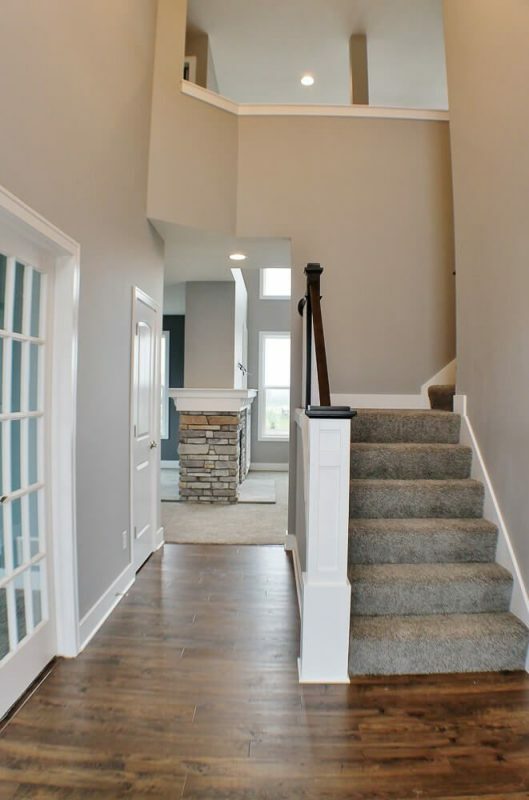 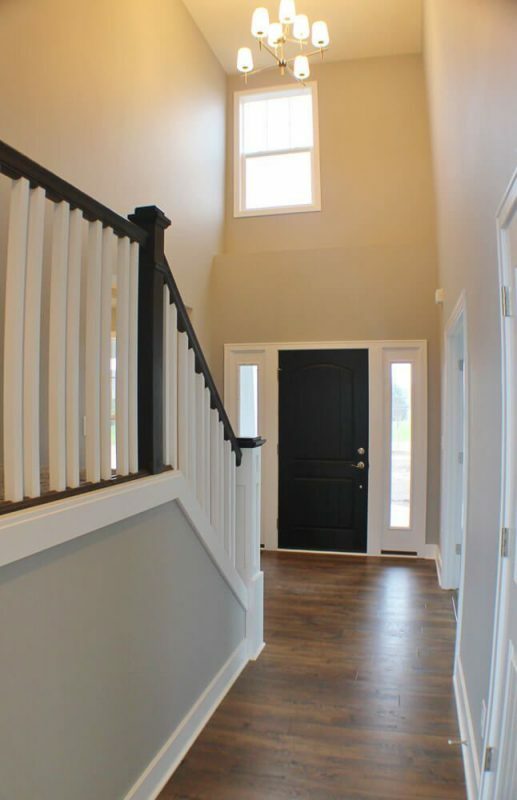 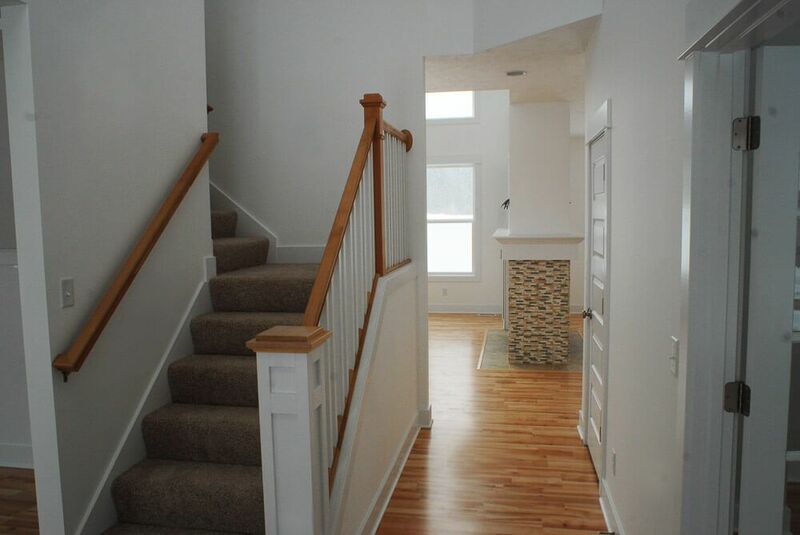 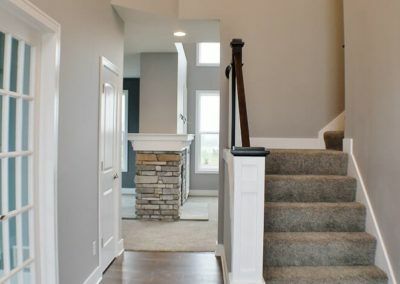 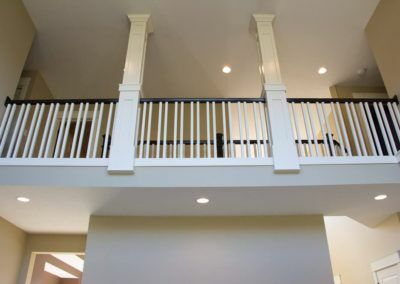 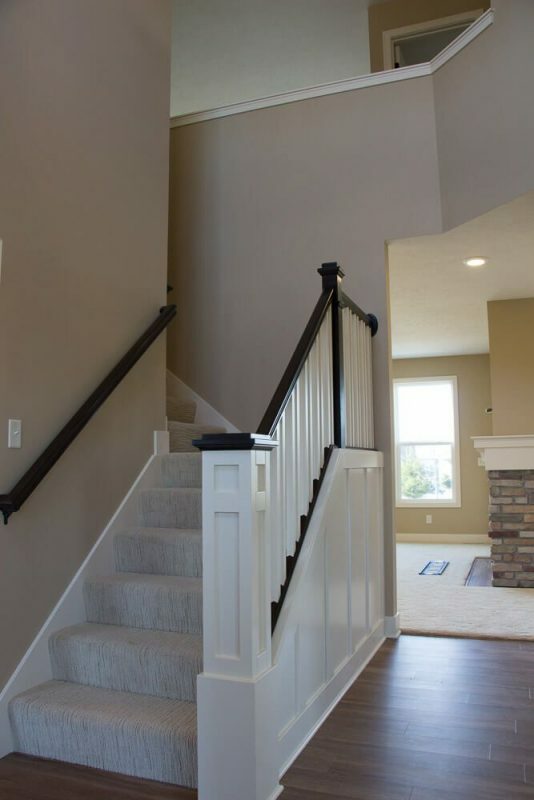 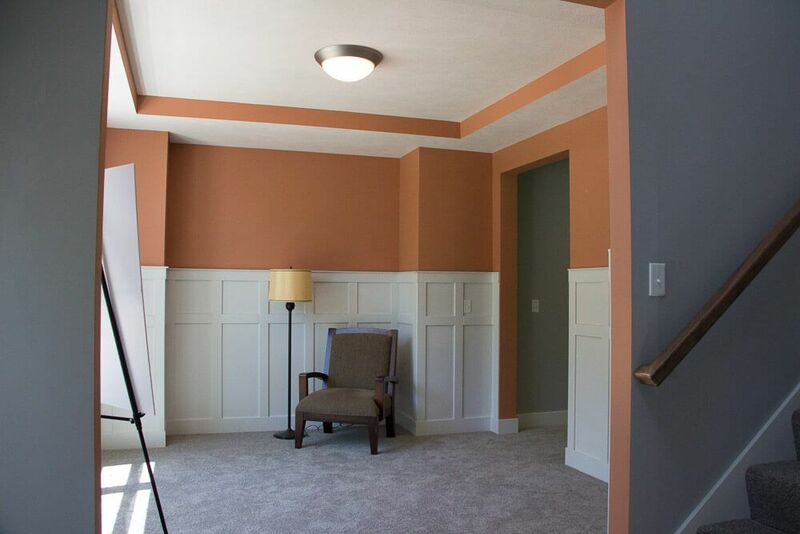 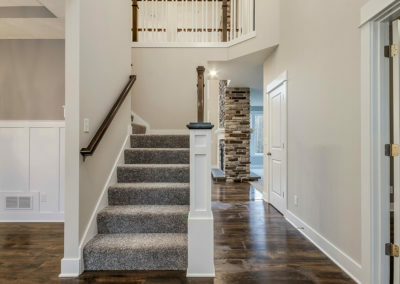 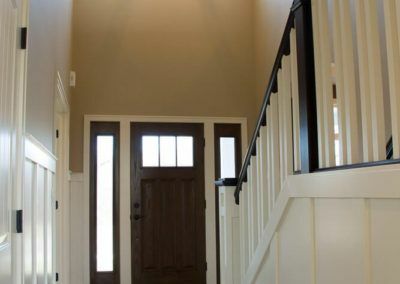 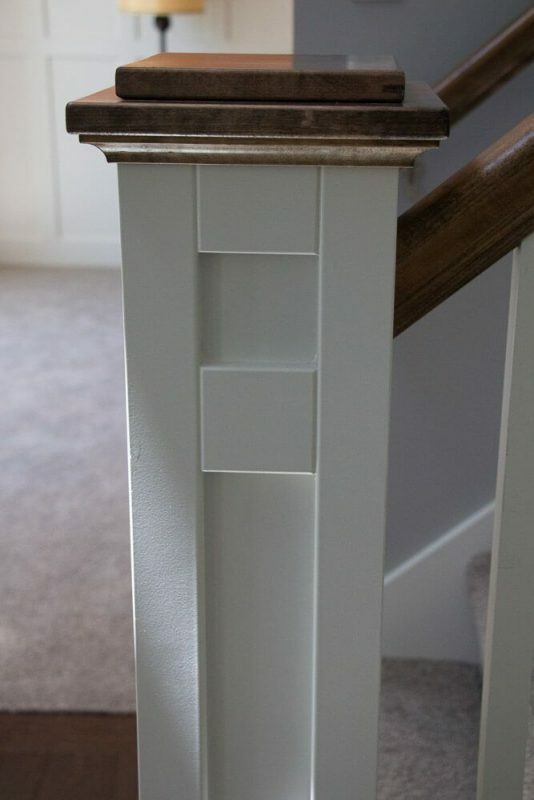 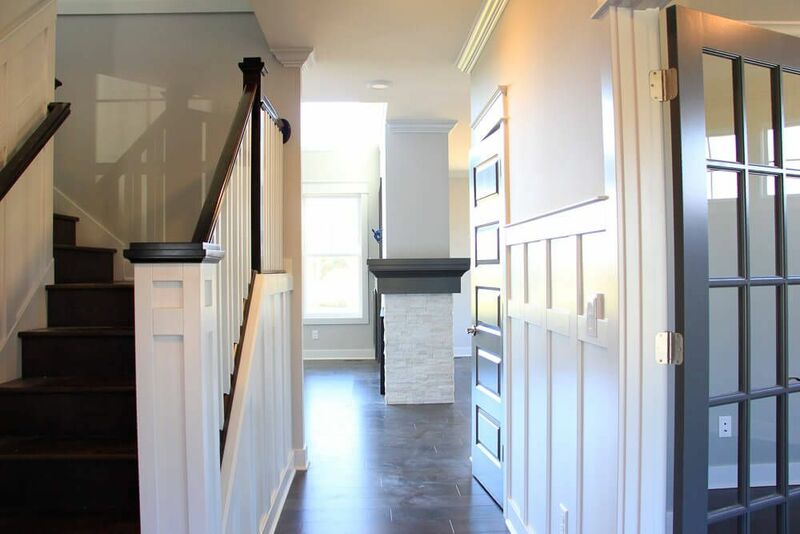 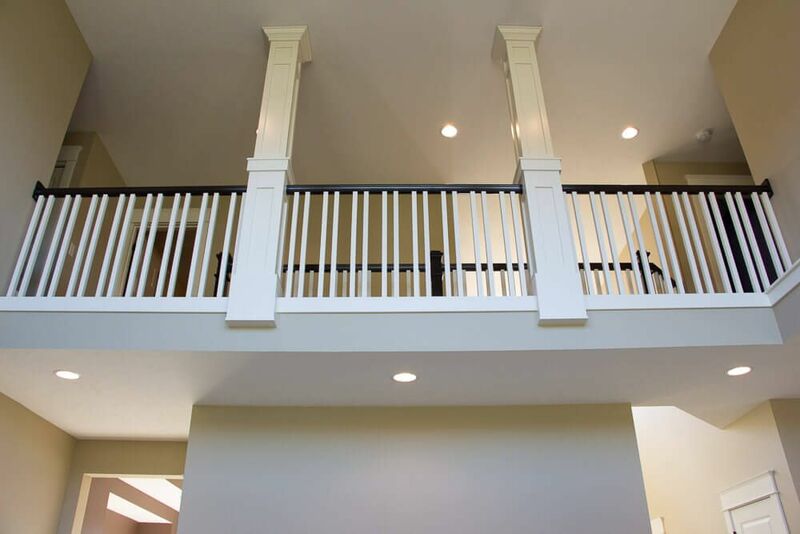 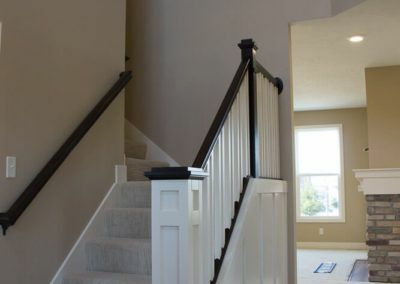 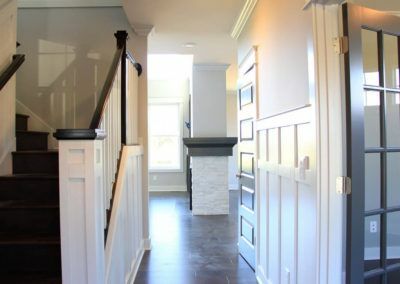 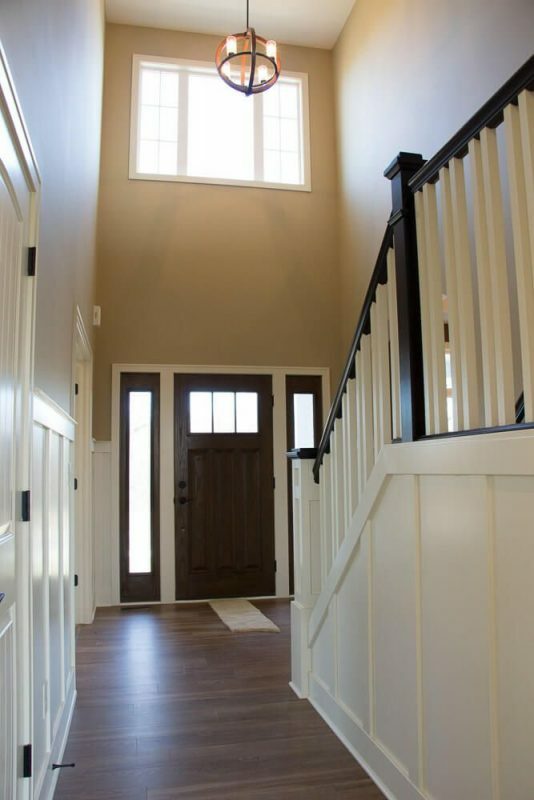 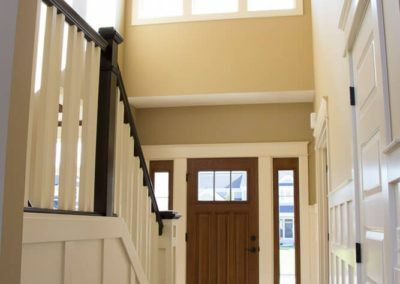 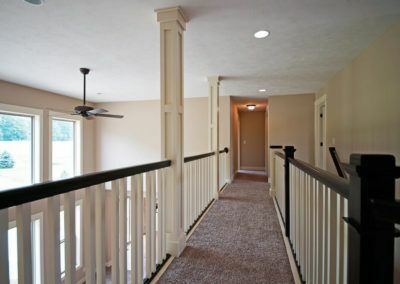 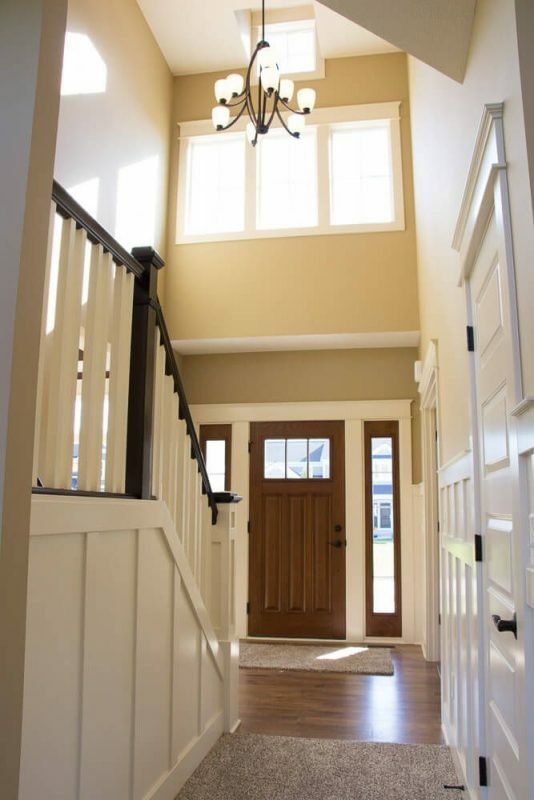 The stairway in the Jamestown’s front foyer leads to the home’s upper level. 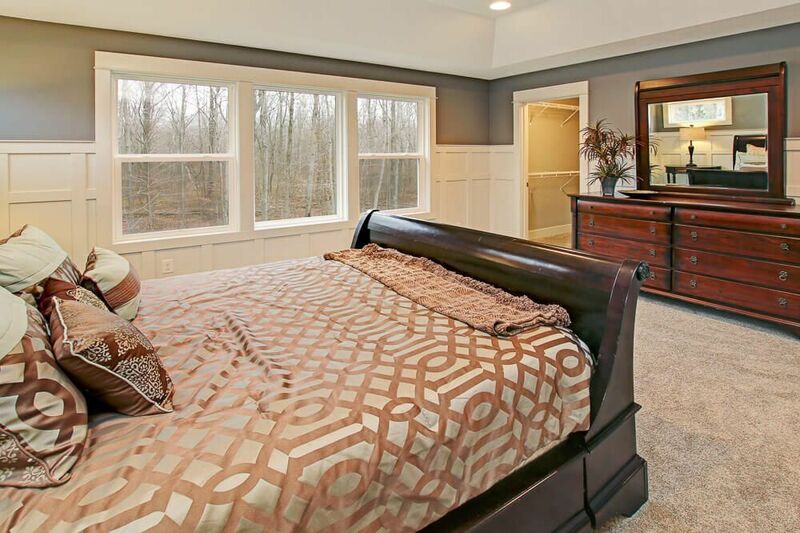 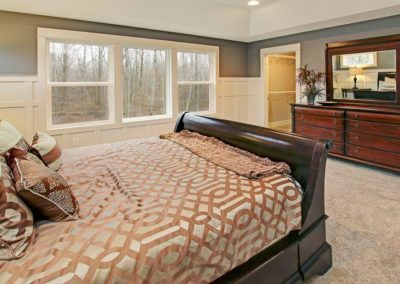 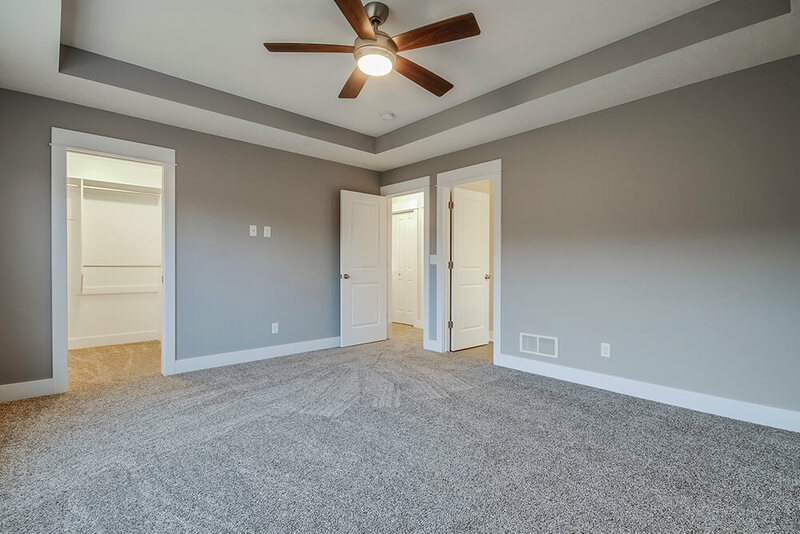 The upstairs master suite incorporates the master bedroom with optional tray ceiling, a generous walk-in closet, and a four-piece bathroom with double sink, step-in shower, and soaking tub. 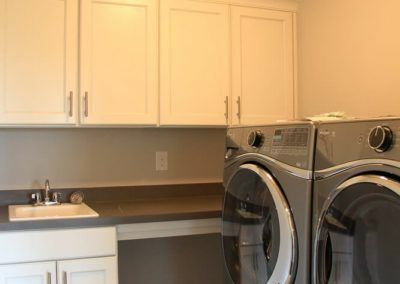 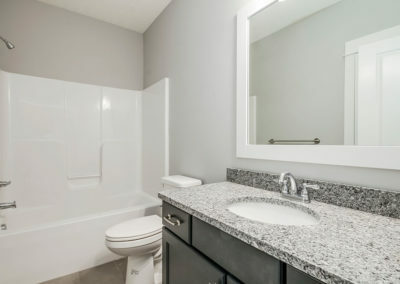 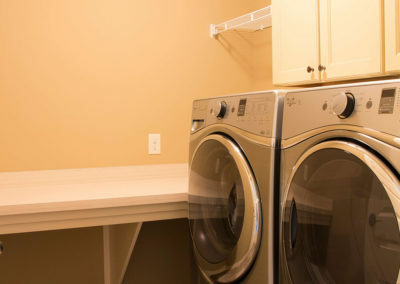 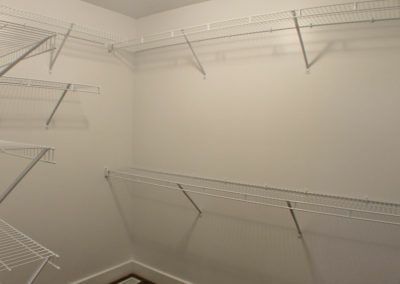 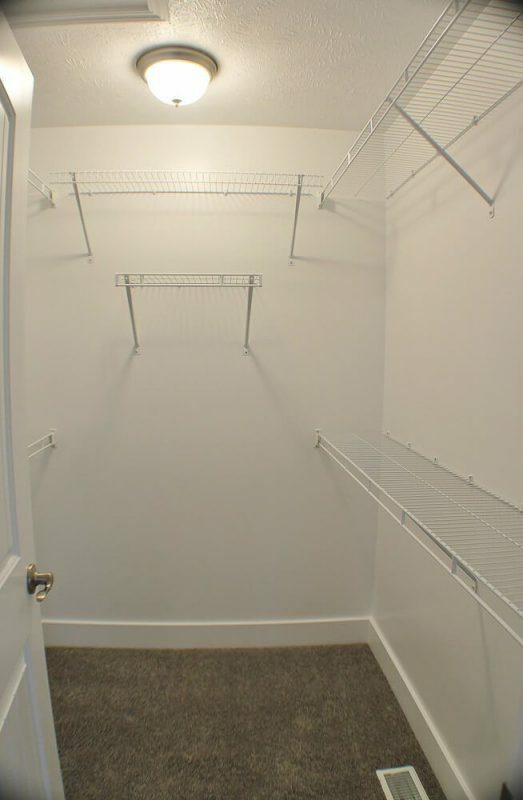 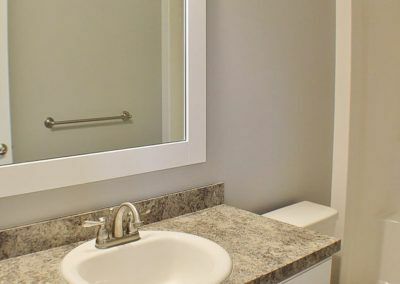 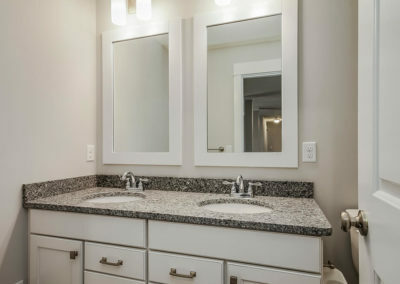 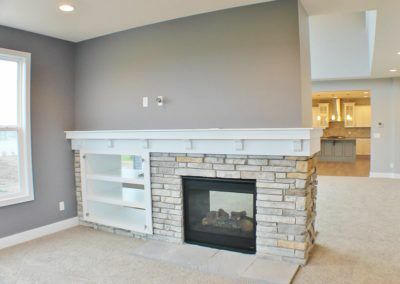 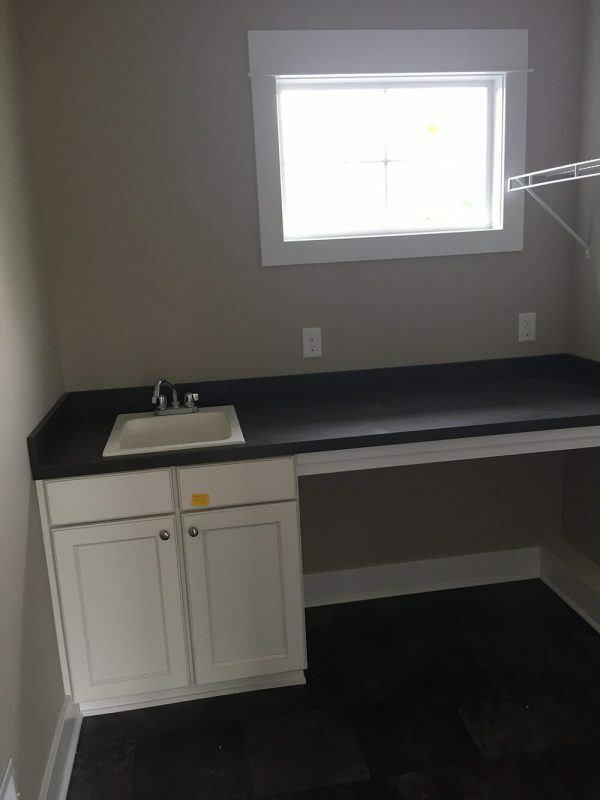 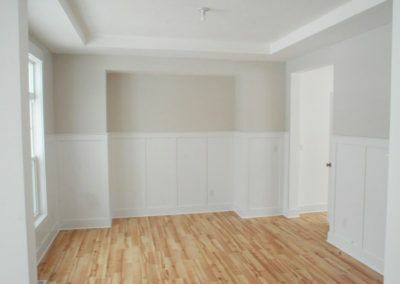 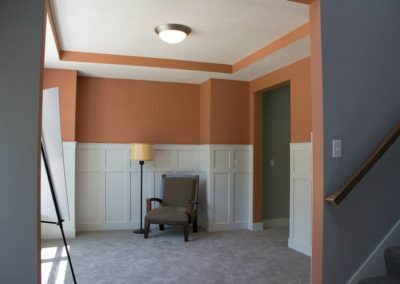 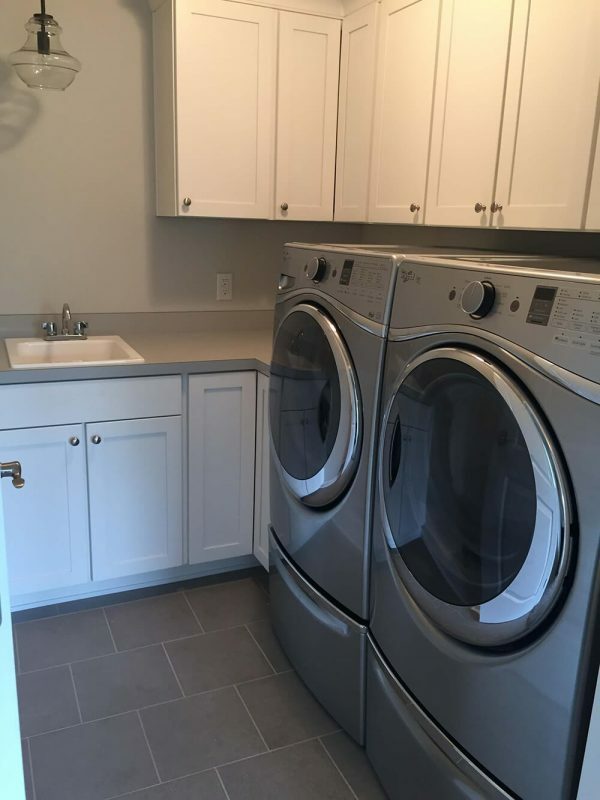 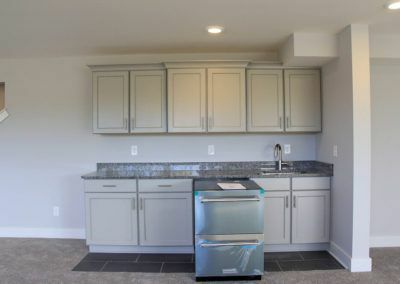 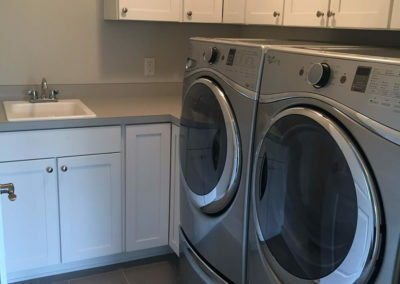 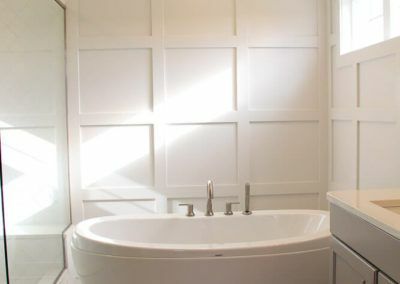 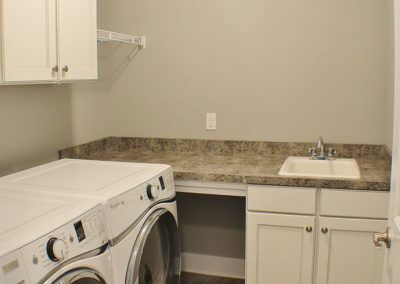 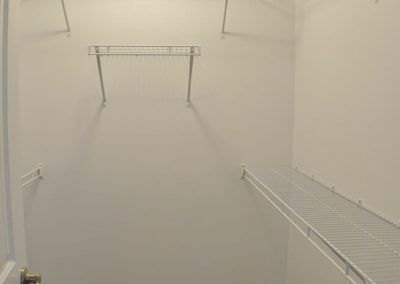 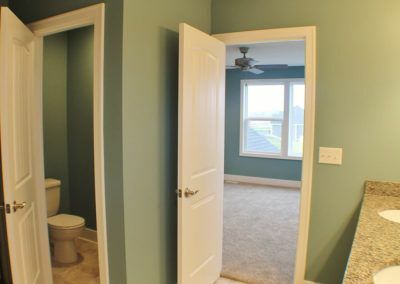 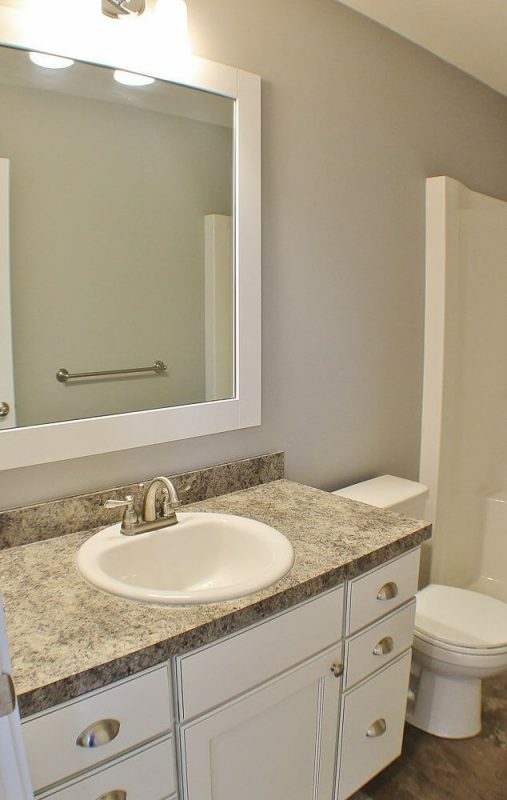 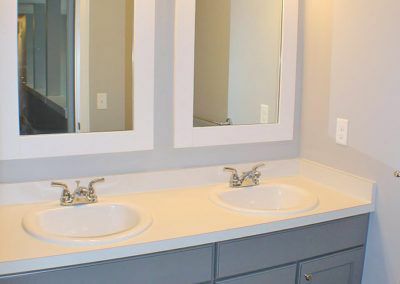 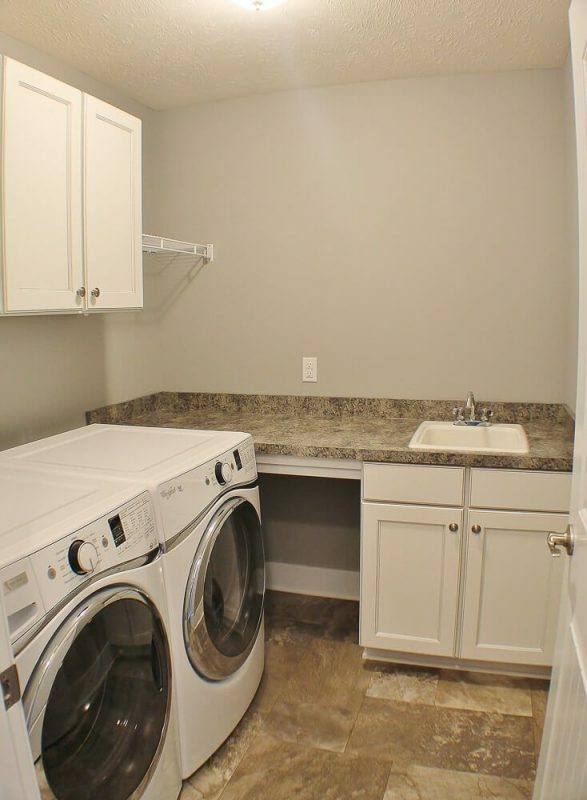 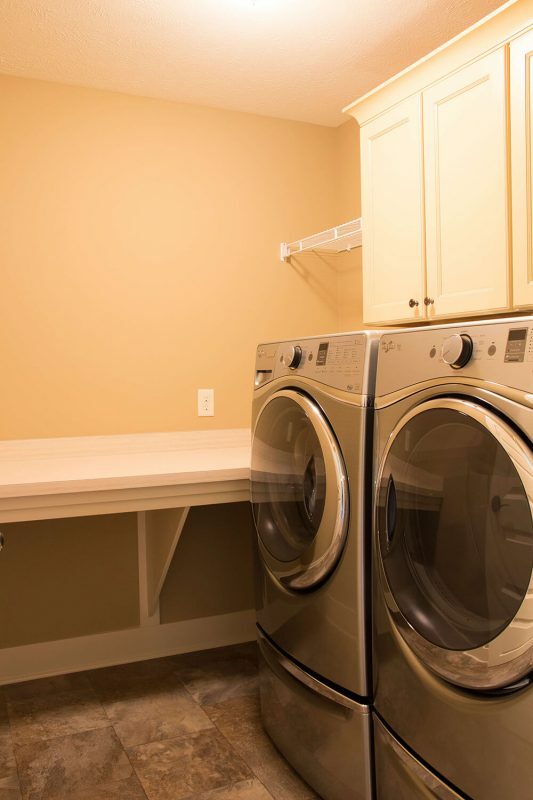 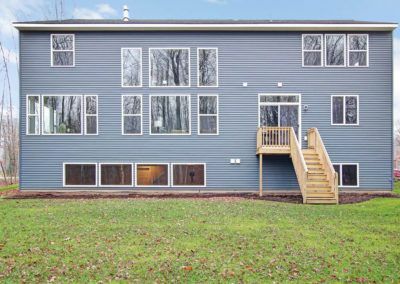 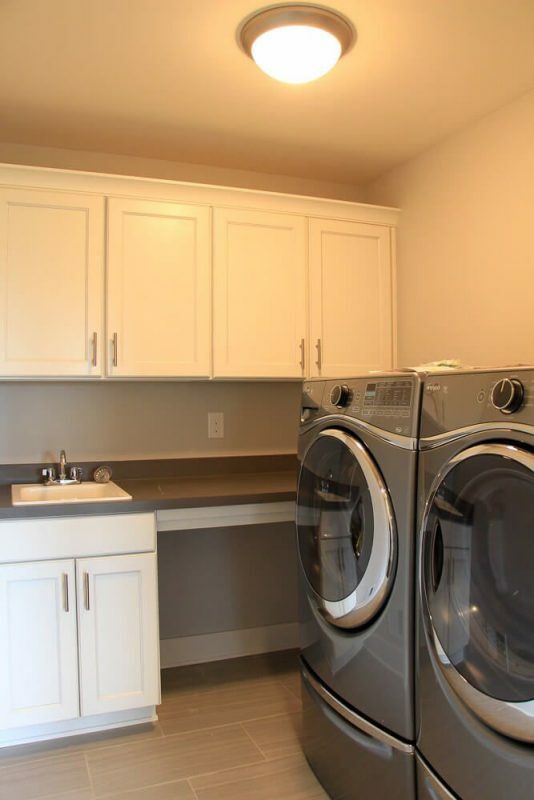 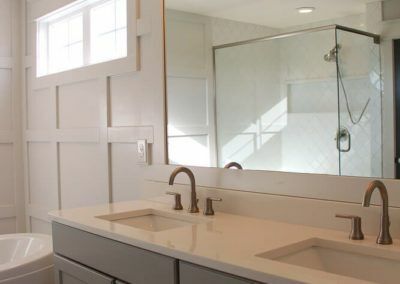 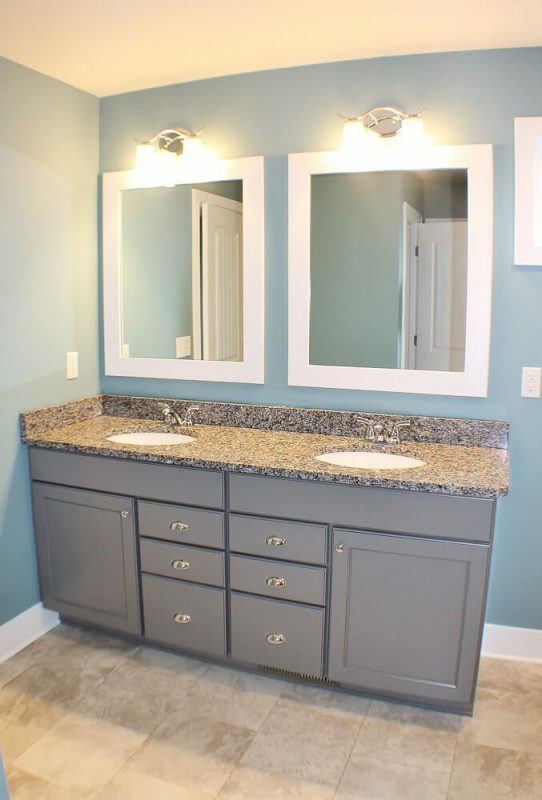 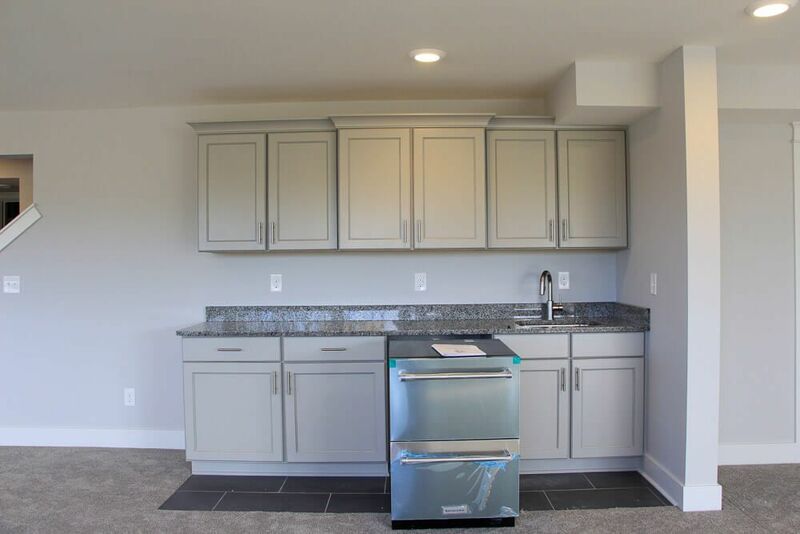 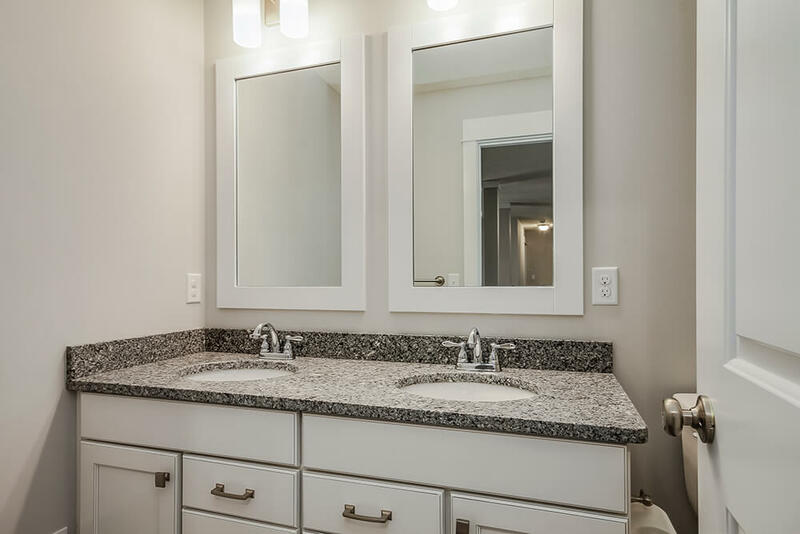 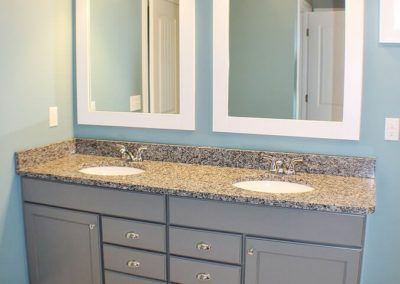 The upper level also has three more bedrooms with their own closet space, another full bathroom, and a conveniently located laundry room with optional folding counter and laundry sink. 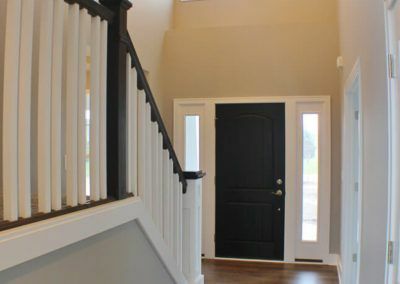 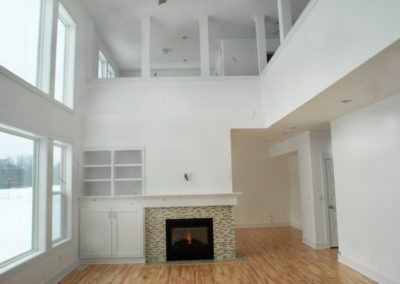 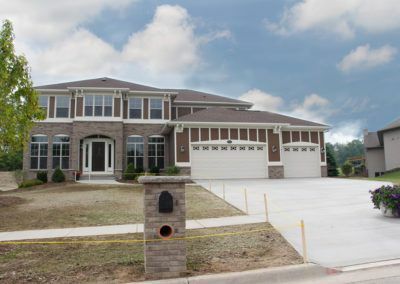 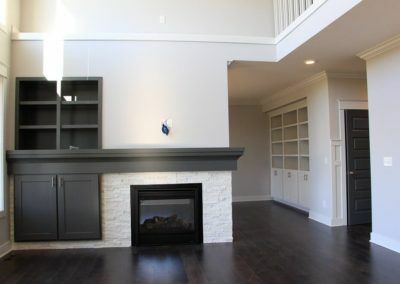 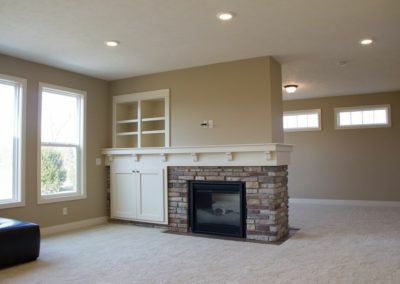 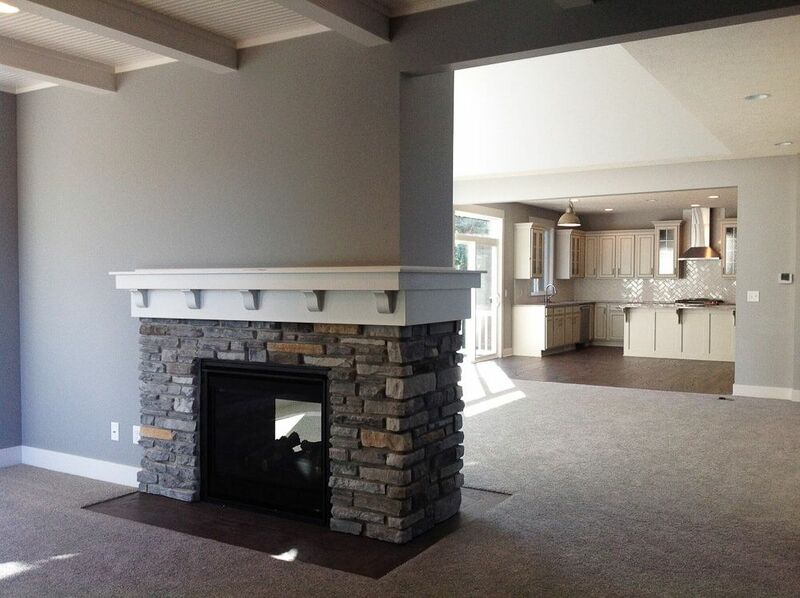 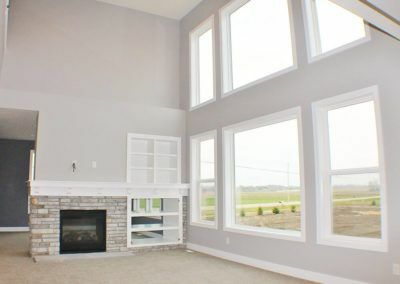 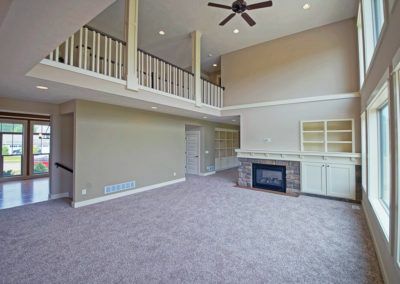 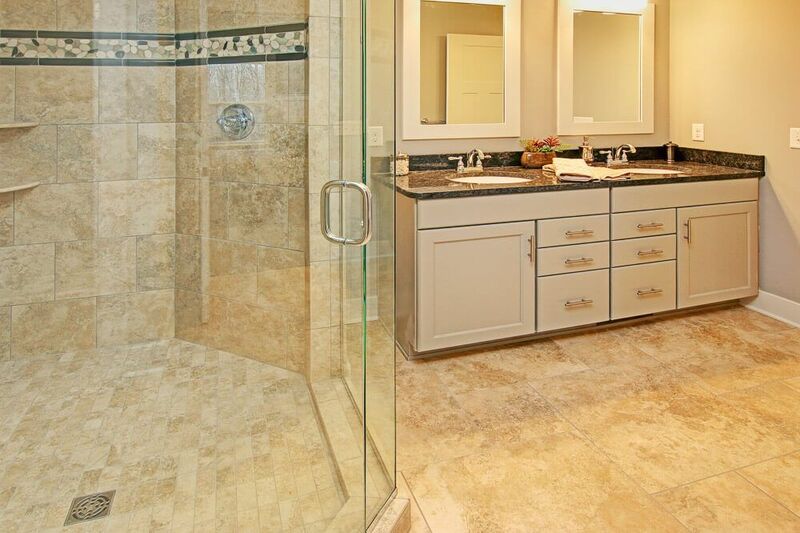 The Jamestown home plan also includes a lower level. 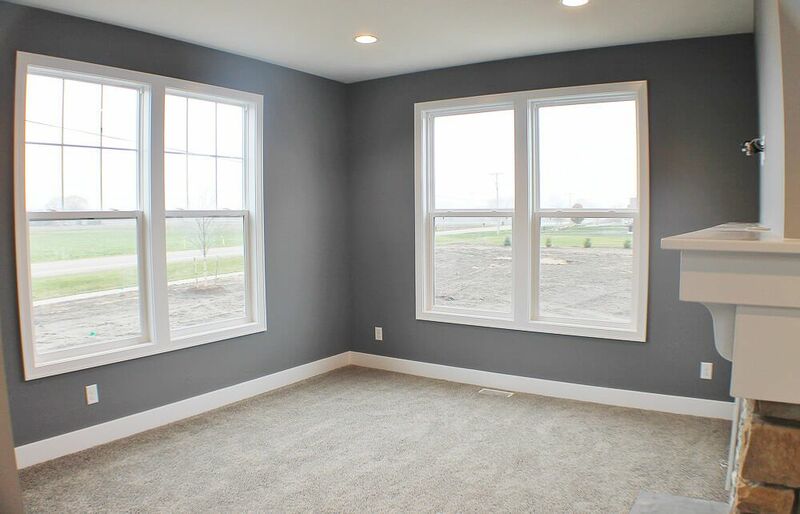 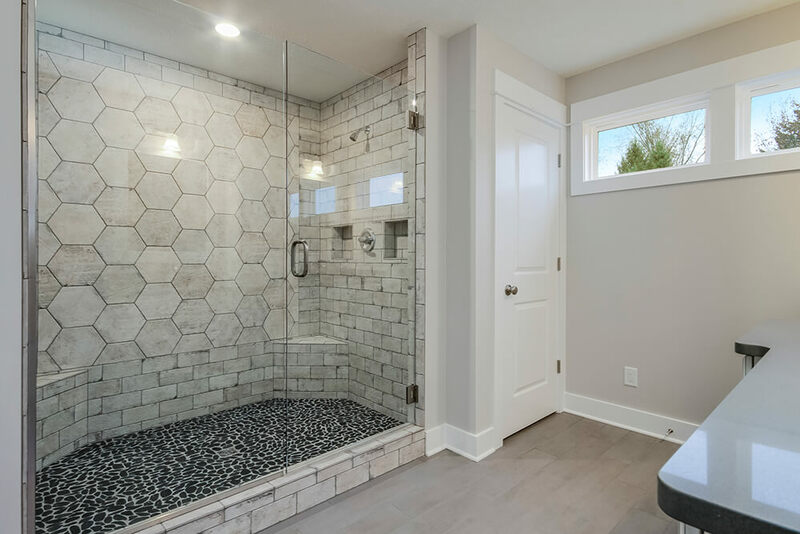 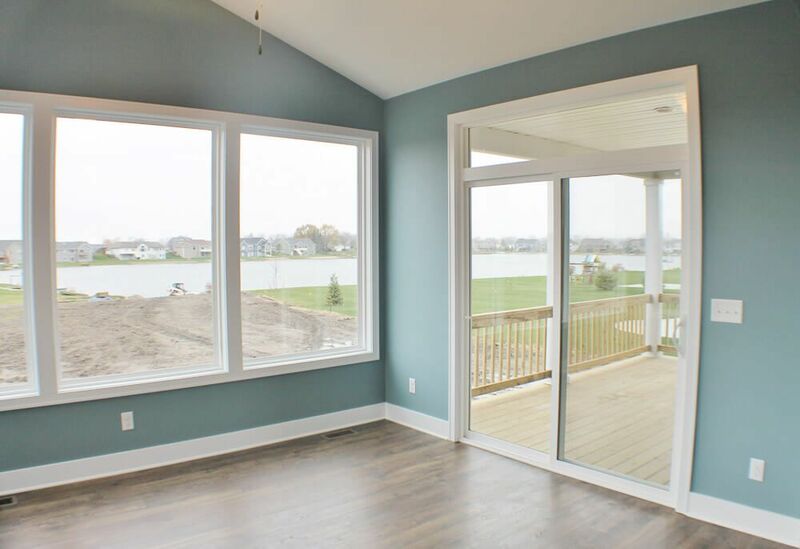 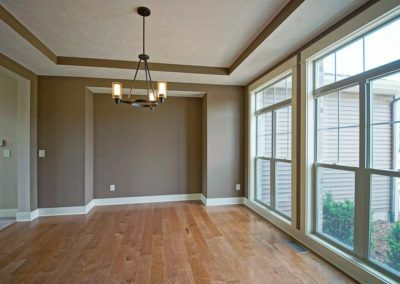 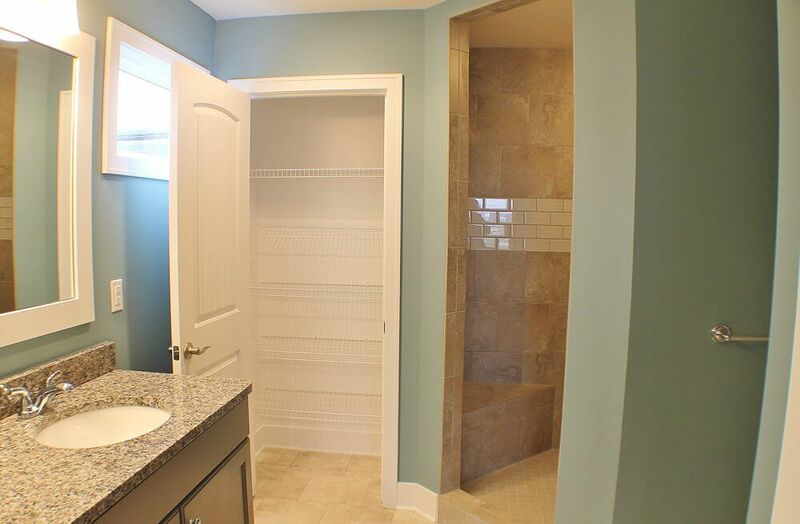 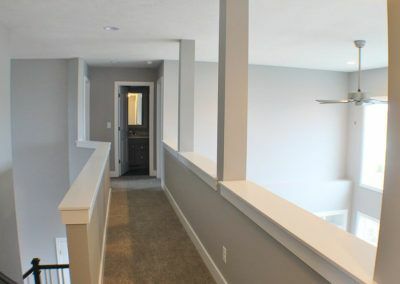 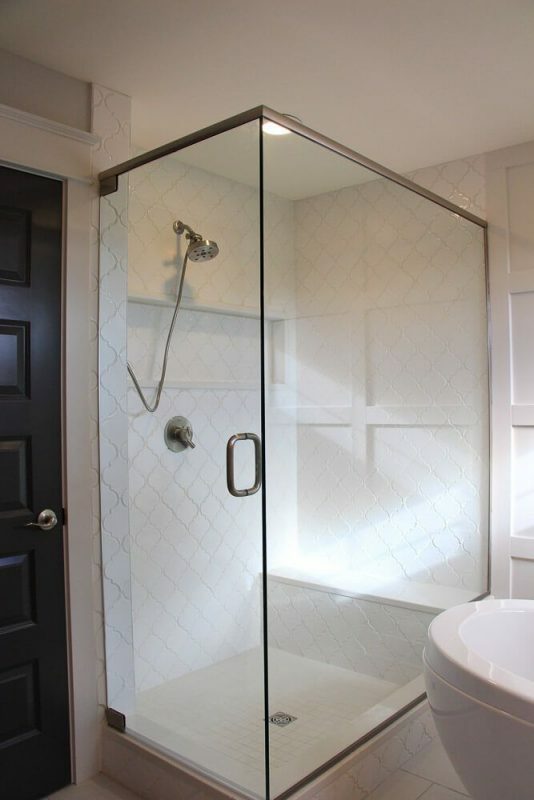 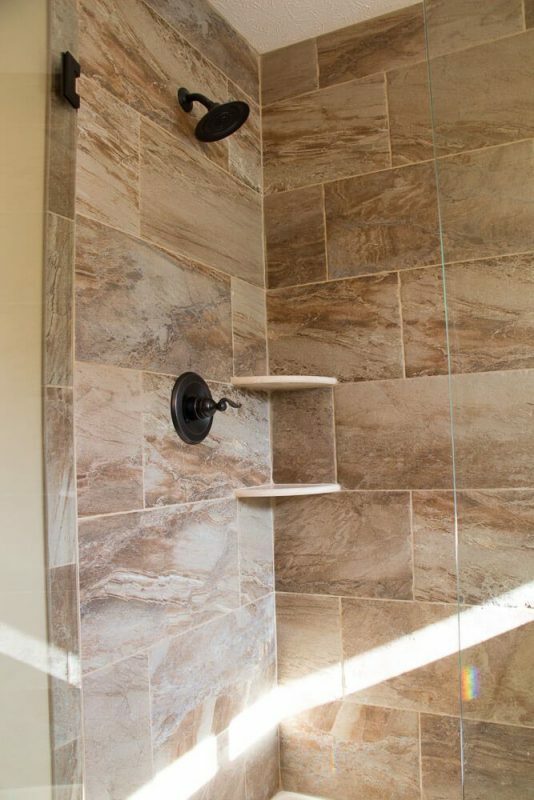 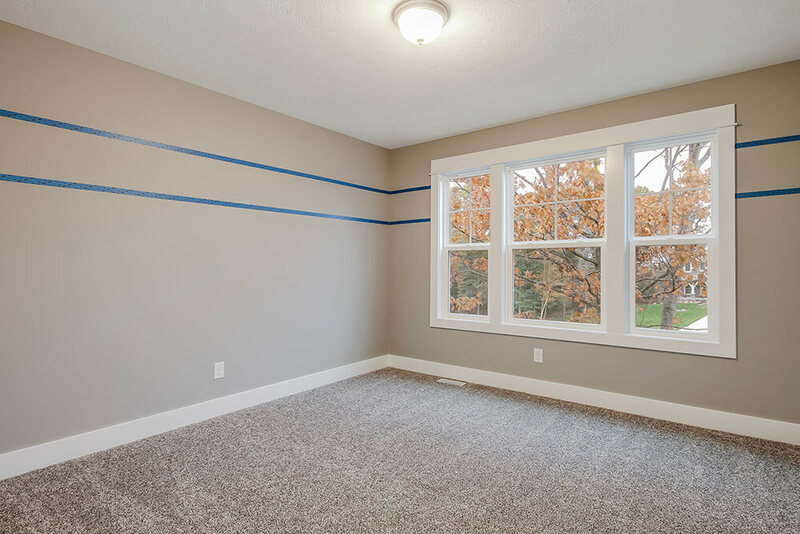 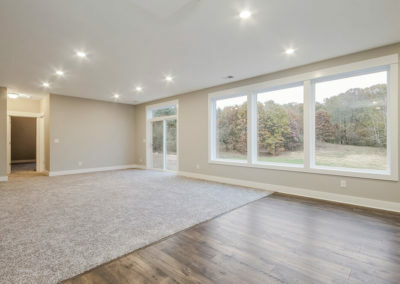 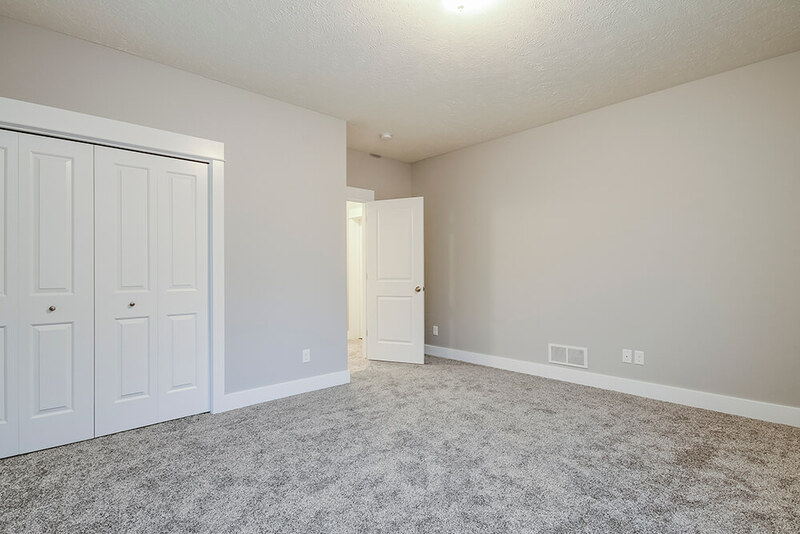 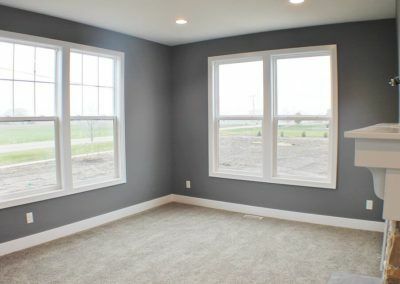 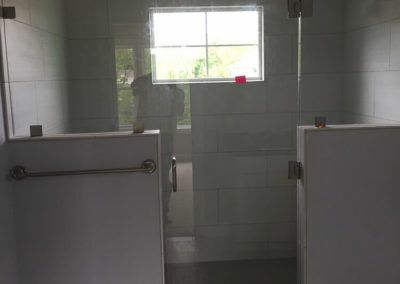 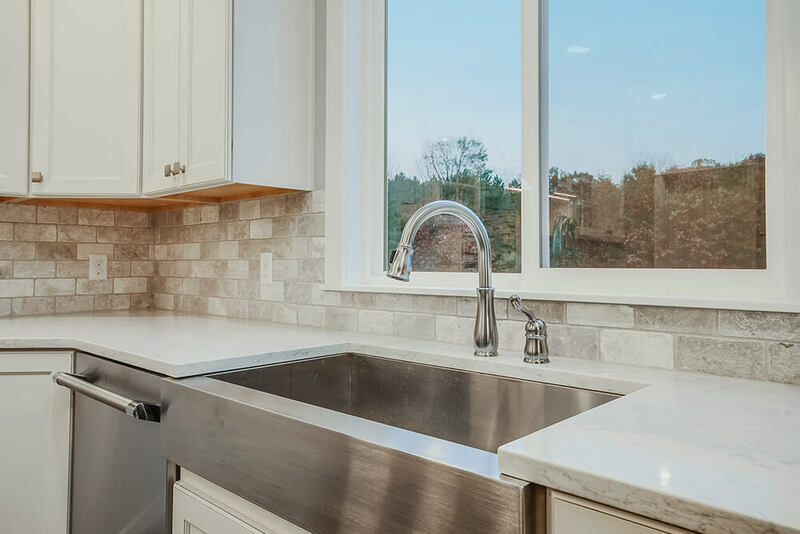 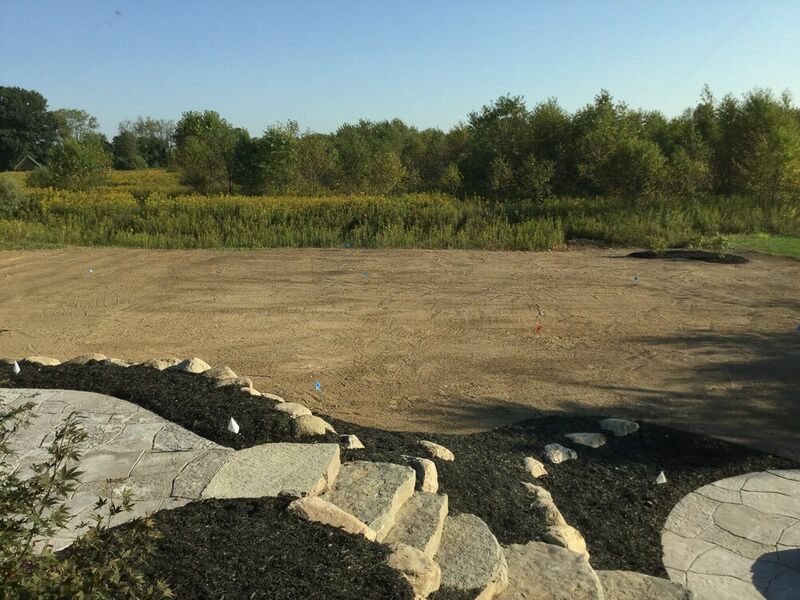 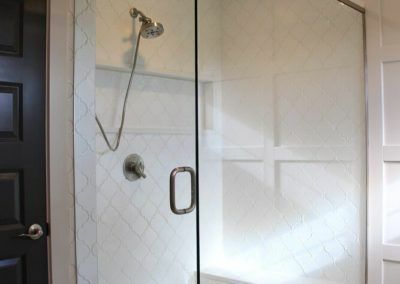 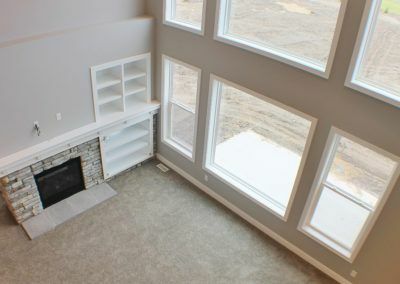 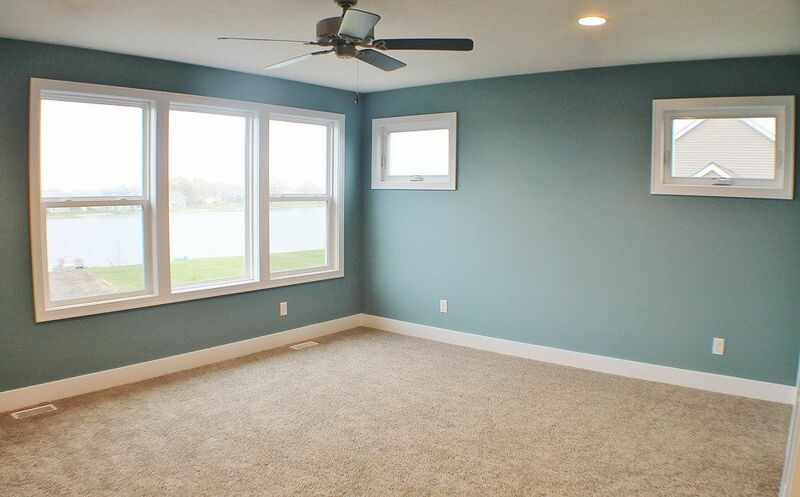 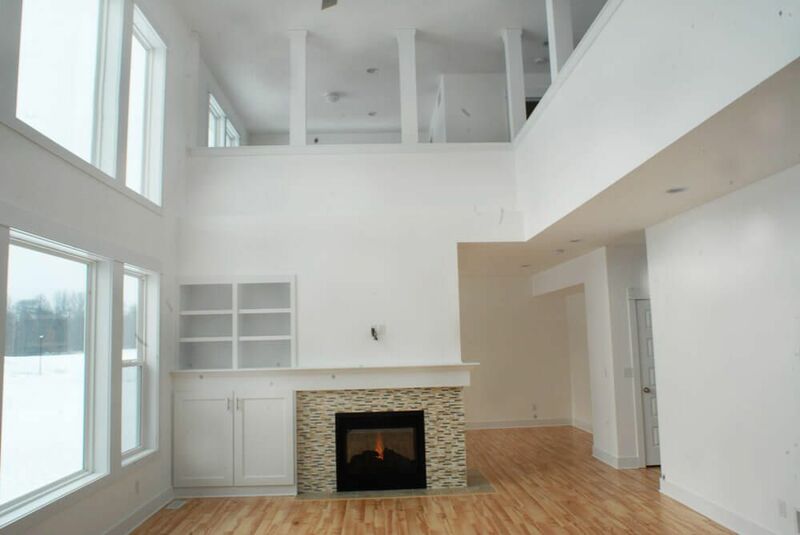 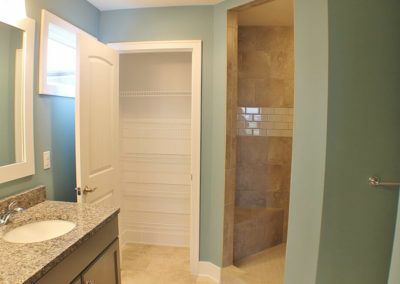 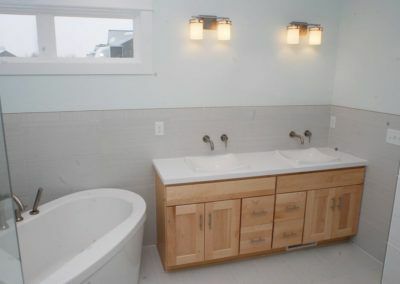 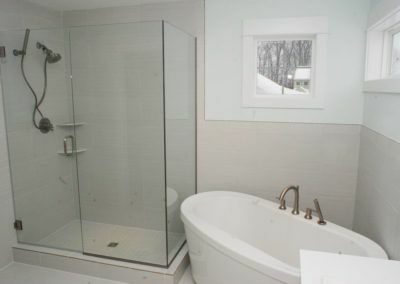 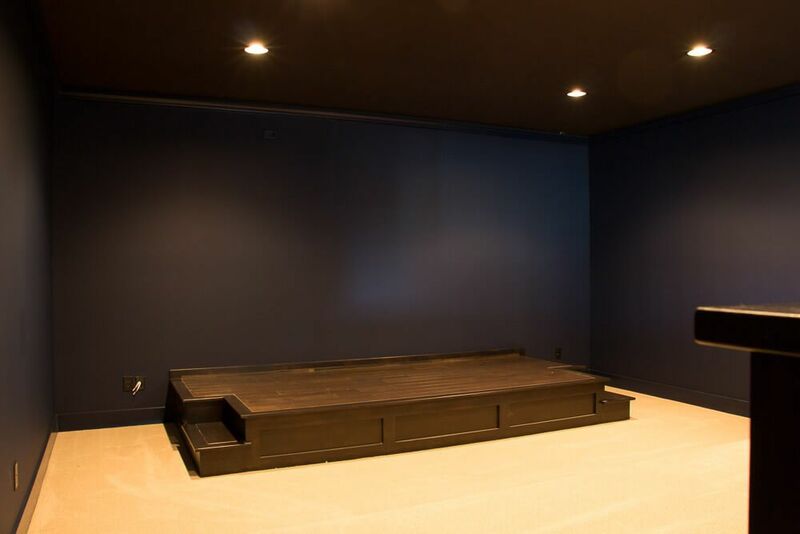 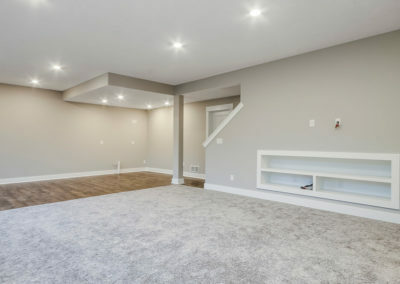 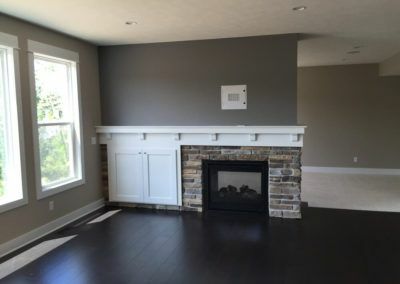 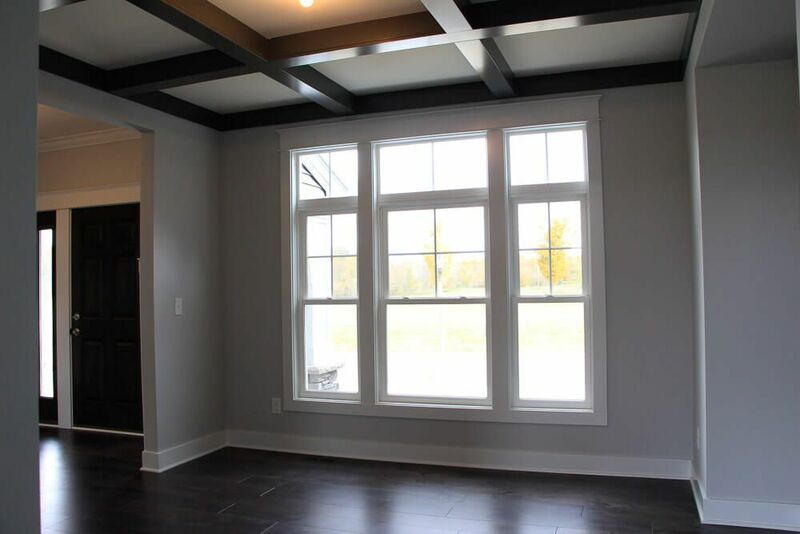 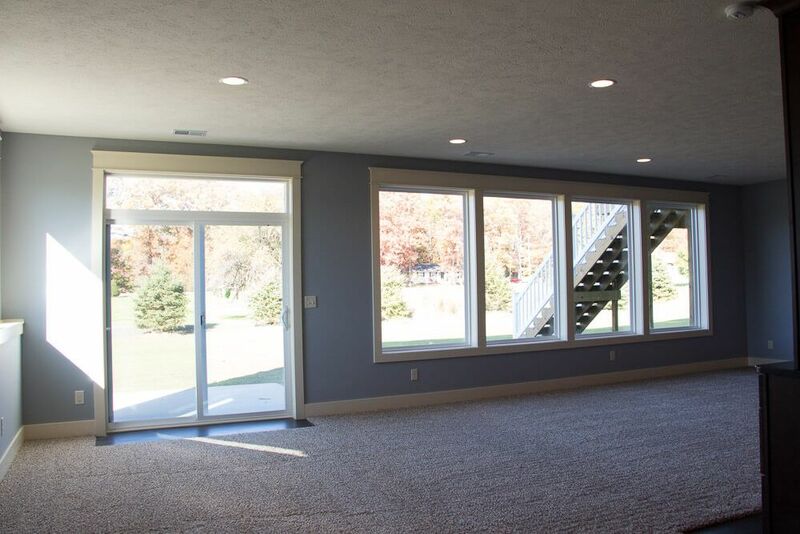 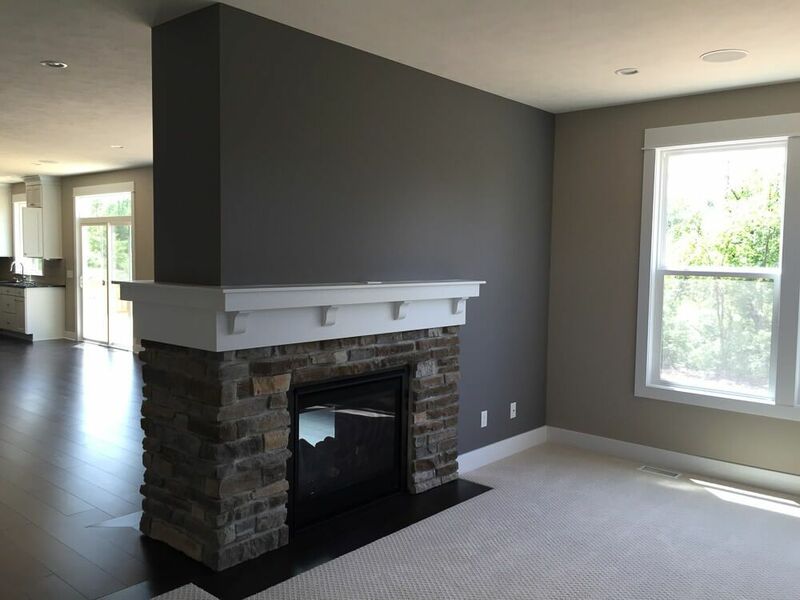 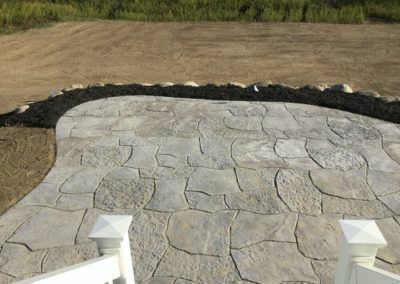 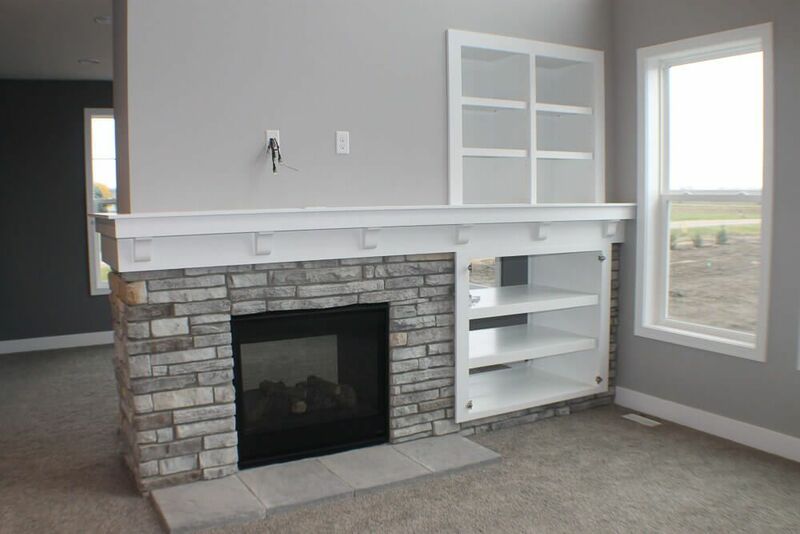 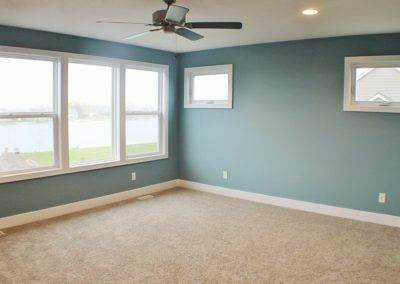 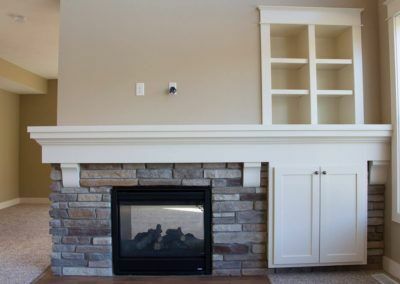 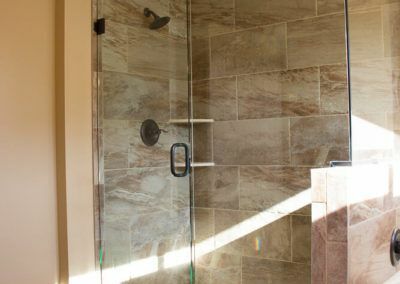 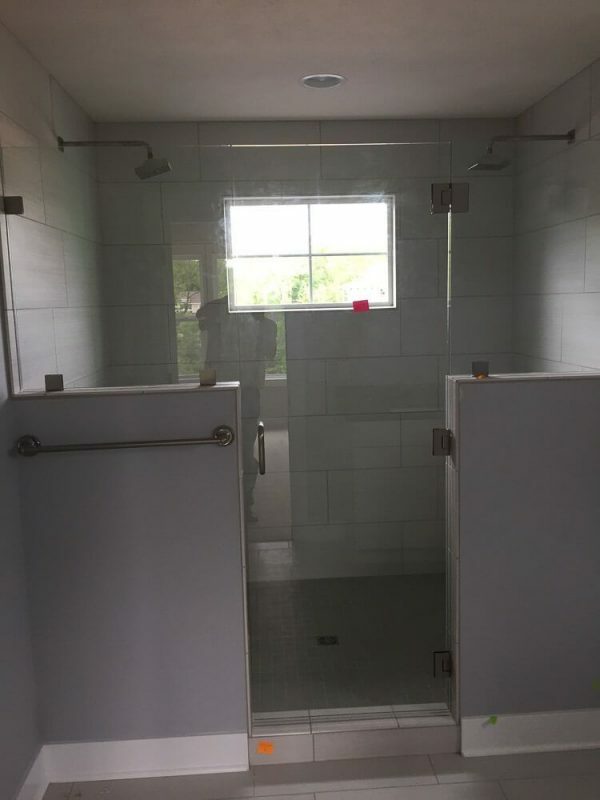 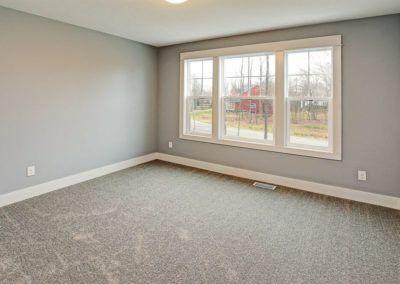 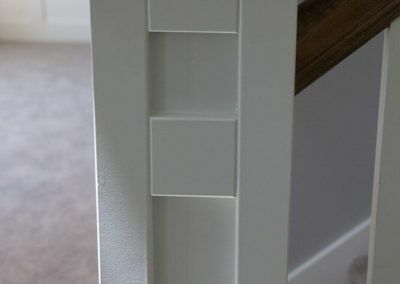 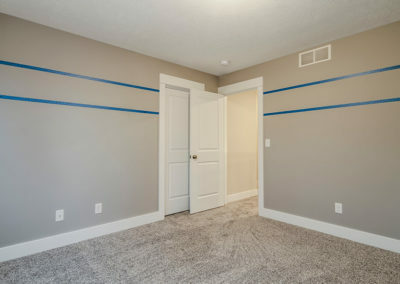 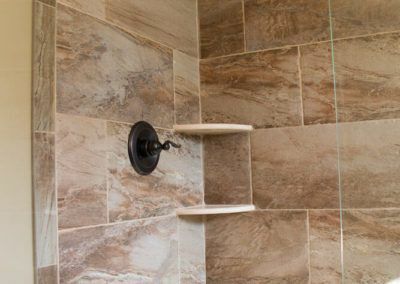 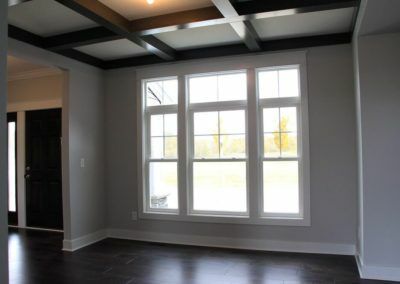 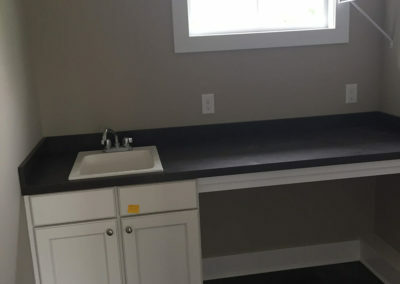 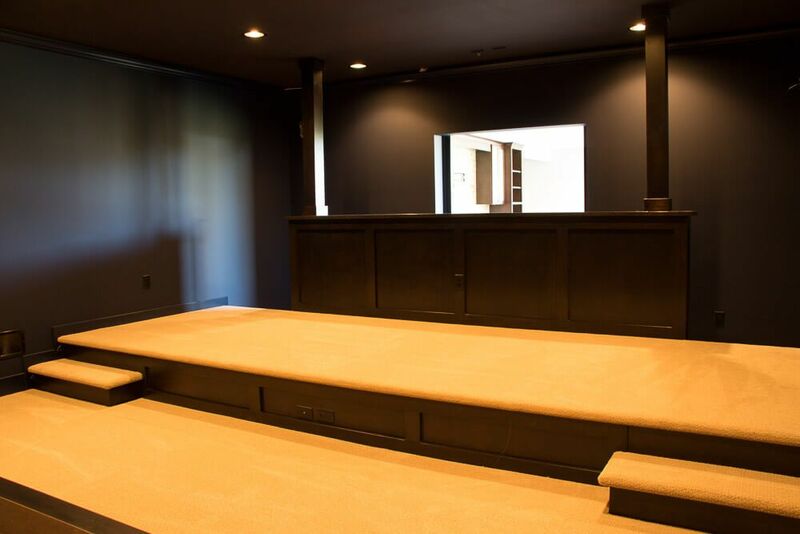 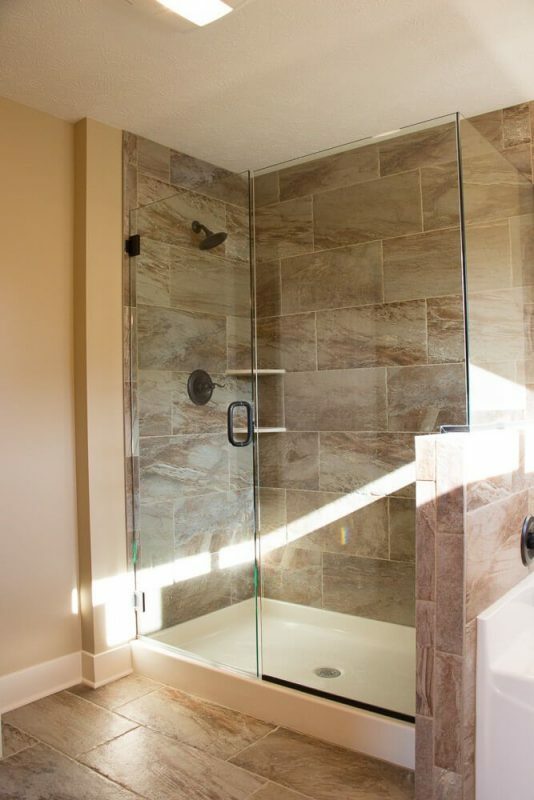 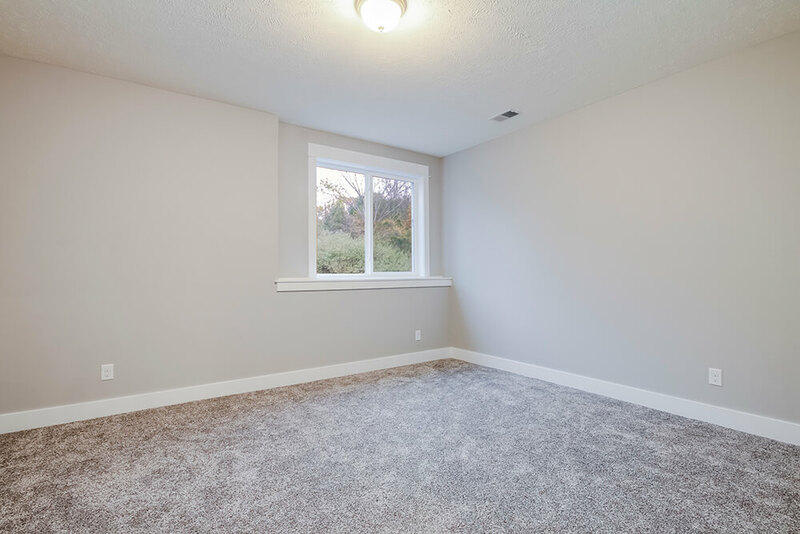 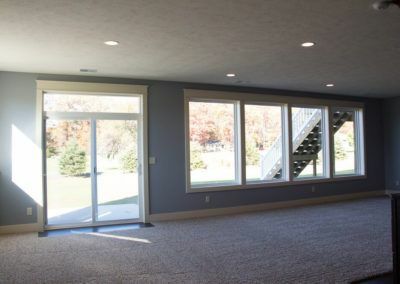 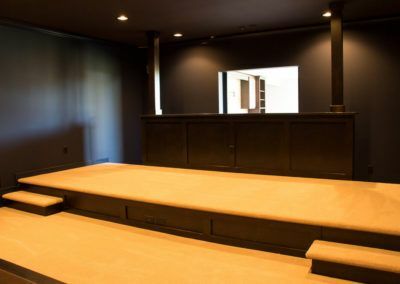 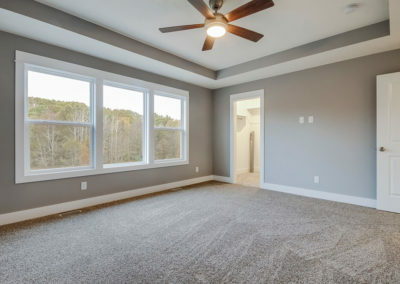 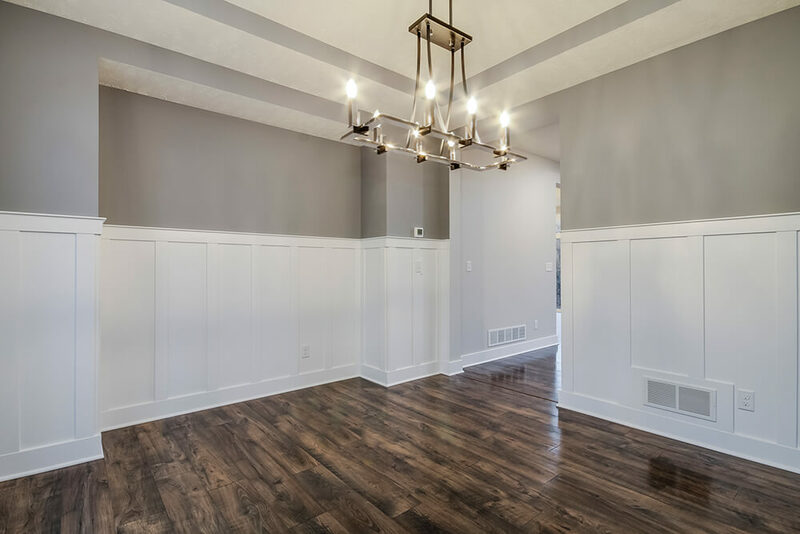 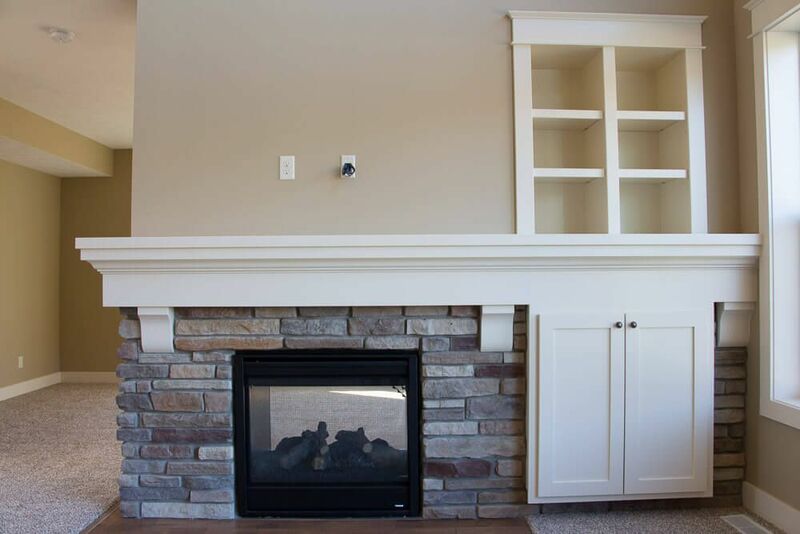 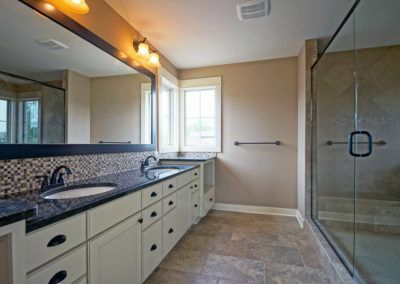 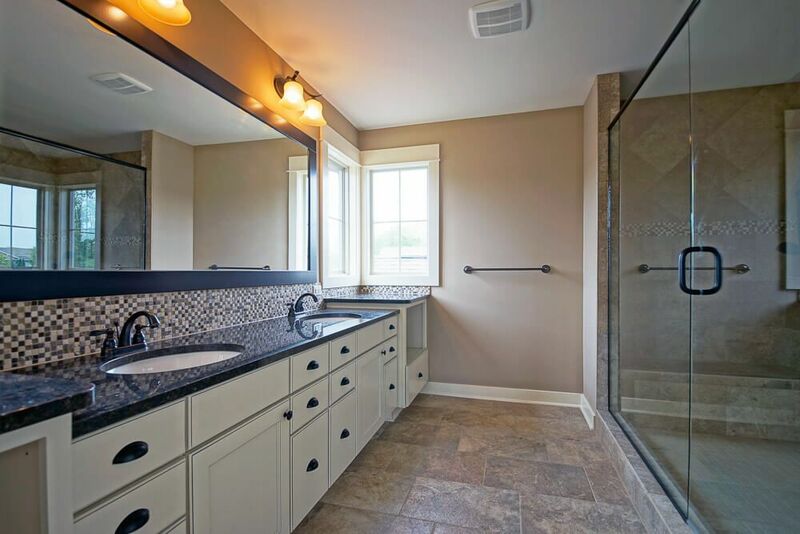 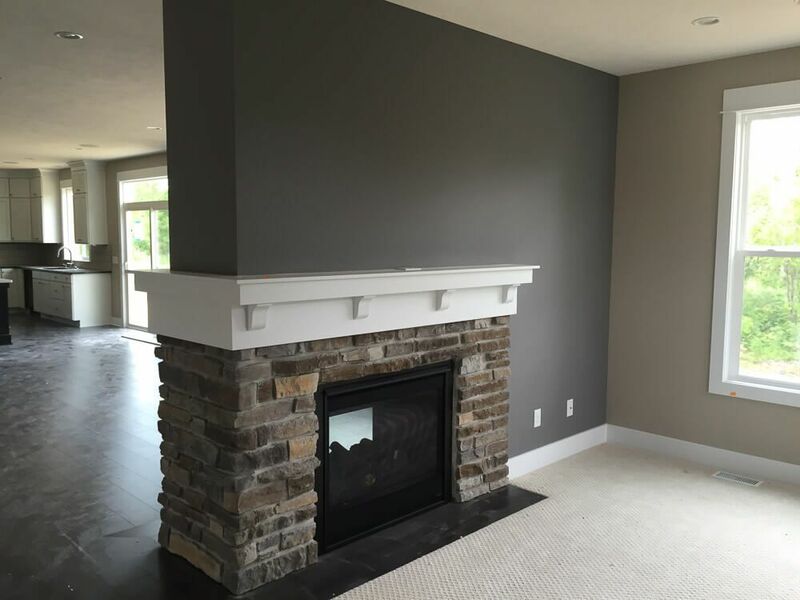 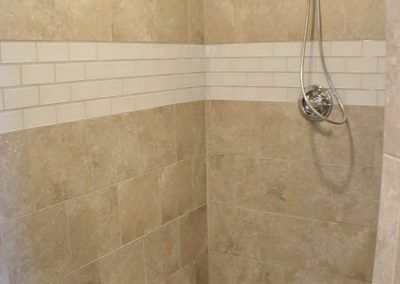 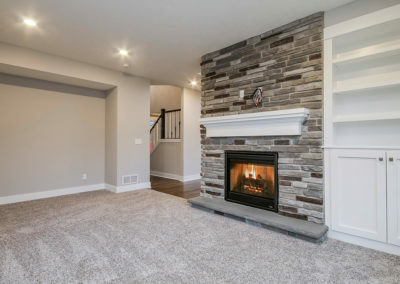 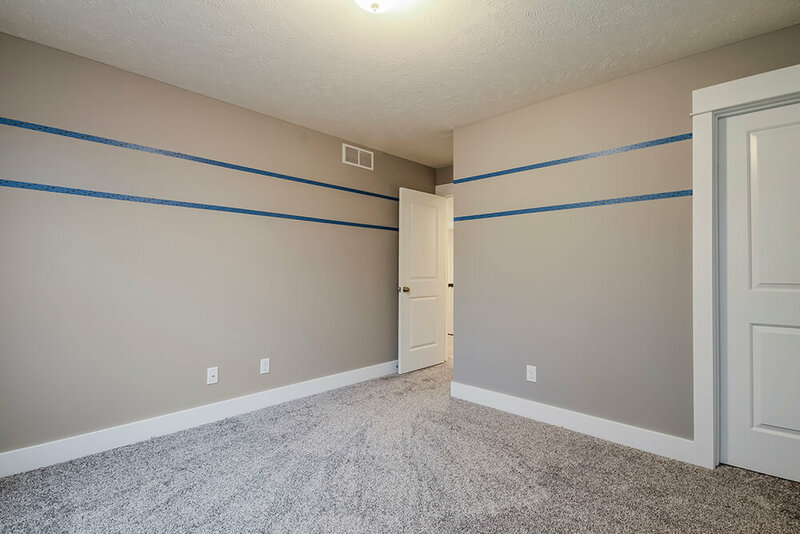 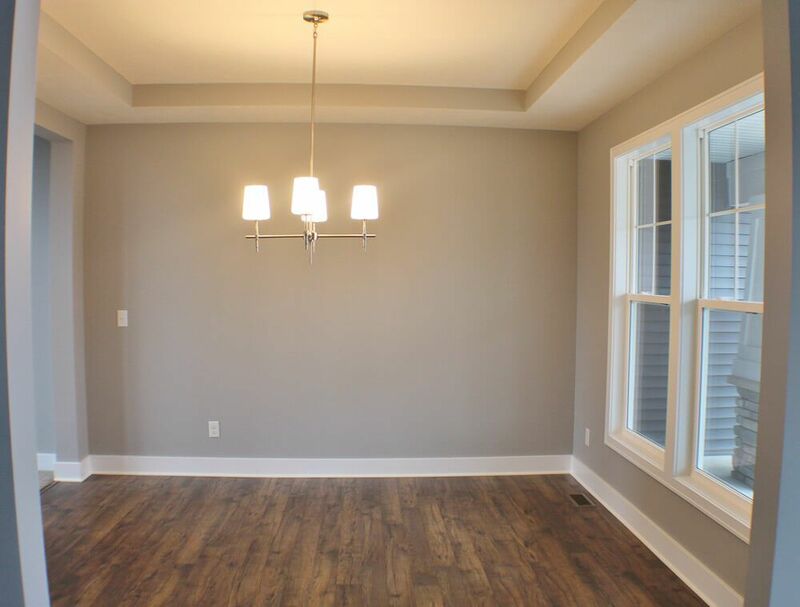 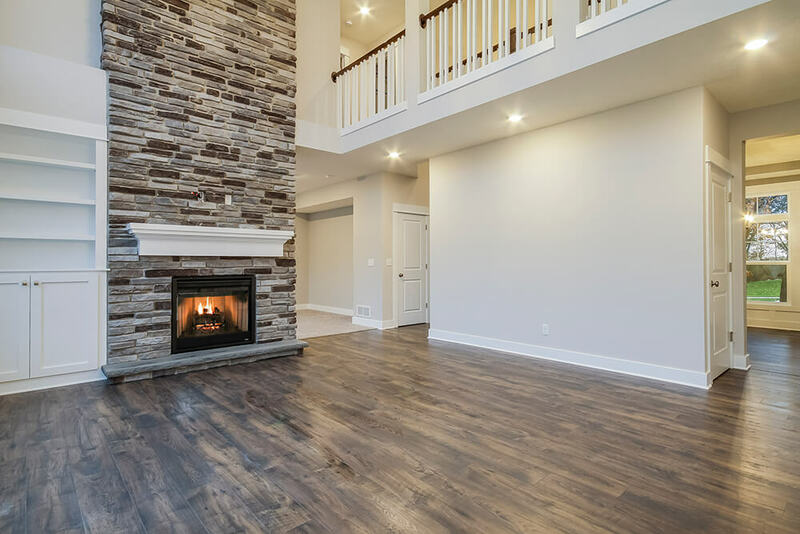 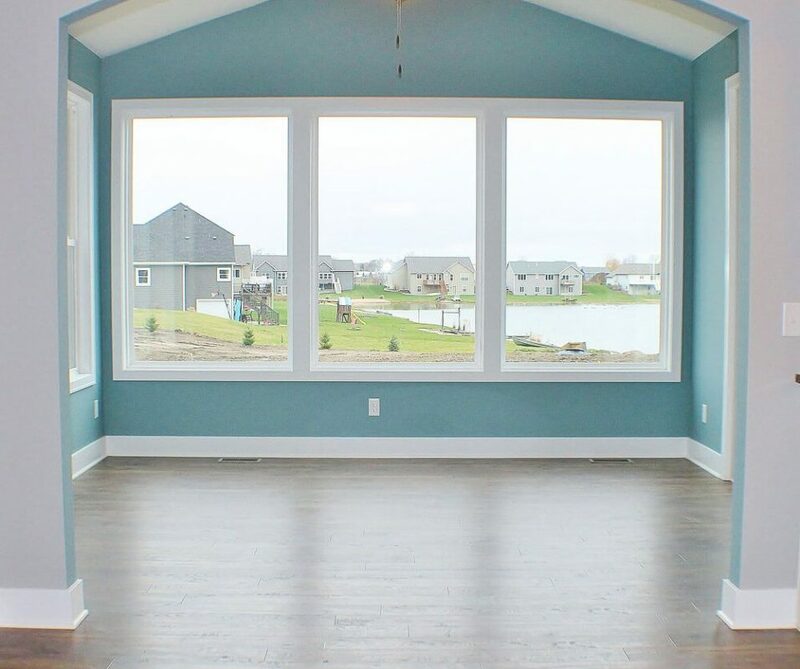 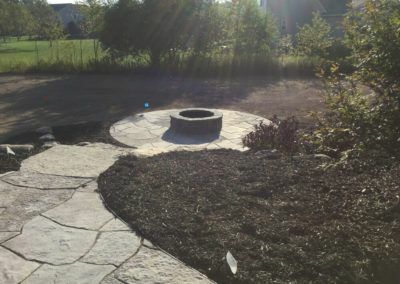 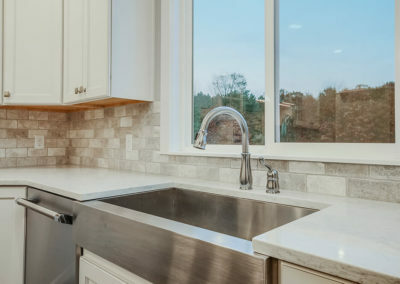 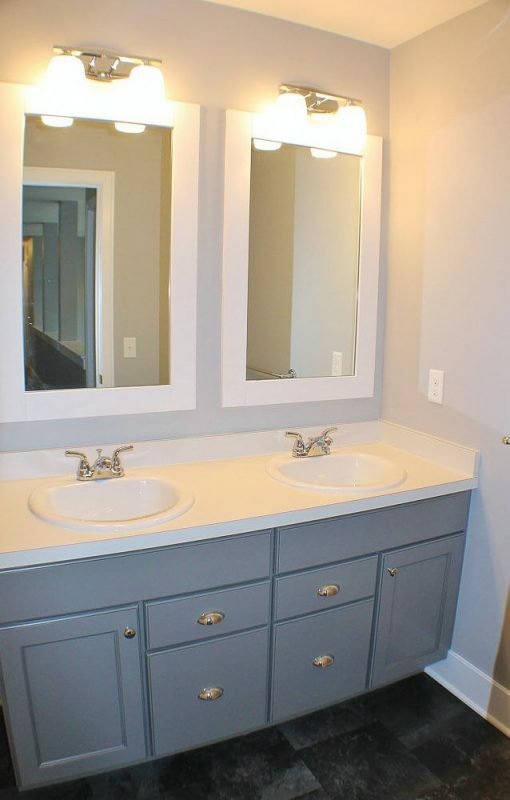 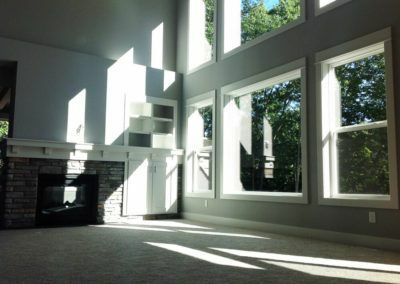 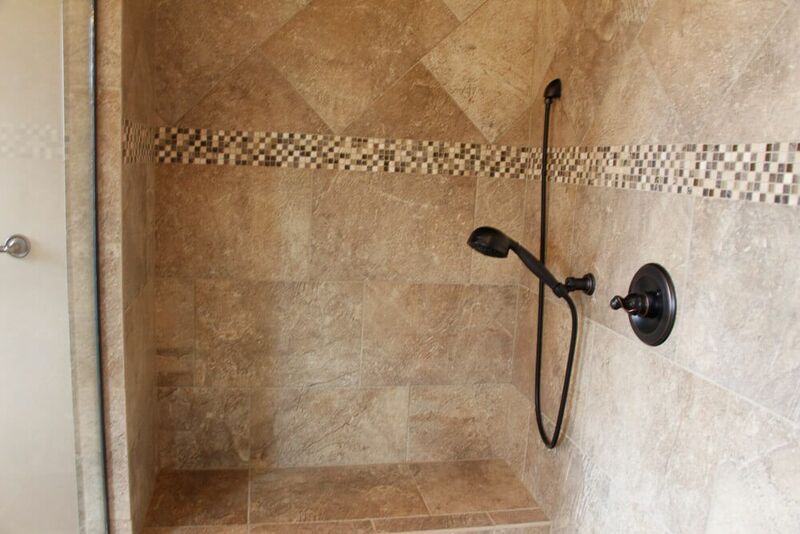 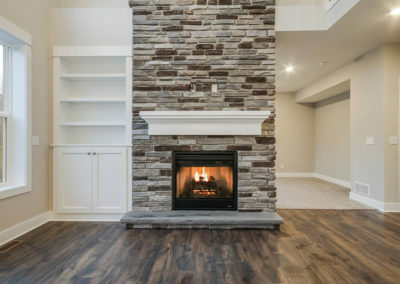 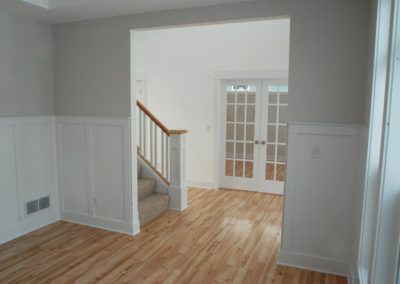 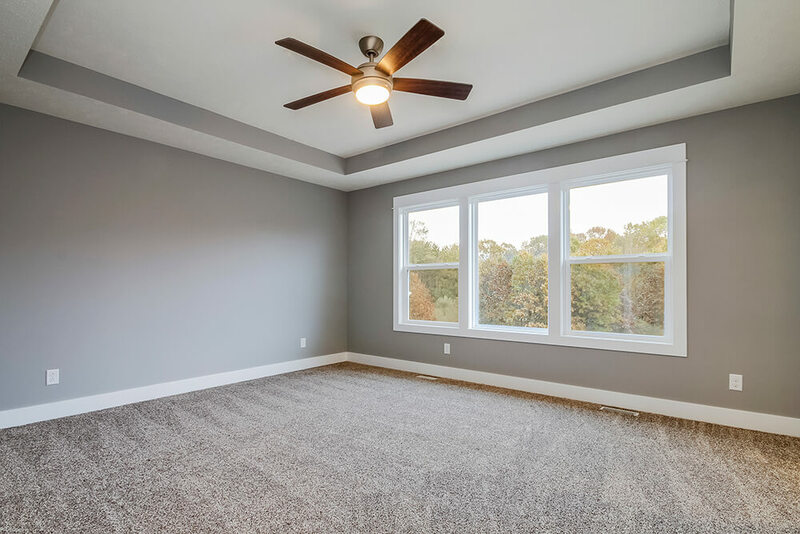 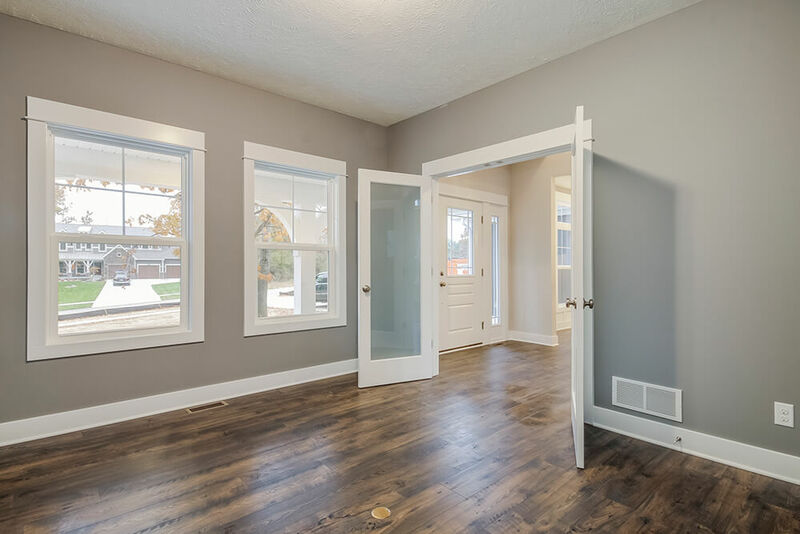 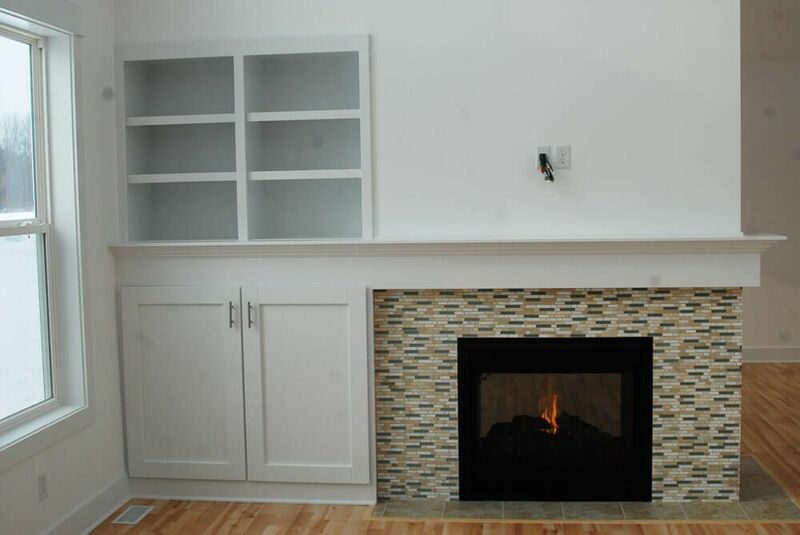 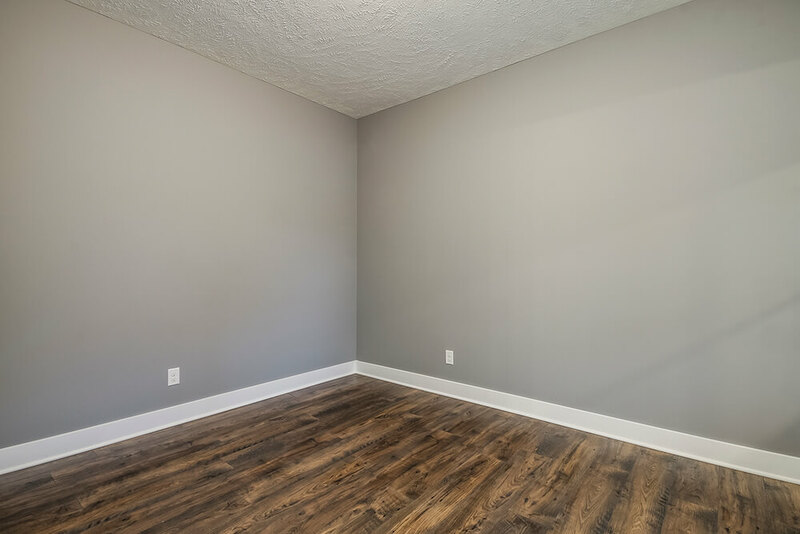 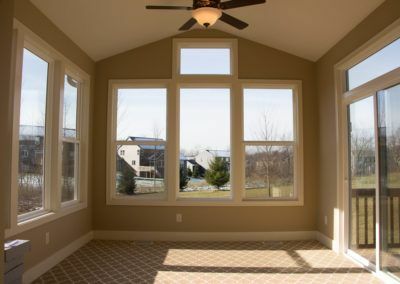 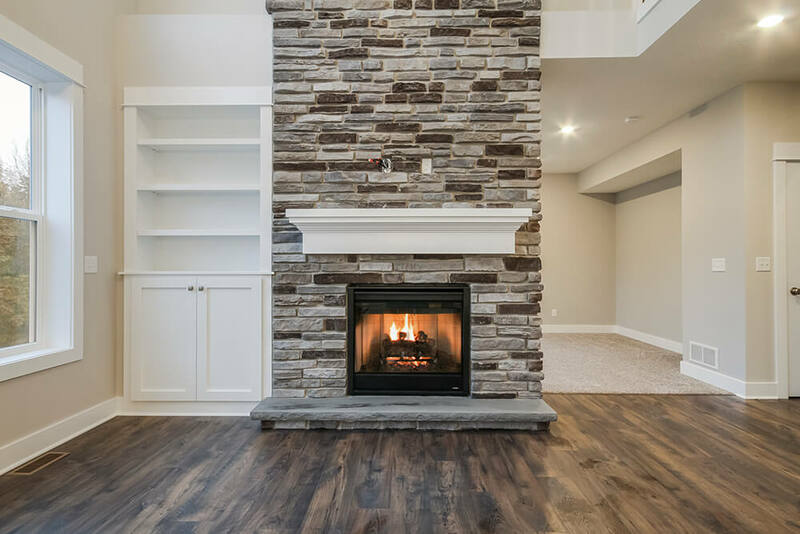 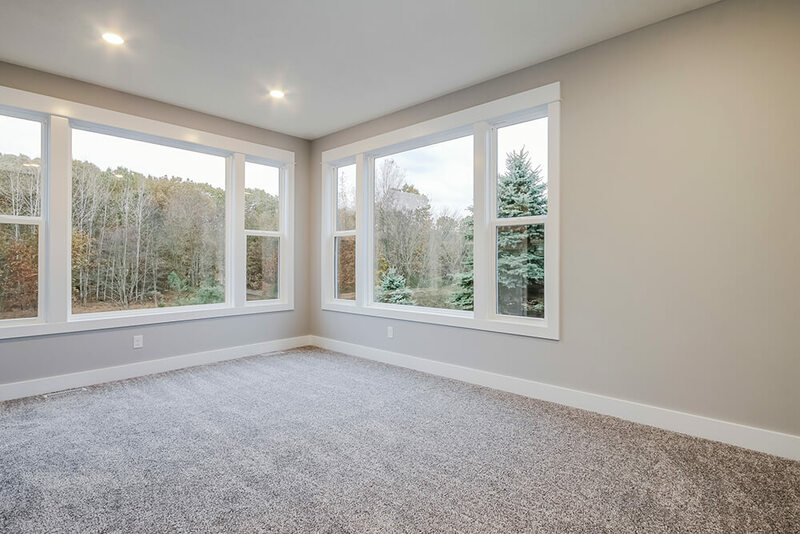 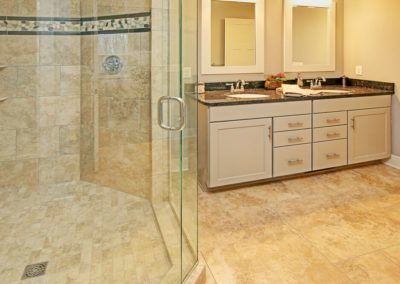 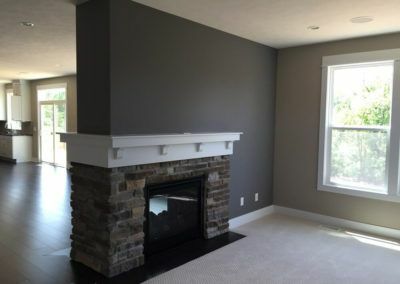 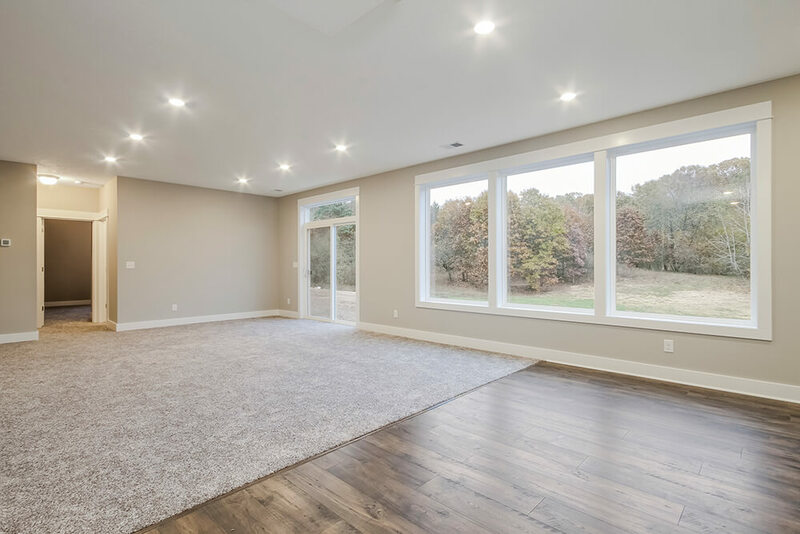 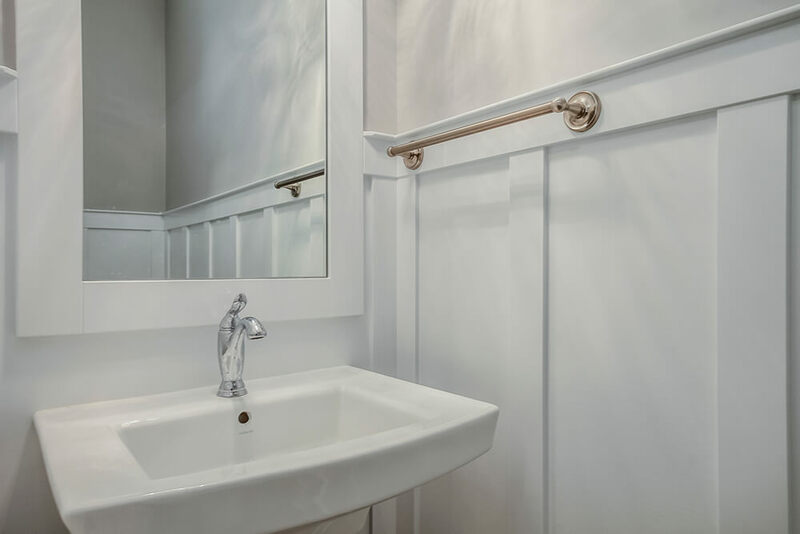 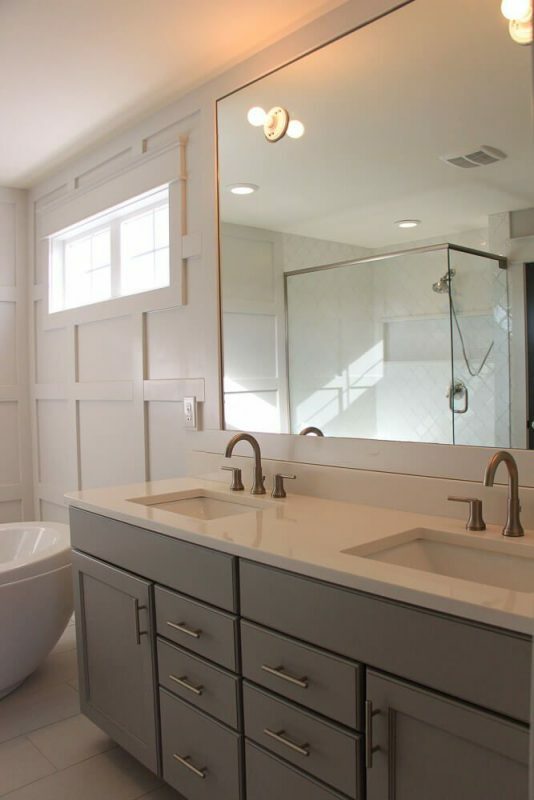 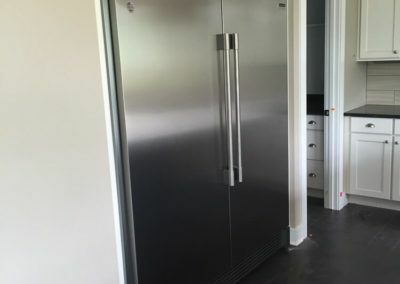 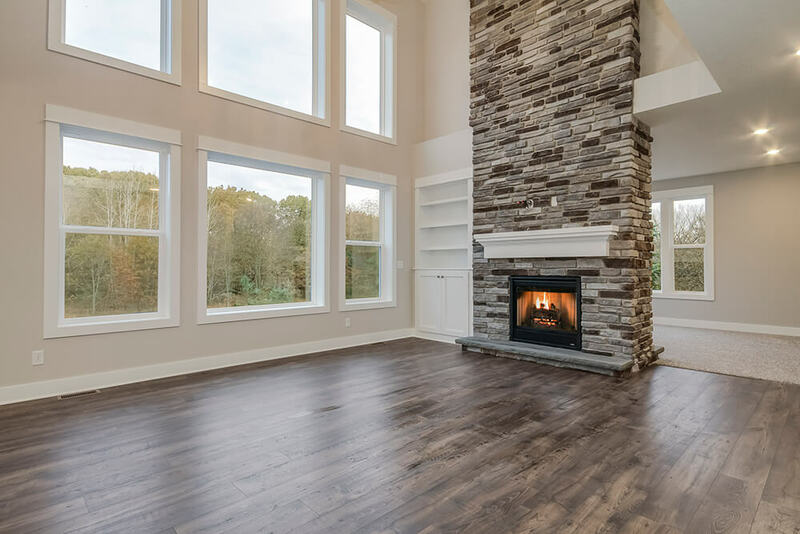 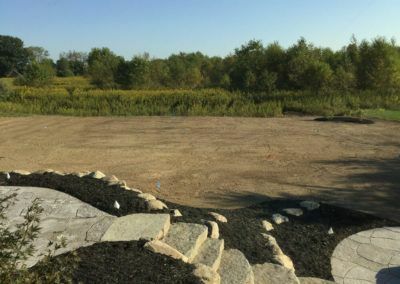 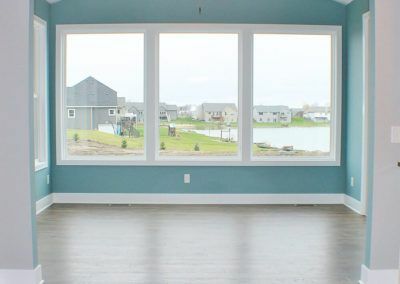 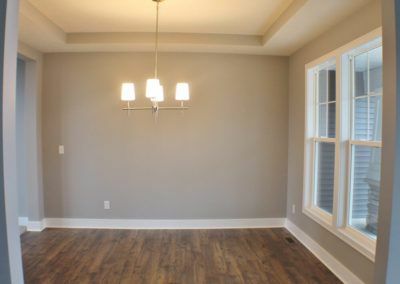 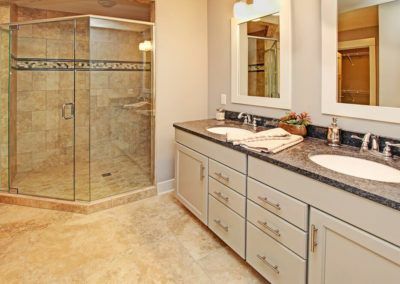 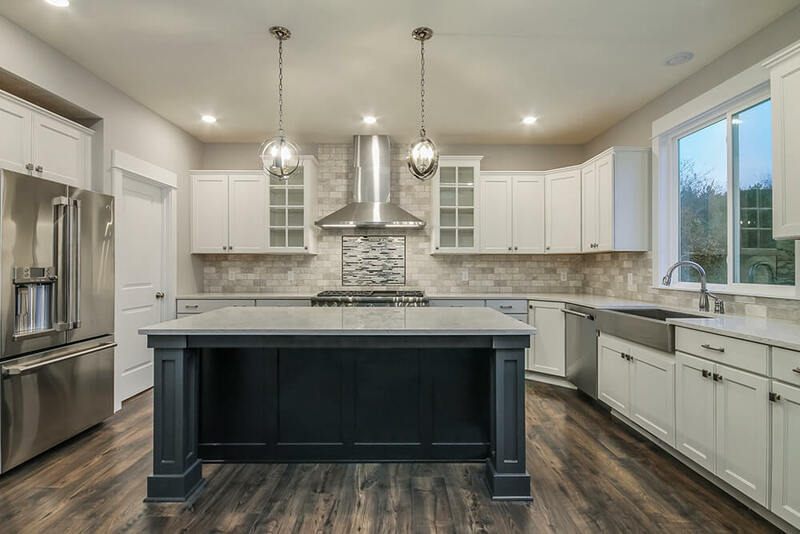 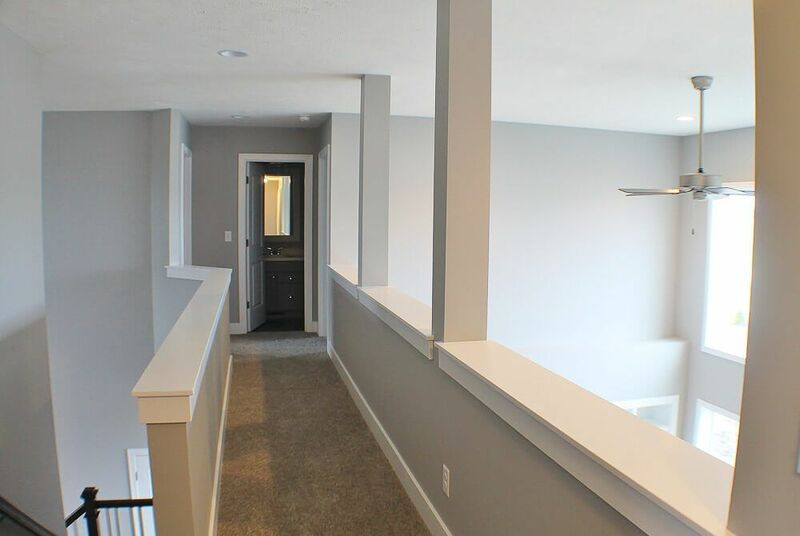 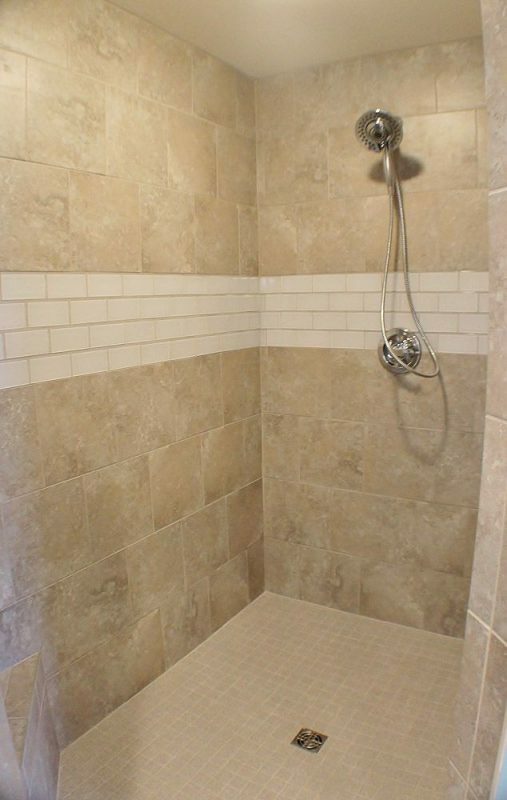 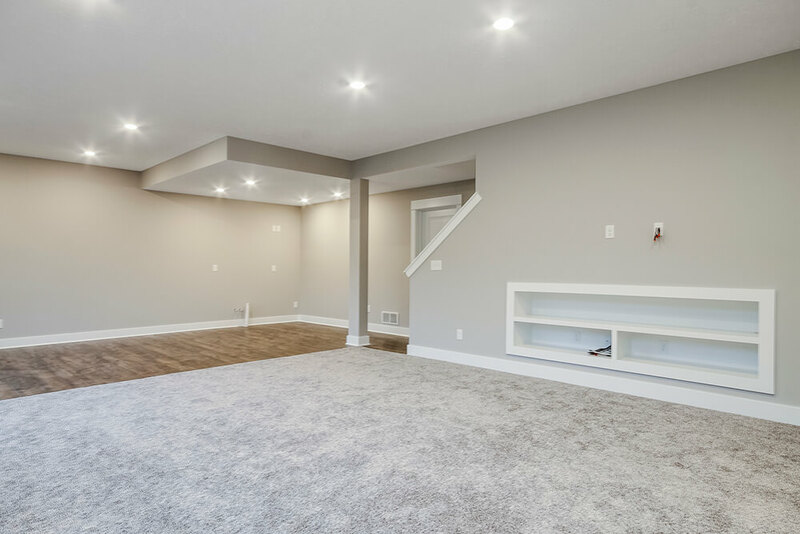 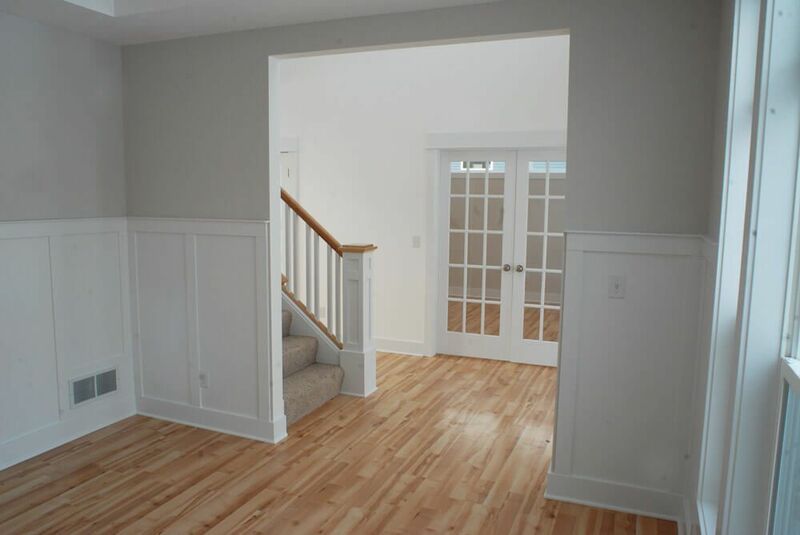 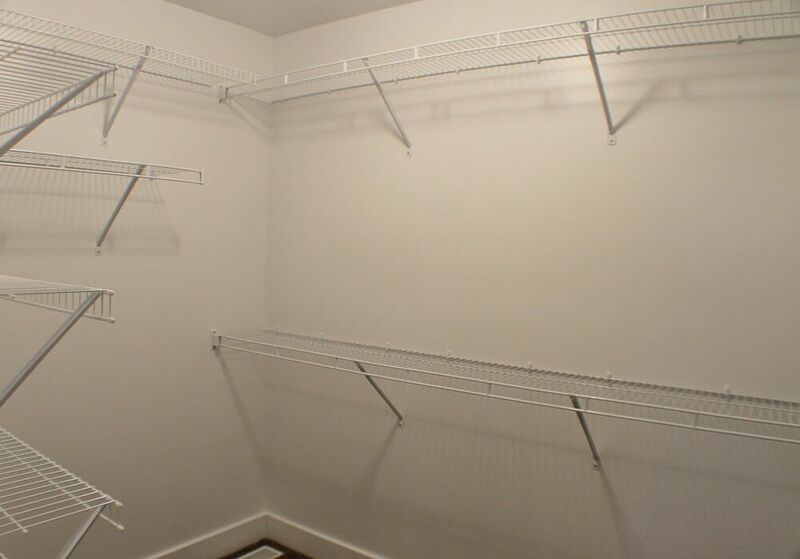 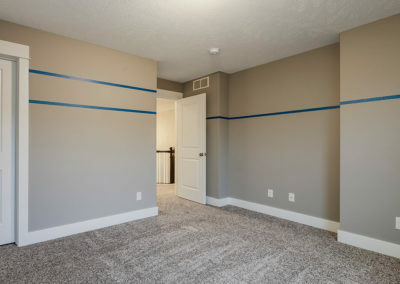 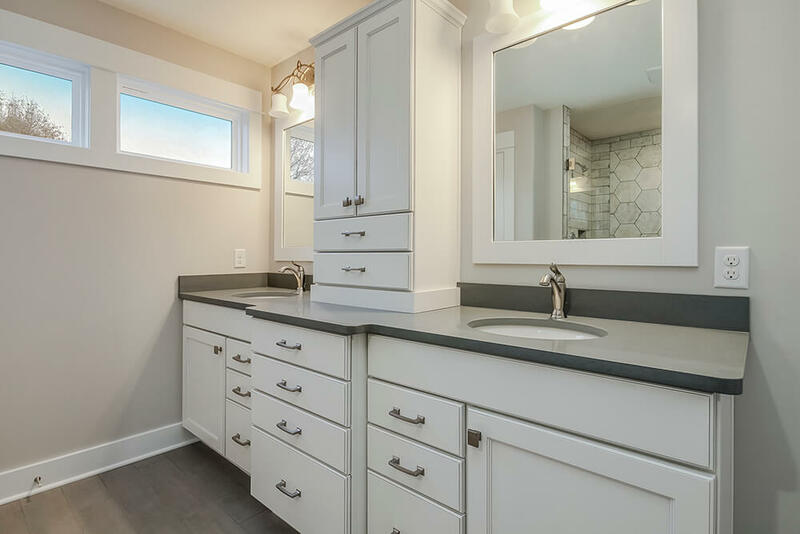 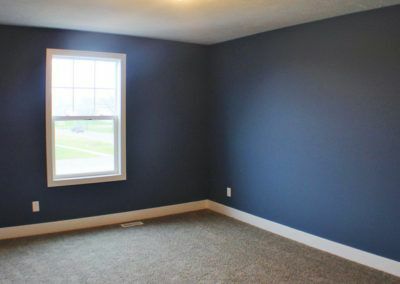 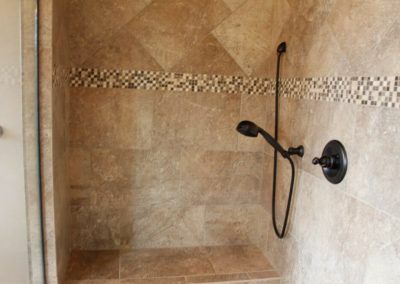 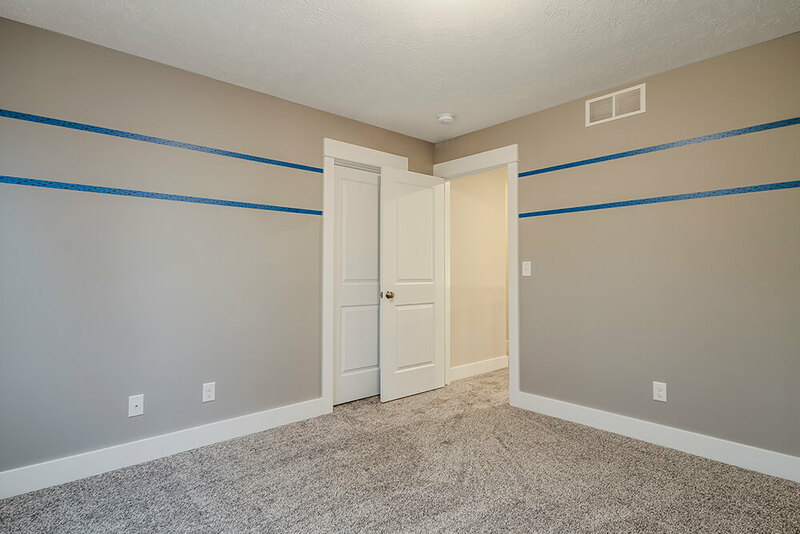 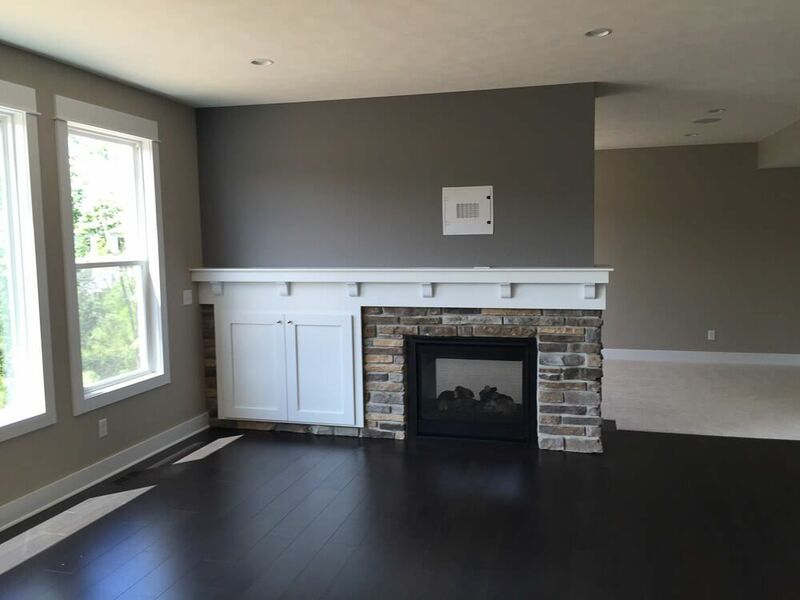 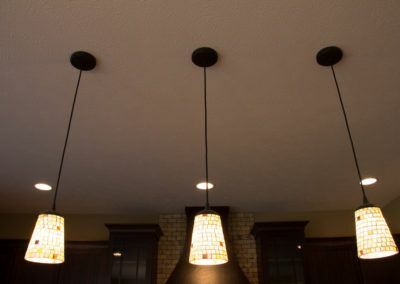 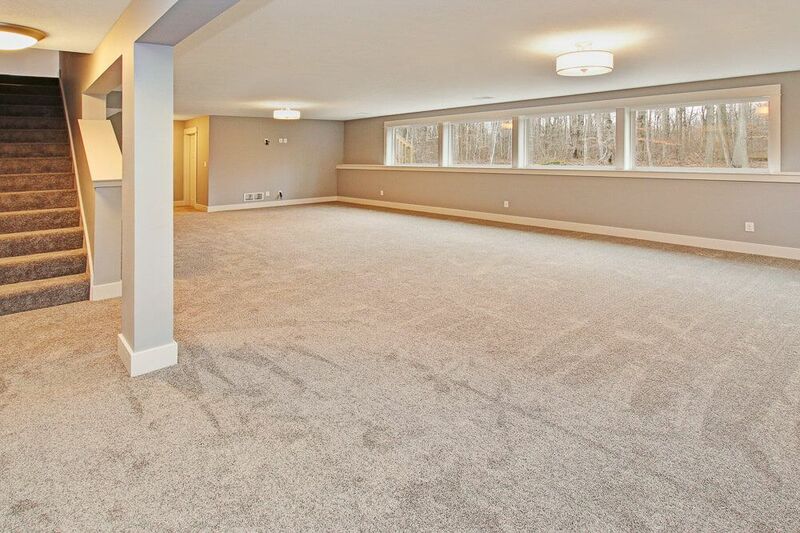 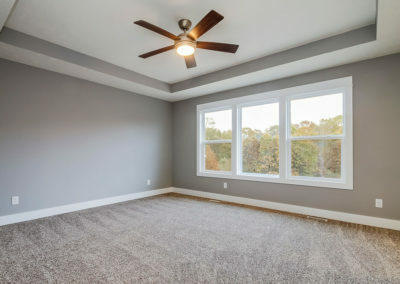 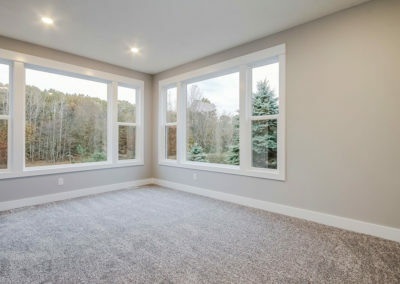 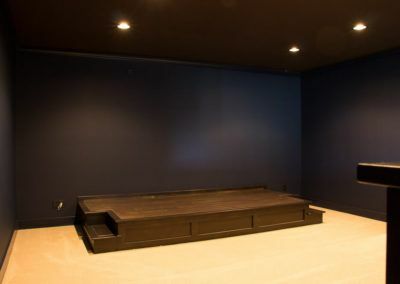 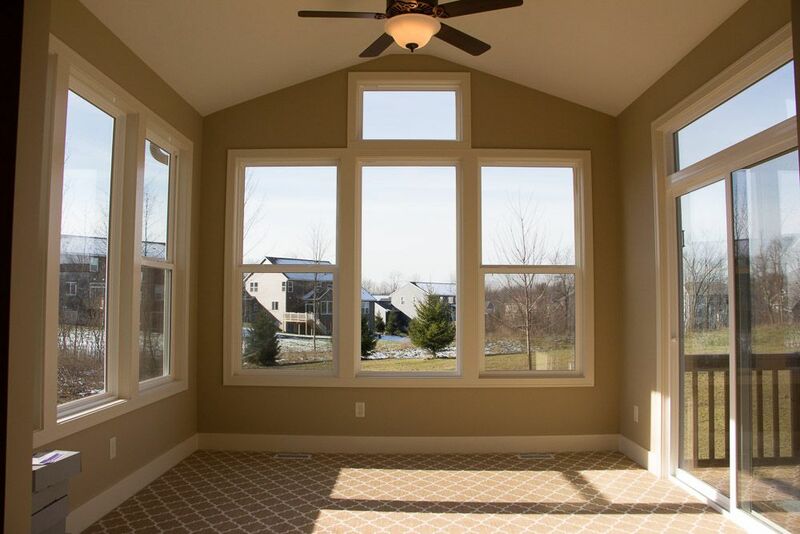 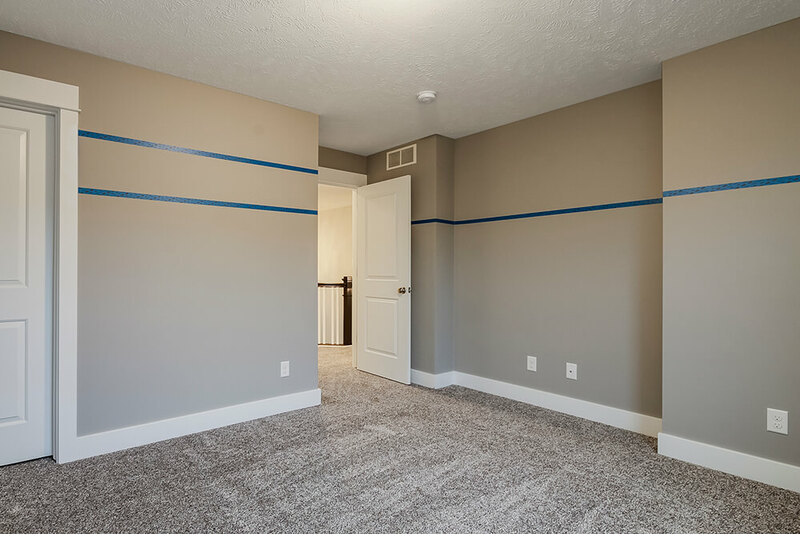 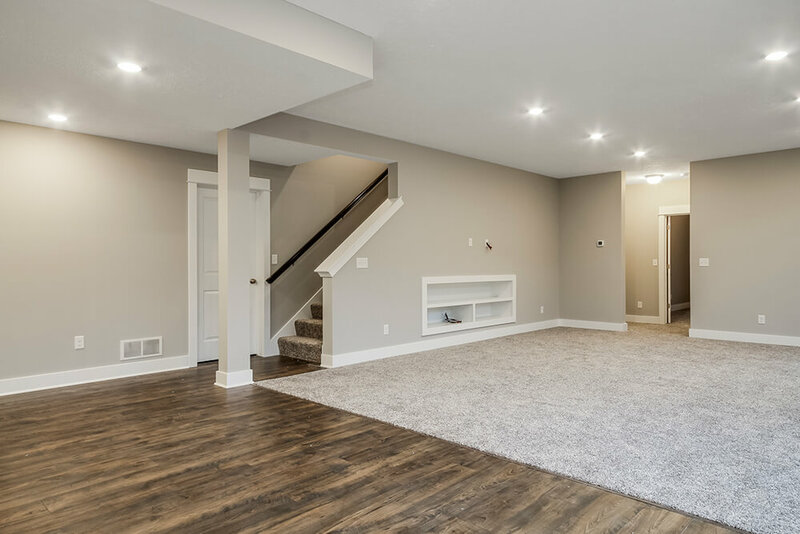 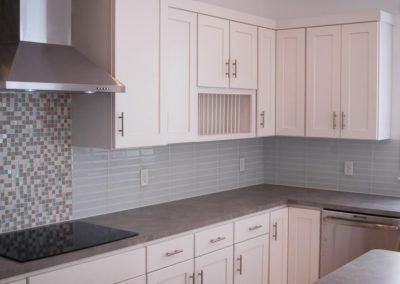 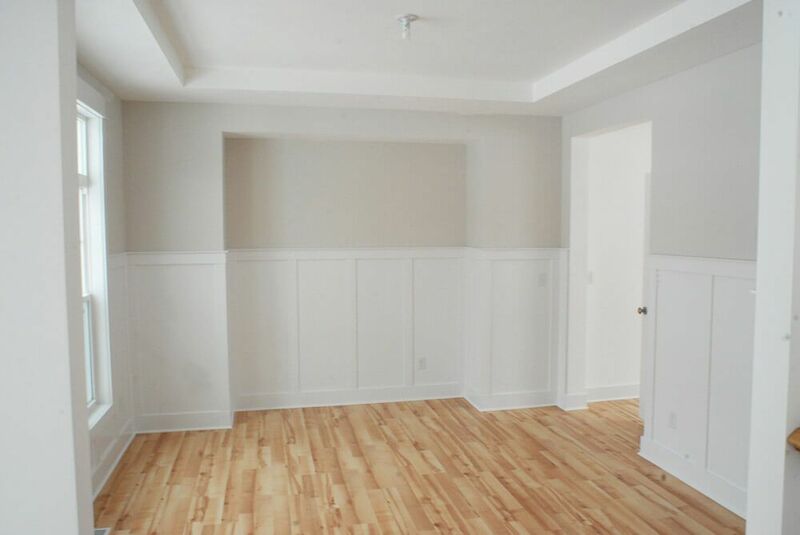 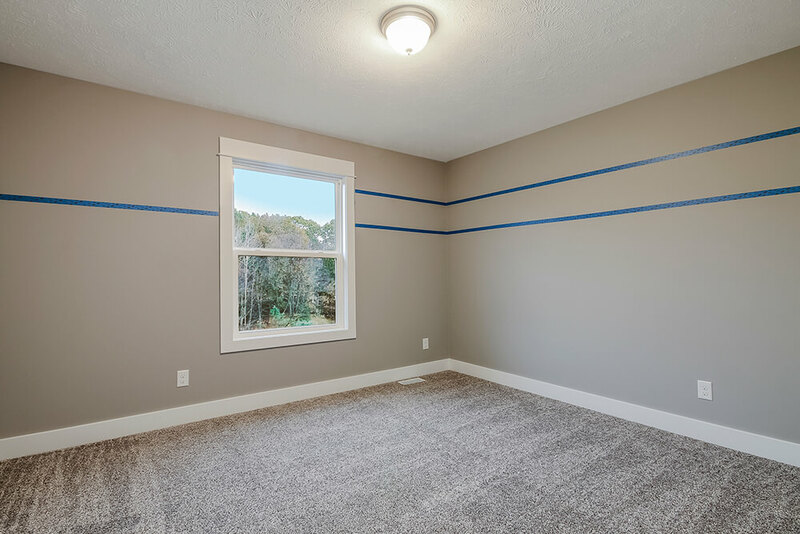 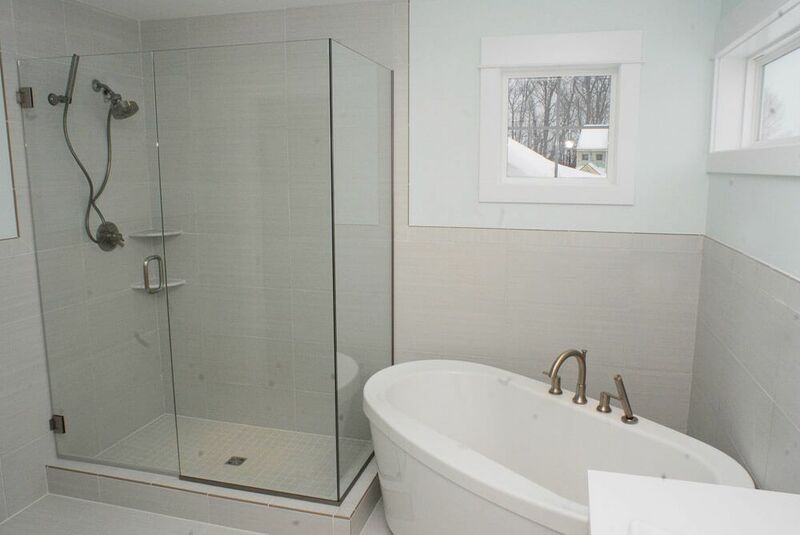 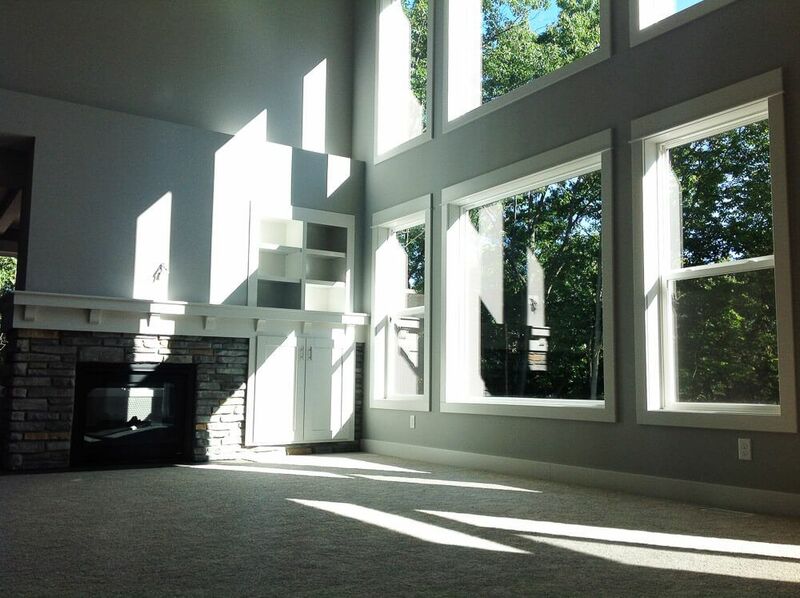 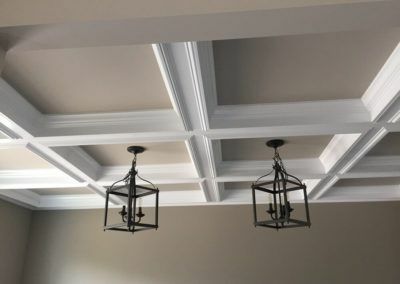 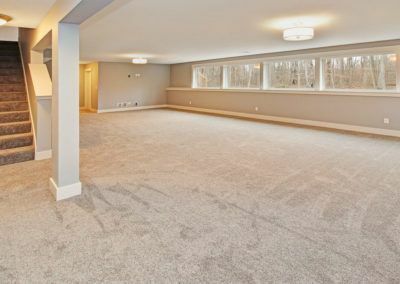 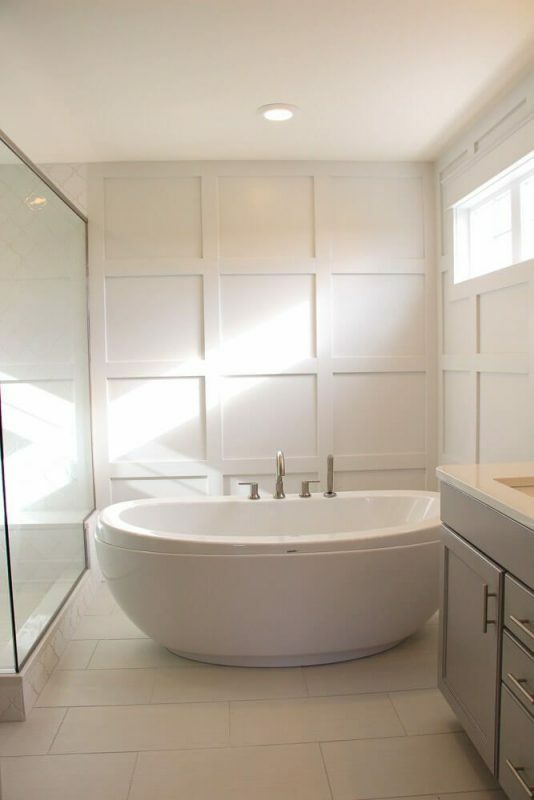 Depending on your needs, the lower level can be left to finish out at a later time, or can be finished during construction with additional living space, a bathroom, and, home site permitting, more bedrooms. 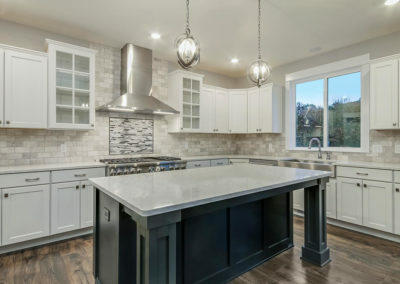 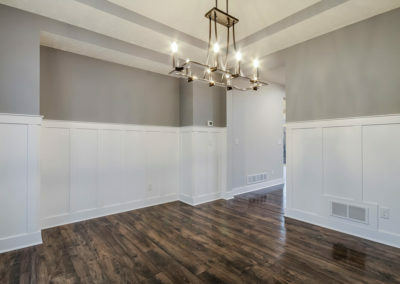 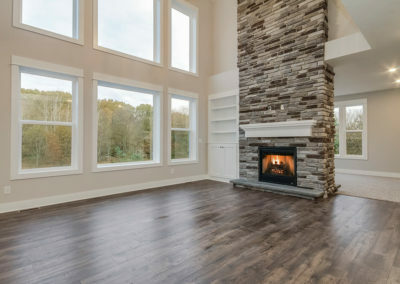 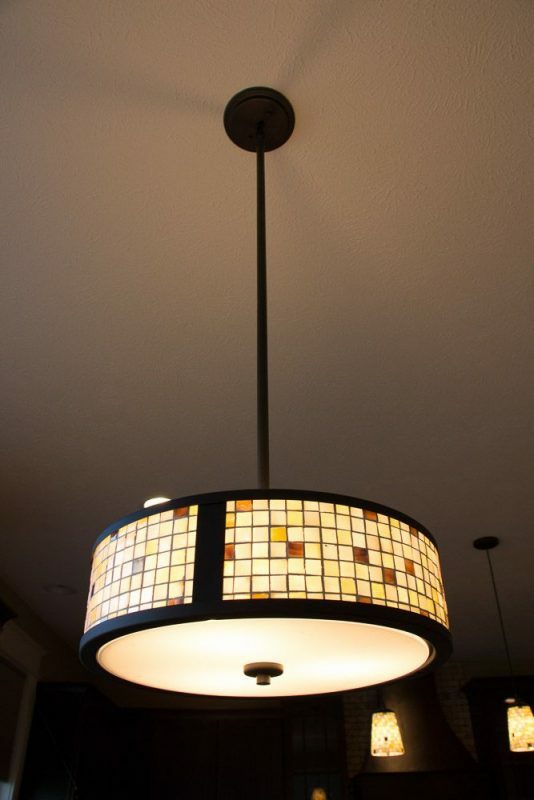 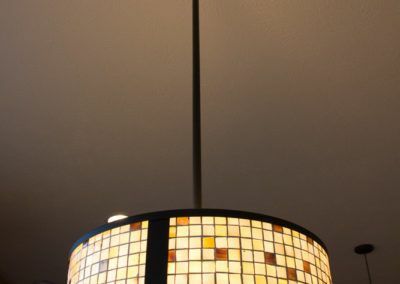 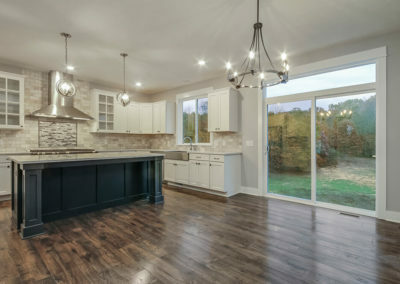 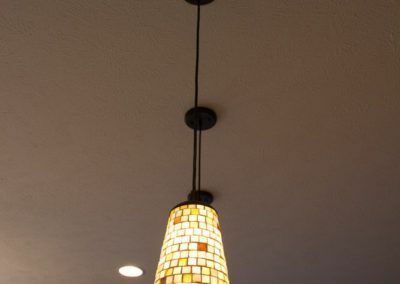 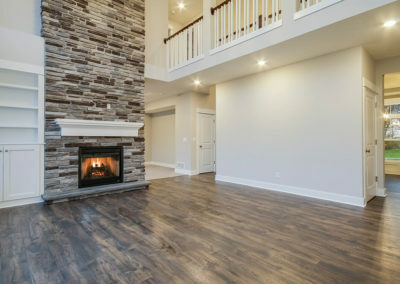 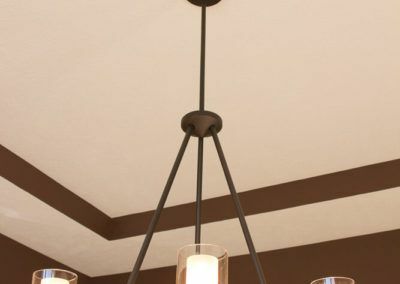 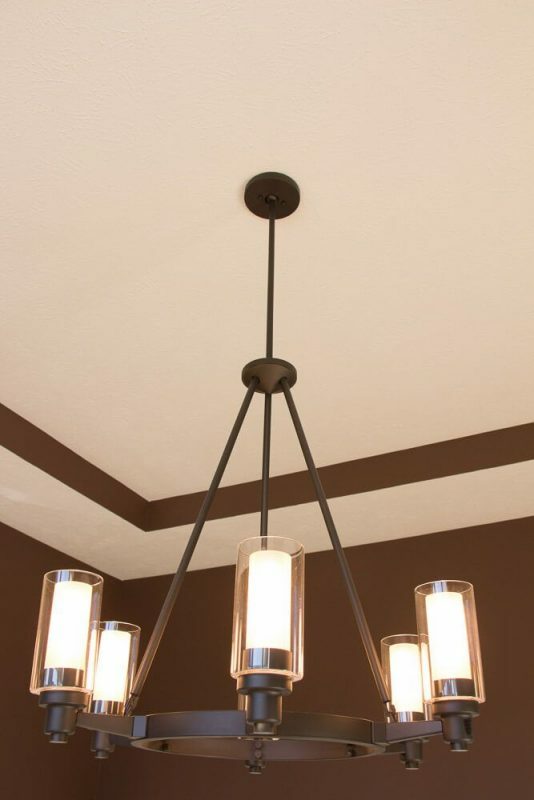 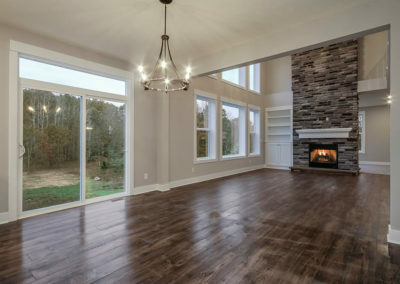 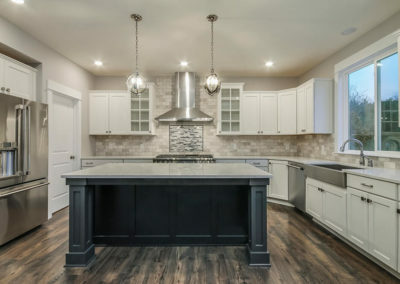 Eastbrook takes pride in designing and building homes with exceptional aesthetics, materials, techniques, and energy efficiency. 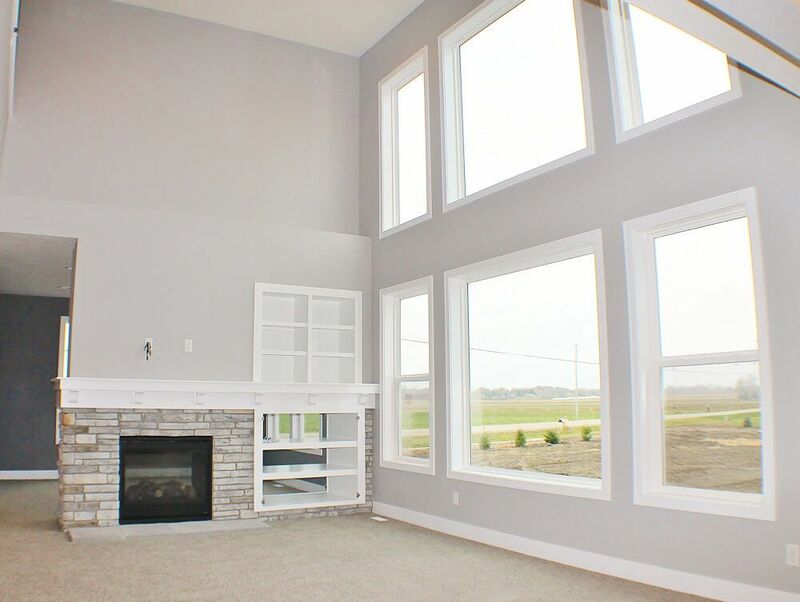 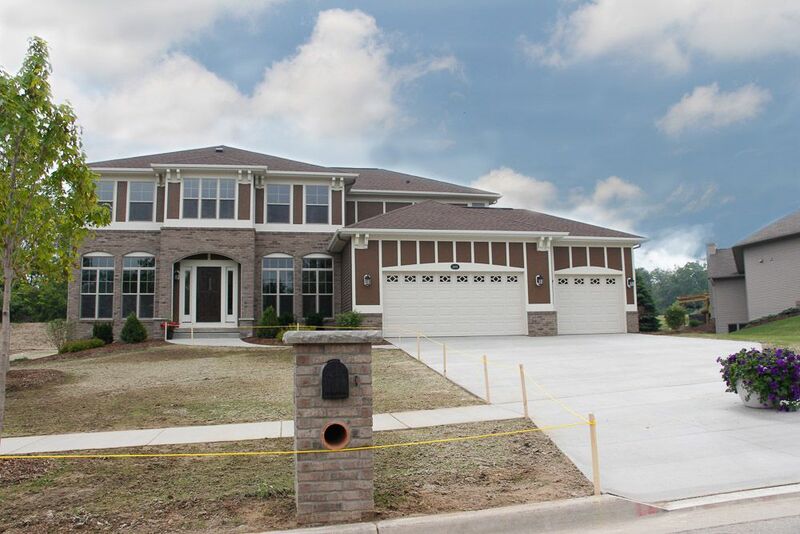 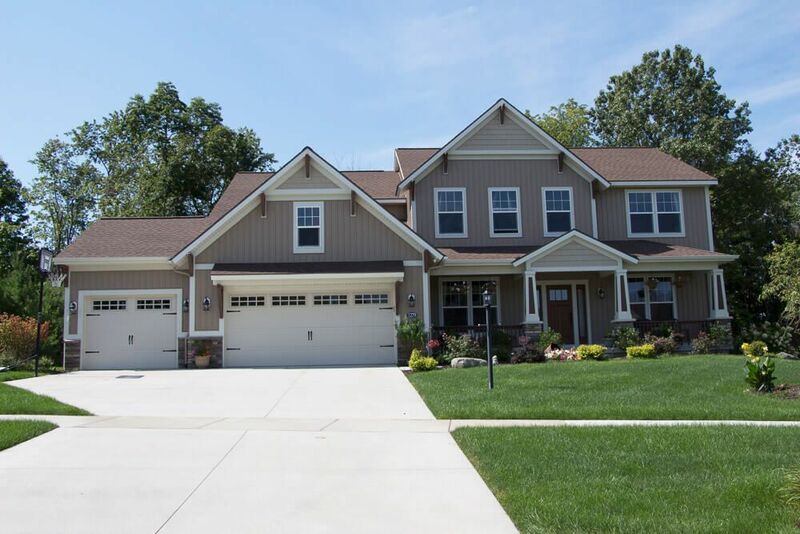 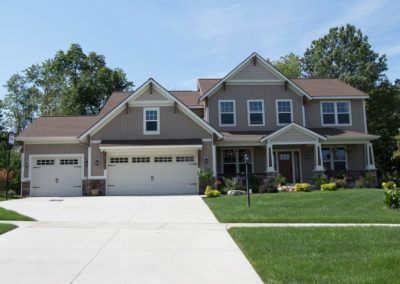 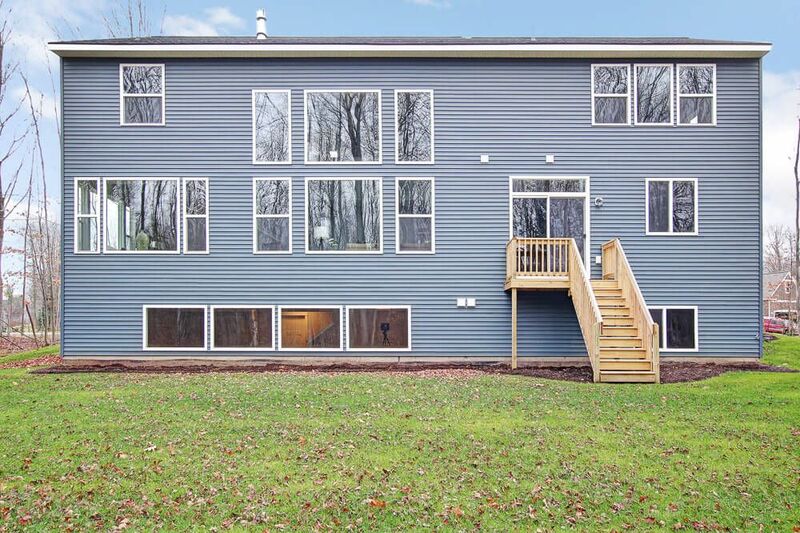 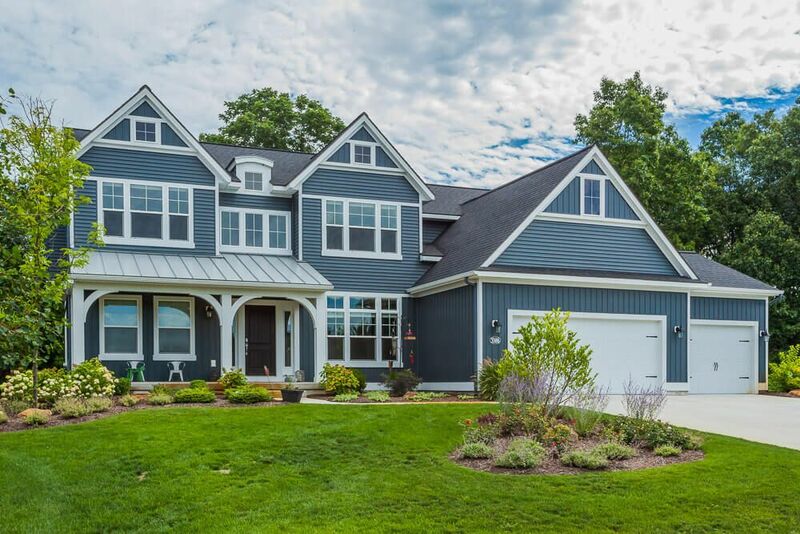 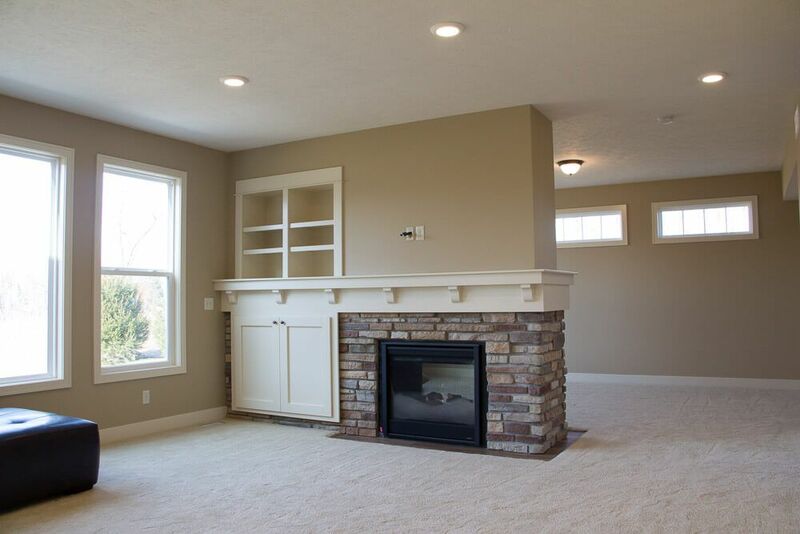 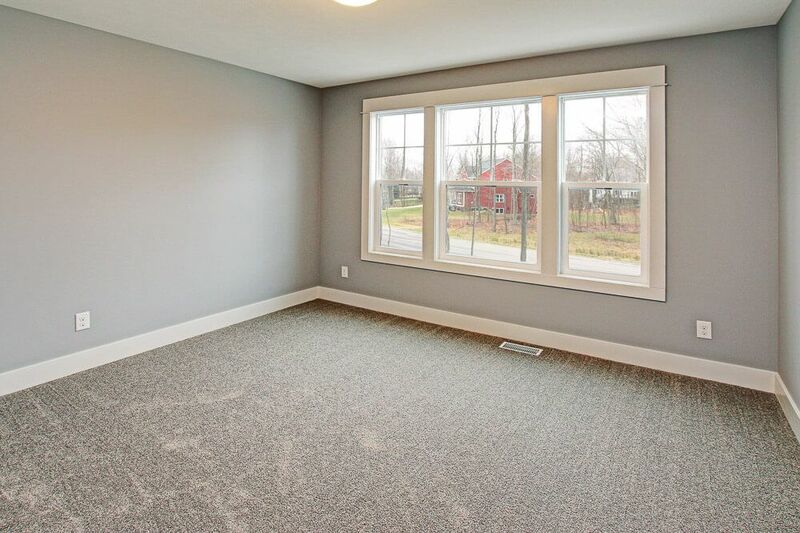 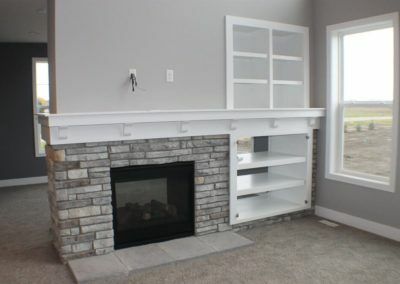 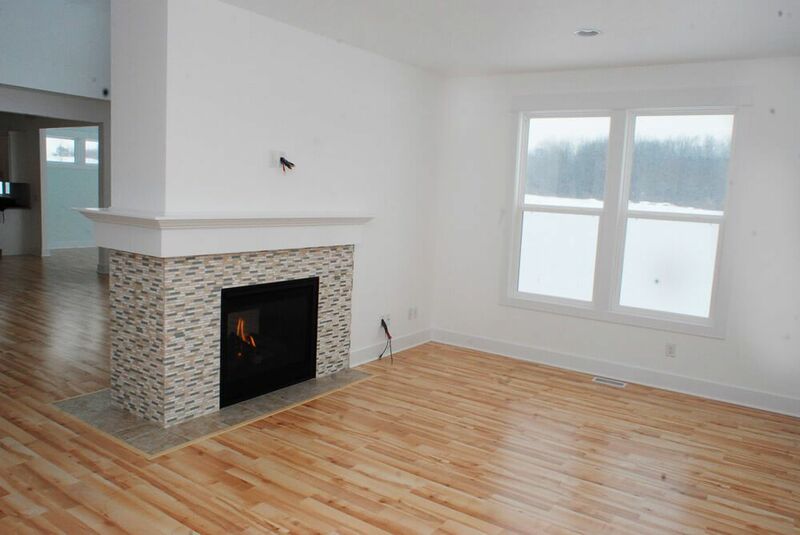 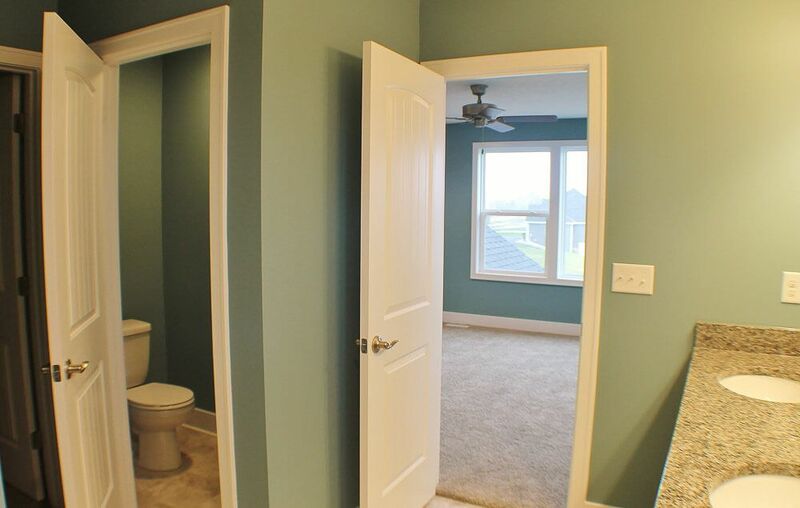 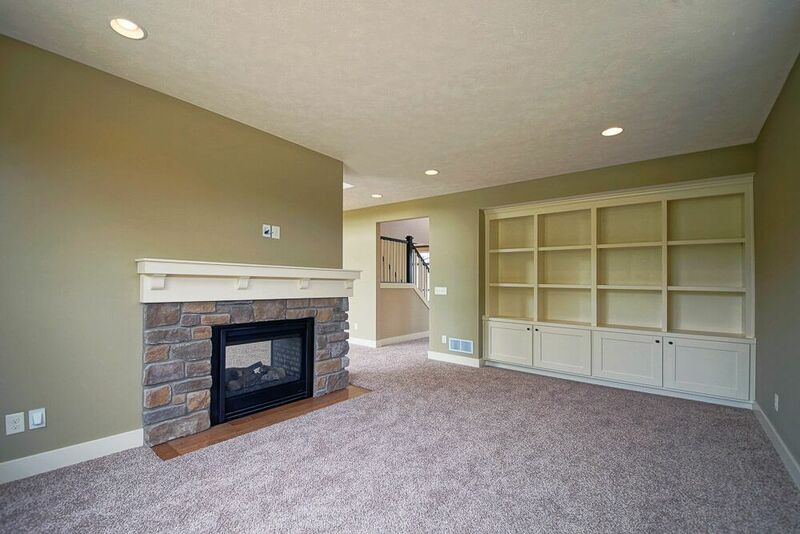 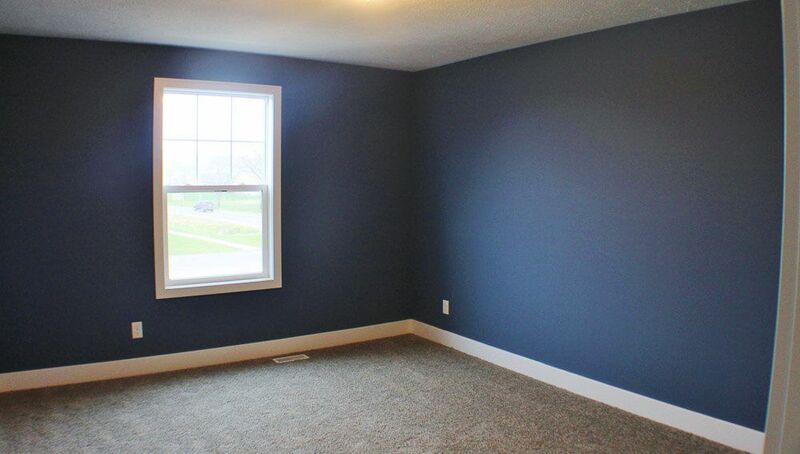 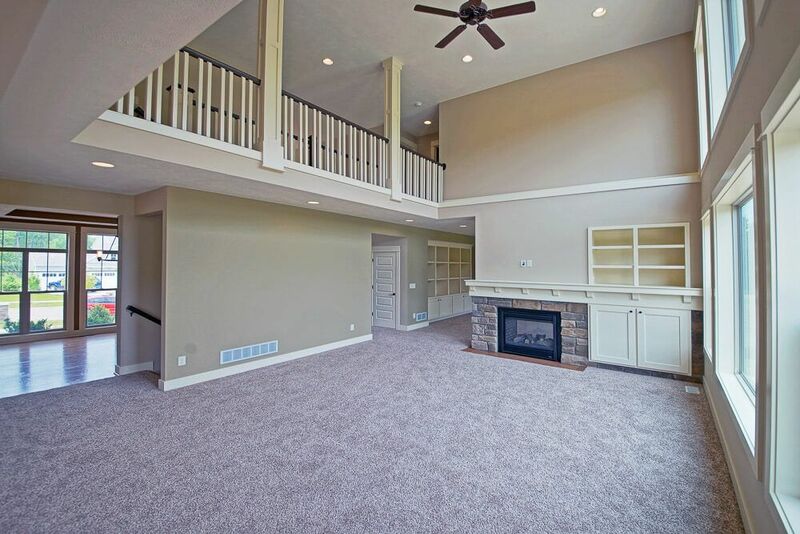 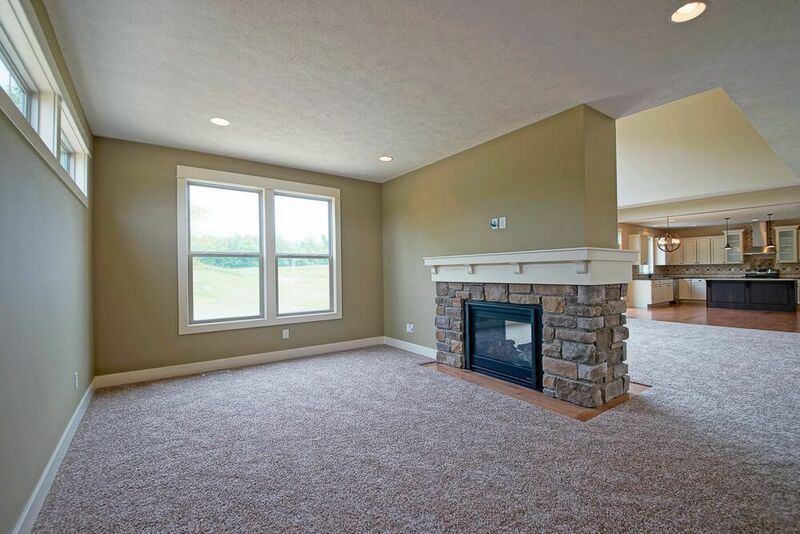 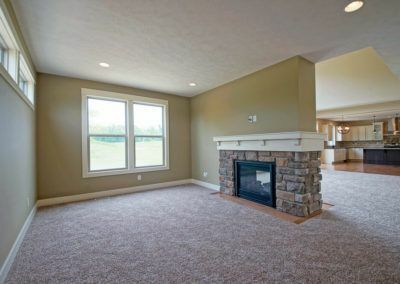 Your new Jamestown house is sure to quickly become a beloved family home.